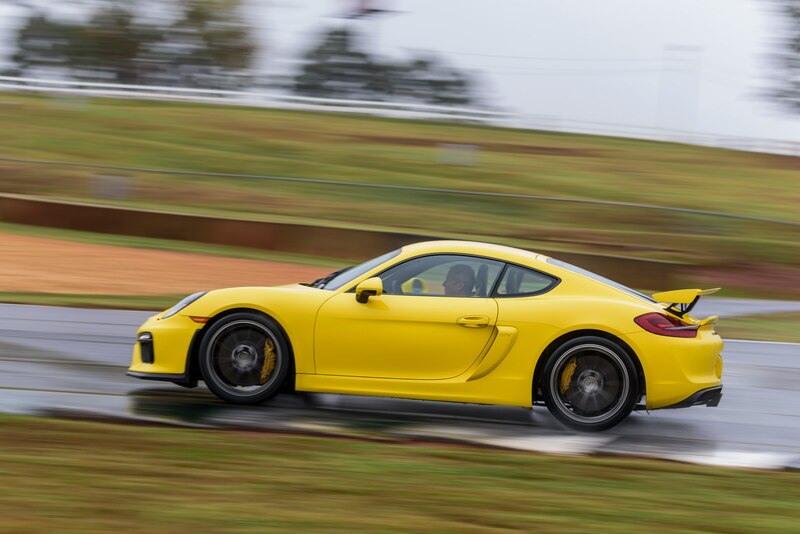 Braselton, Georgia — Porsche has roared down the road not taken ever since 1948, when the company opened for business with an iconoclastic sports car featuring an air-cooled flat-four engine mounted behind the rear axle. 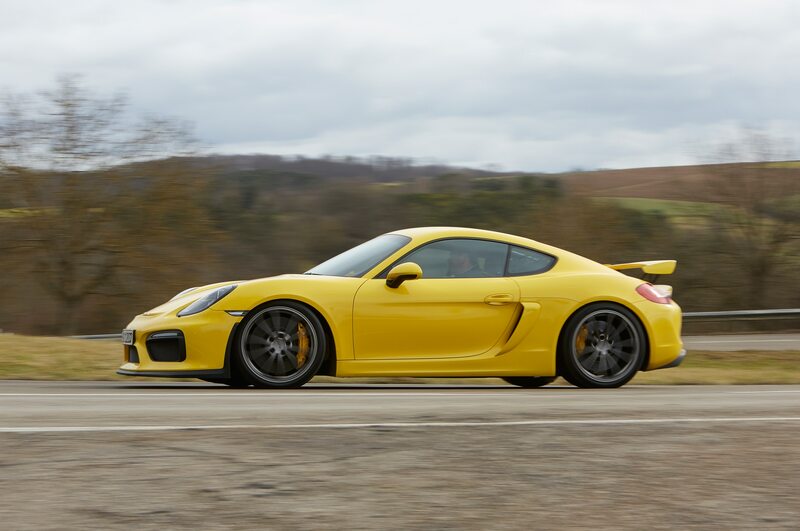 With its two latest additions, the Cayman GT4 and 911 GT3 RS, Porsche continues to go its own way — at a very, very rapid clip. 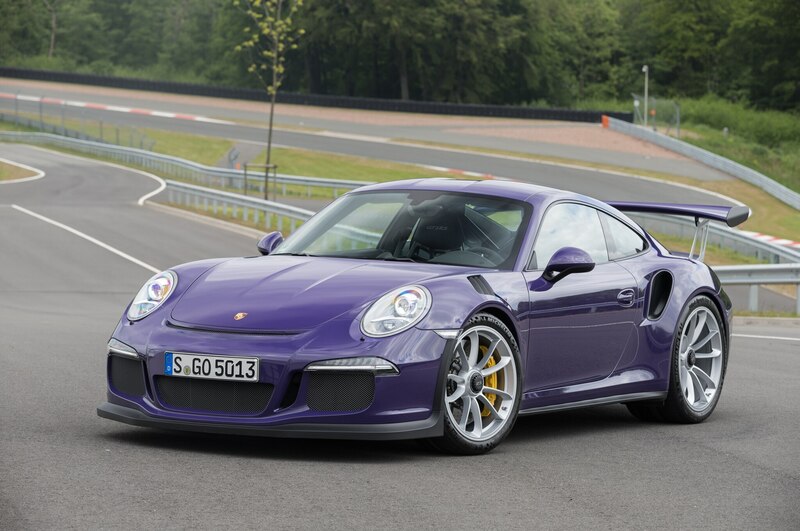 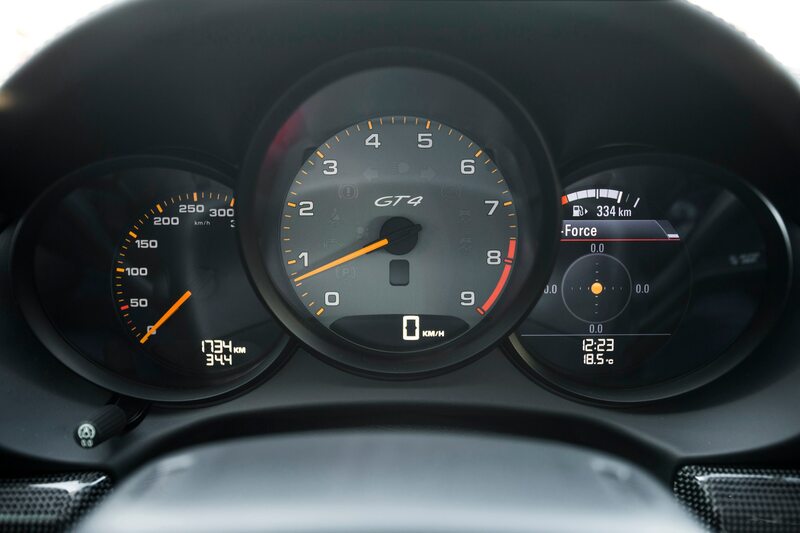 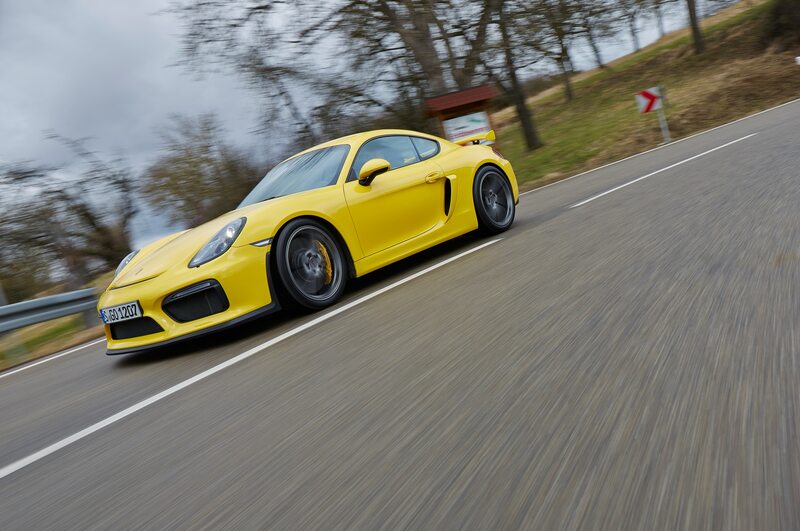 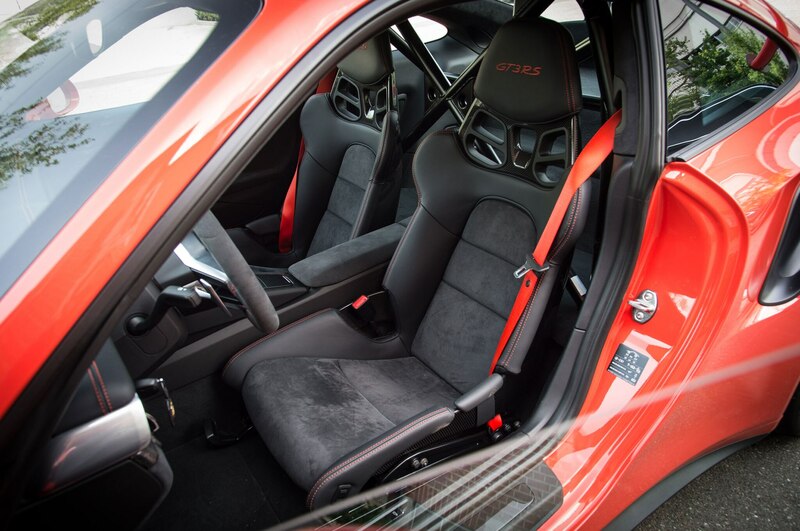 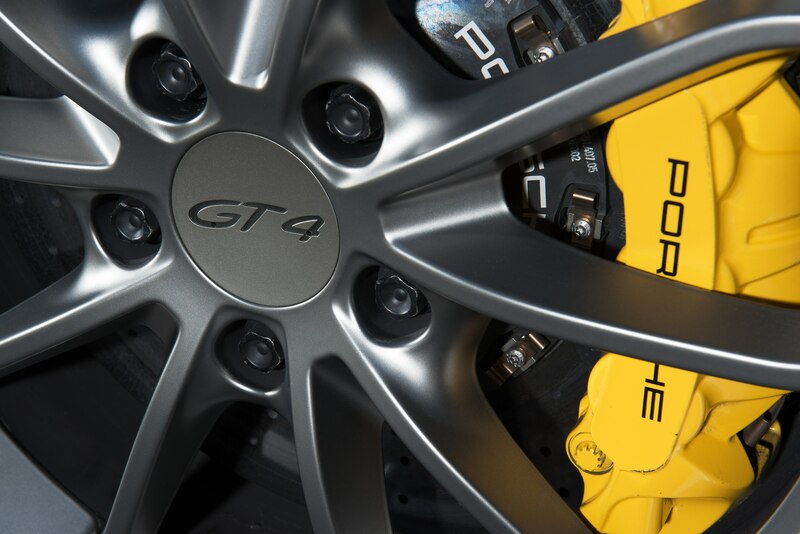 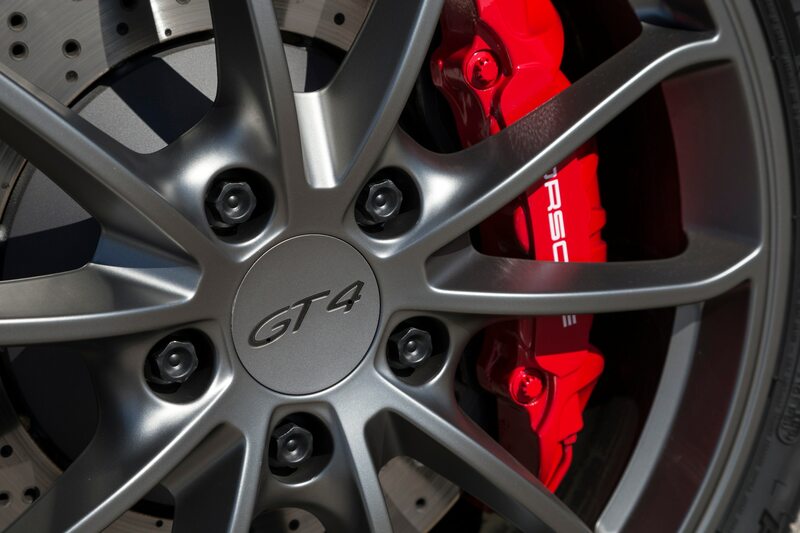 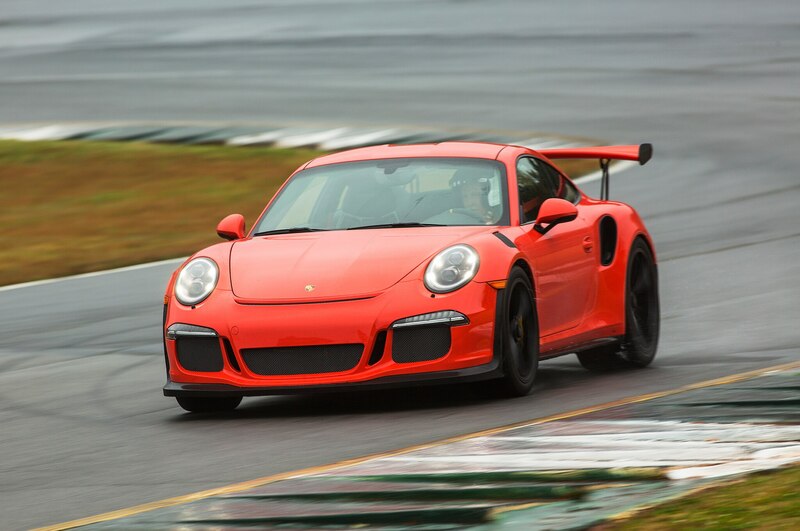 Just as the GT4 is the ultimate version of the Cayman, the GT3 RS is the apotheosis of the road-going 911 lineup. 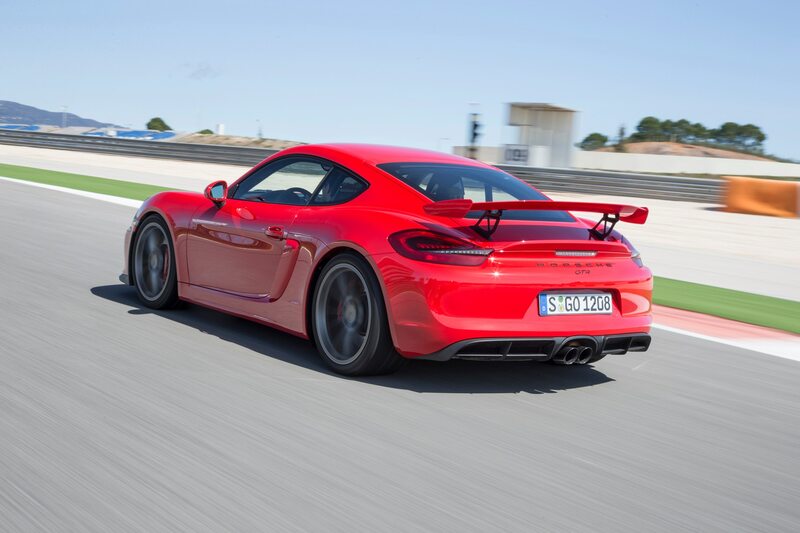 But unlike the GT4, it’s built solely for speed, defined not as 0-to-60 numbers or terminal velocity but lap times on racetracks. 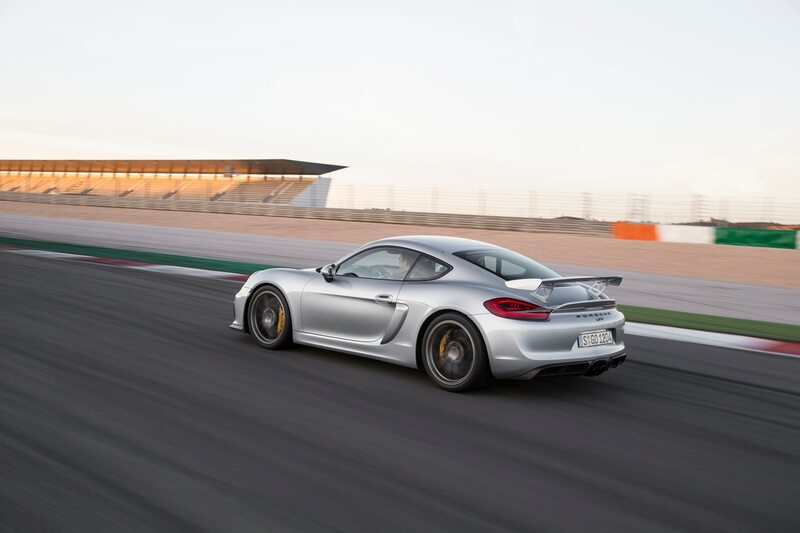 So Porsche chose not to follow its rivals down the path of turbocharging and supercharging, opting instead for a naturally aspirated engine that makes “only” 500 horsepower. 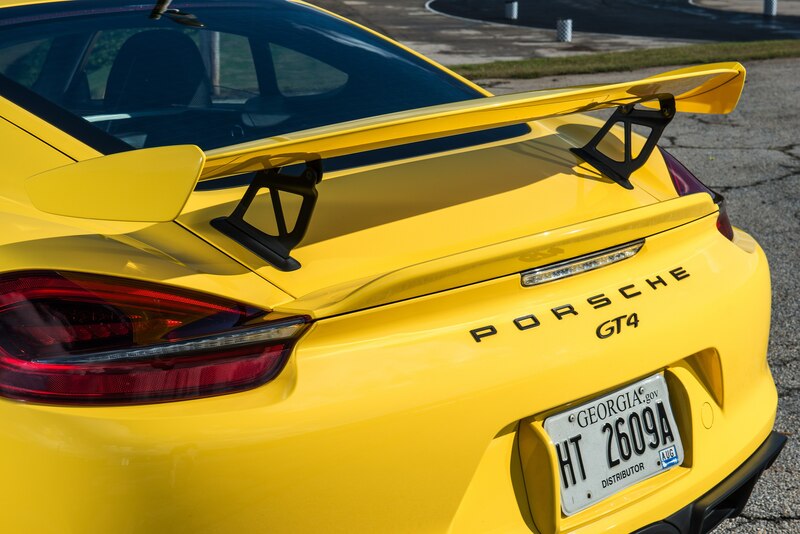 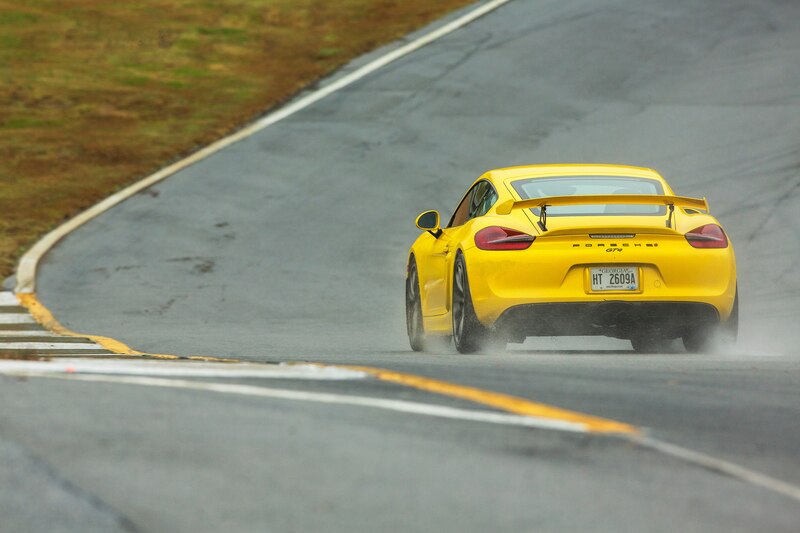 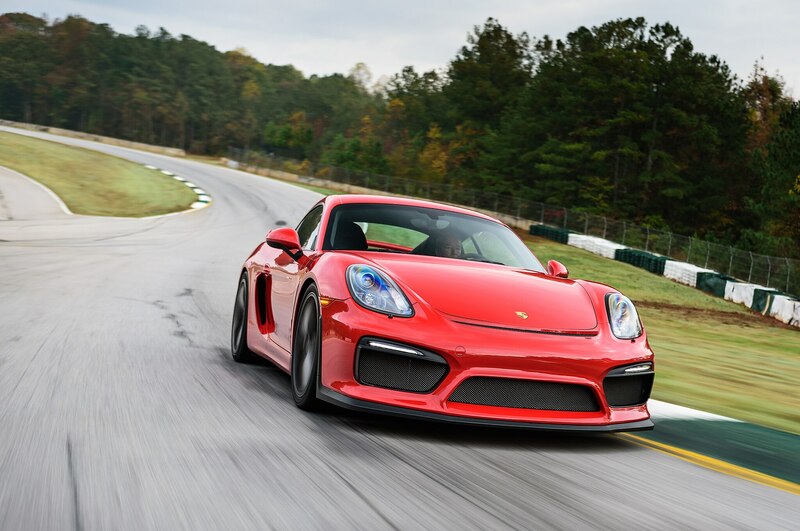 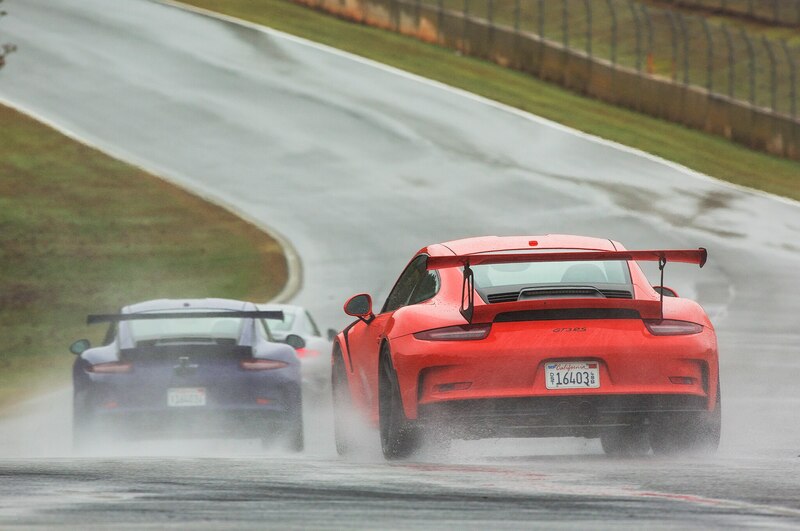 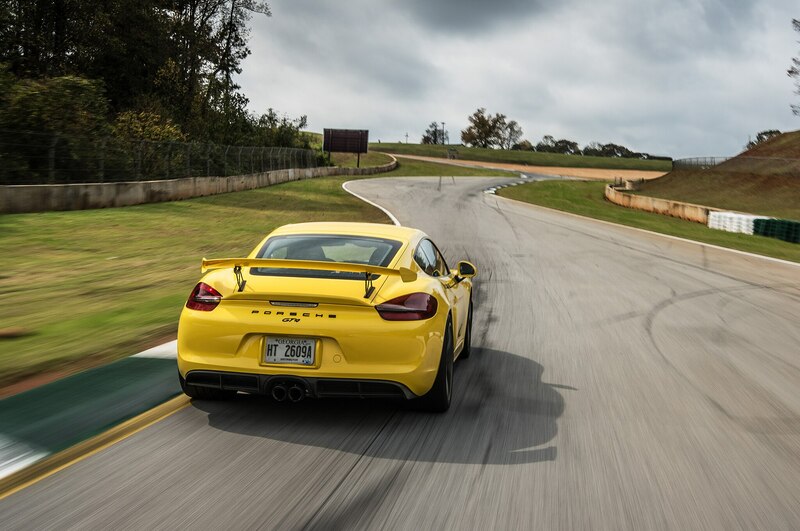 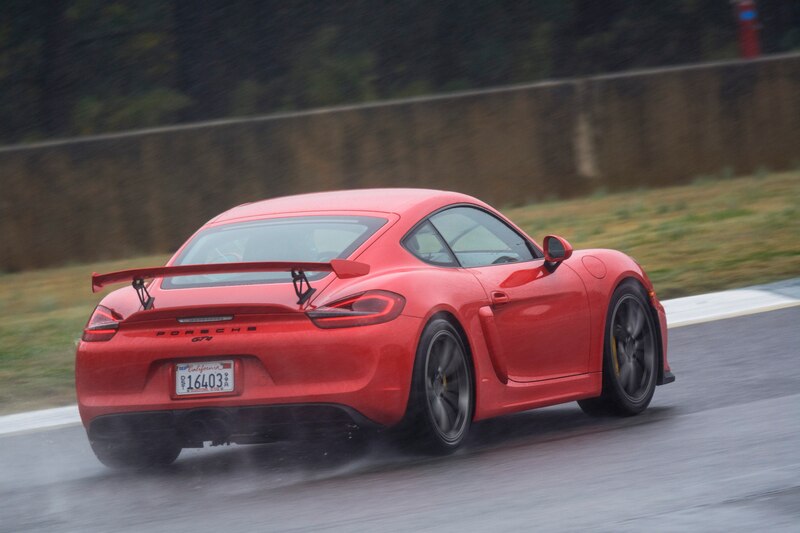 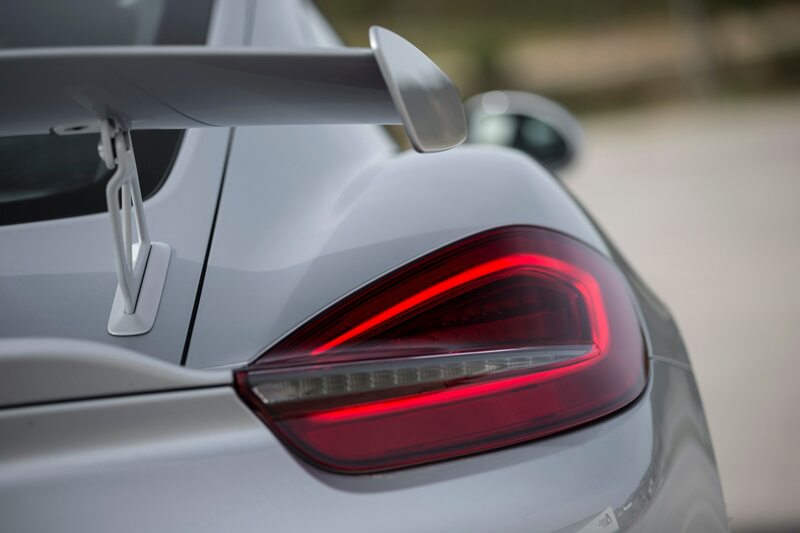 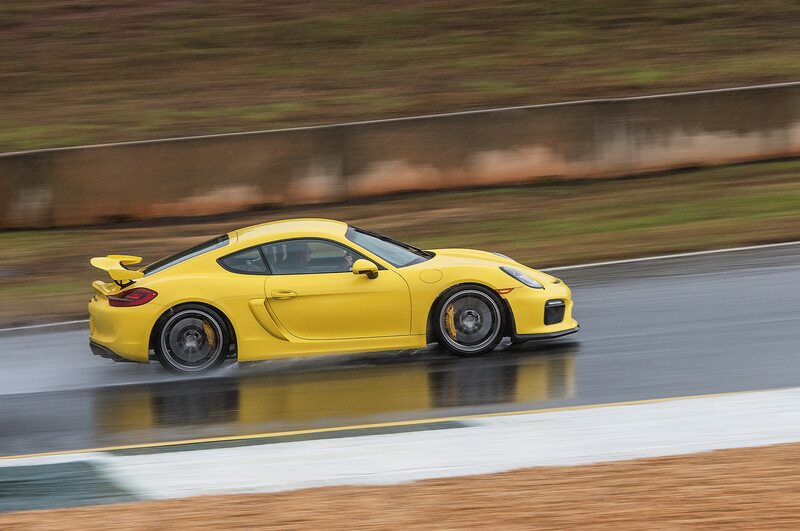 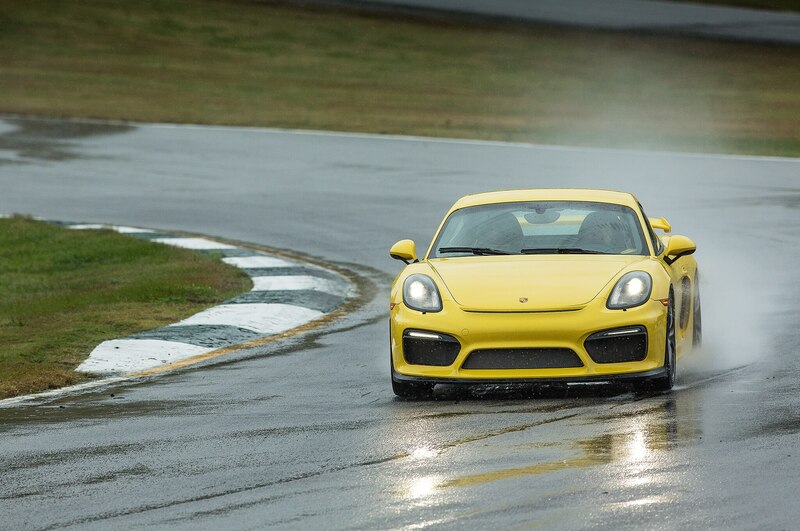 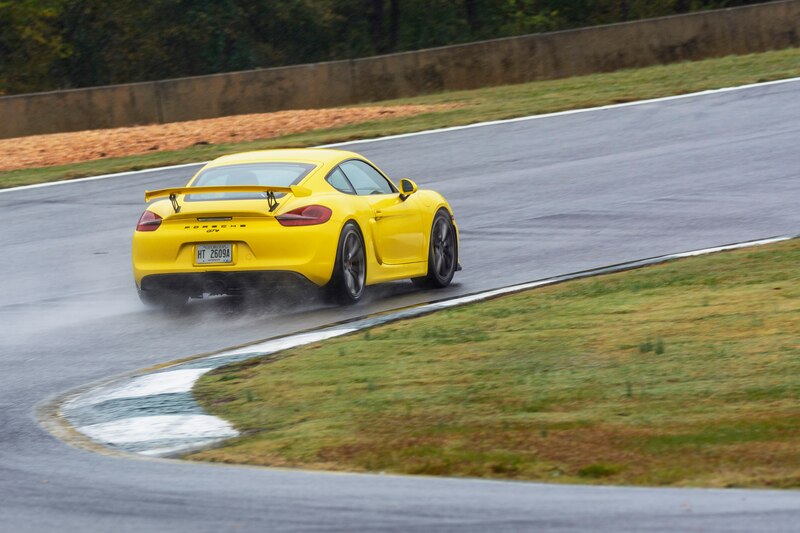 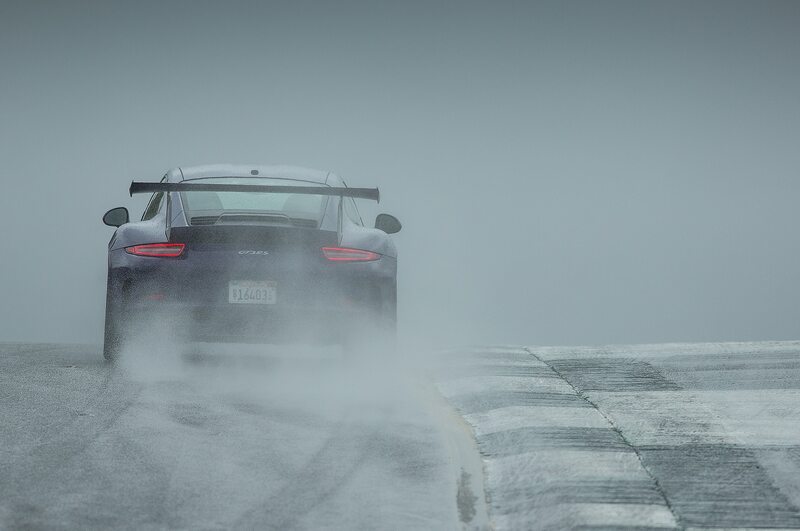 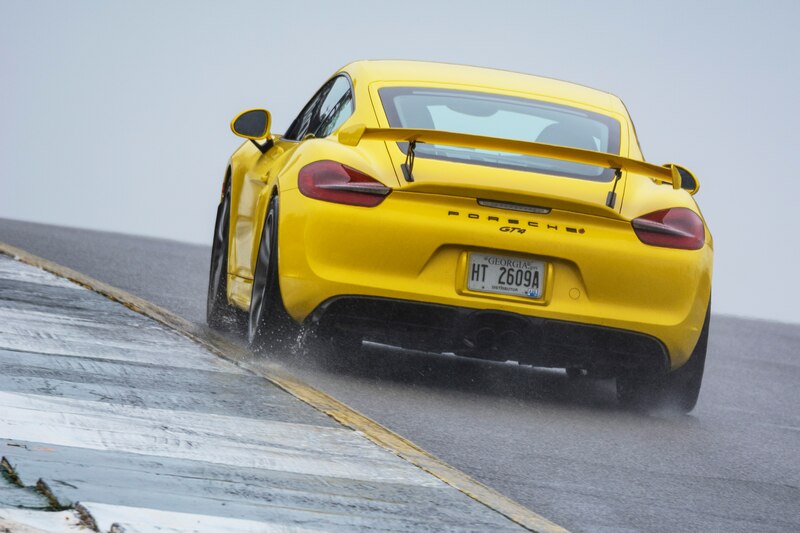 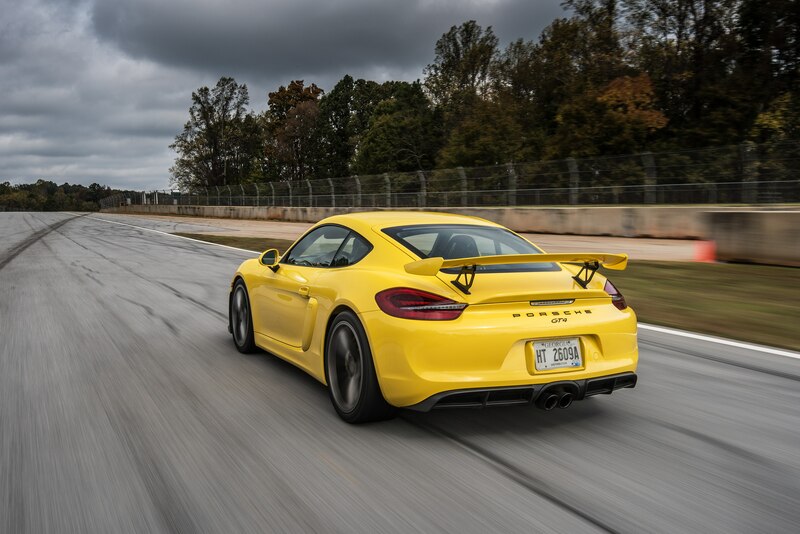 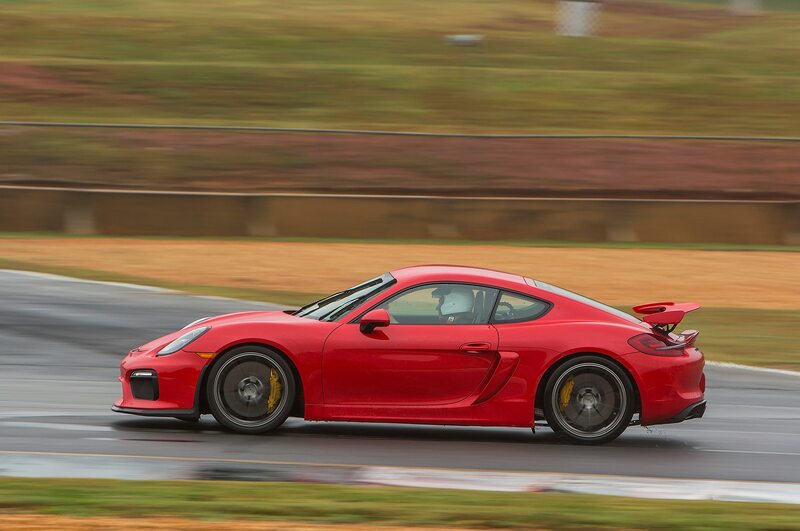 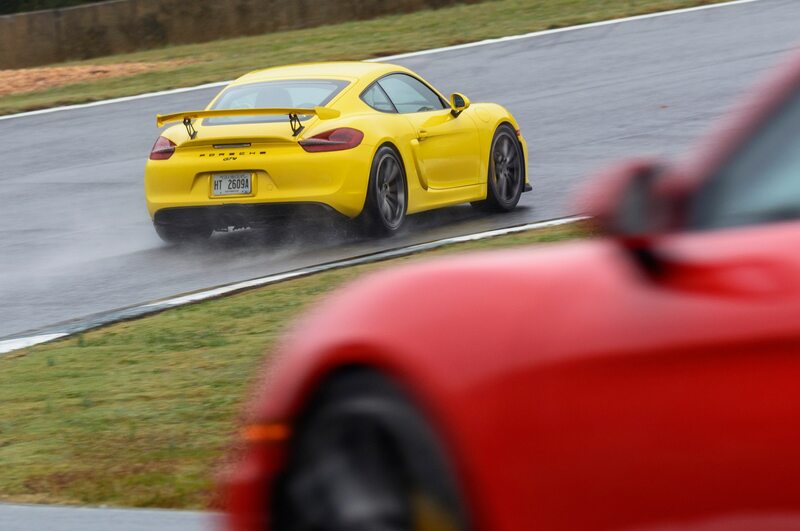 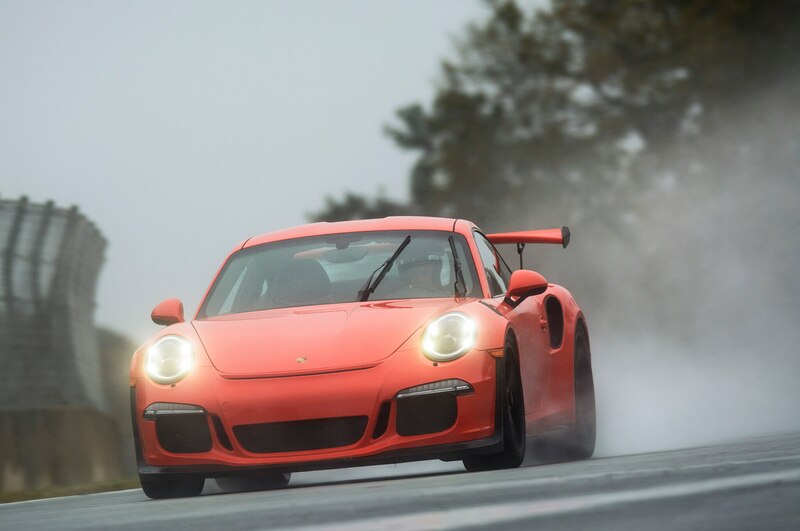 To showcase its latest creations, Porsche recently sent a GT3 RS and Cayman GT4 to Road Atlanta, arguably the most challenging road course in the United States. 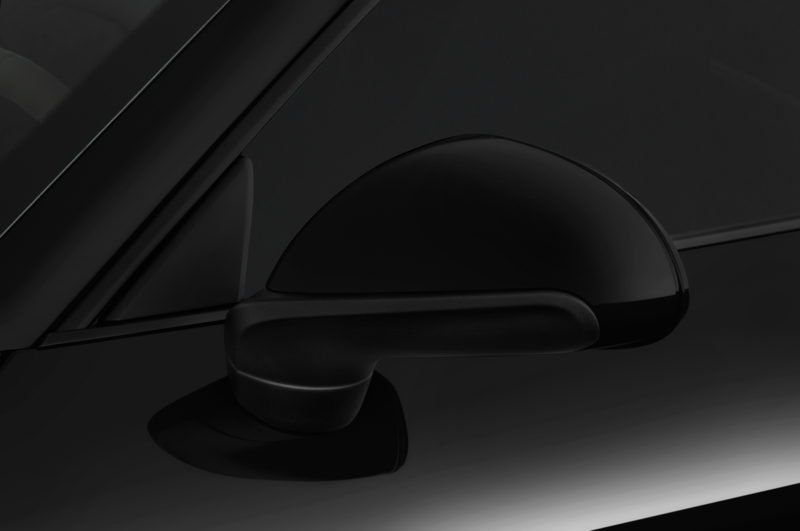 Too challenging, as it turned out. 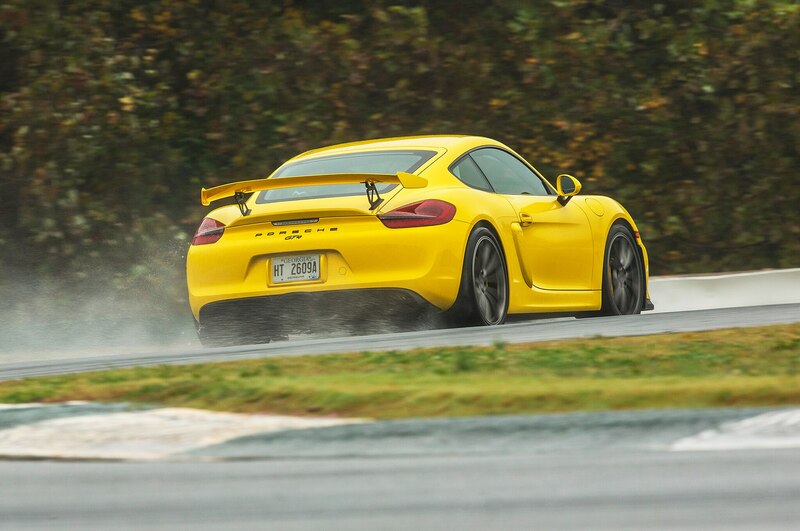 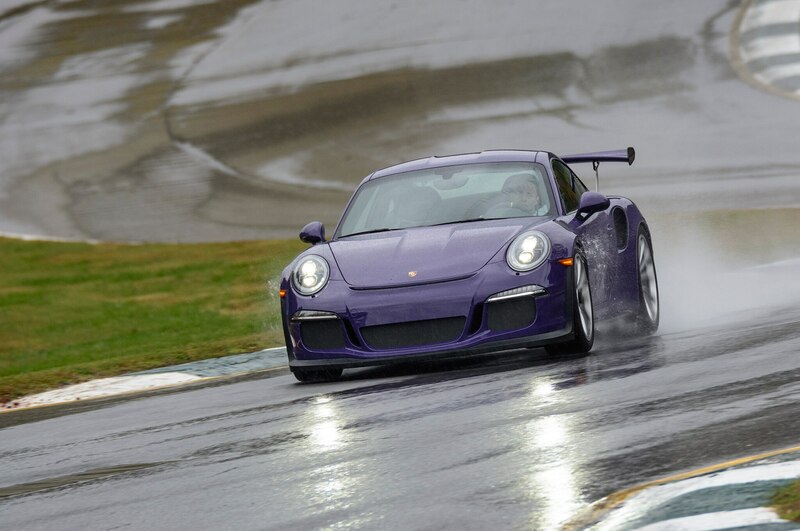 Thanks to remnants of the storm system that produced Hurricane Patricia, rain fell during the test session, and unseasonably cool weather prevented the Michelin Pilot Sport Cup 2s on both cars from getting up to proper operating temperatures. 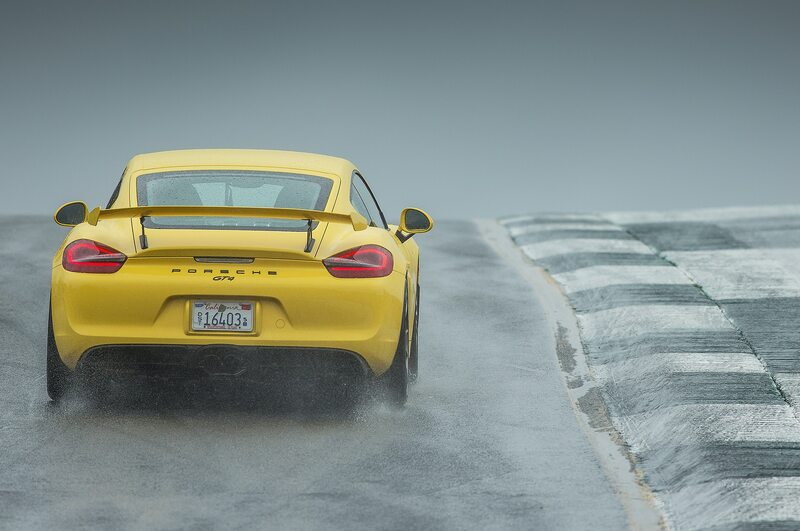 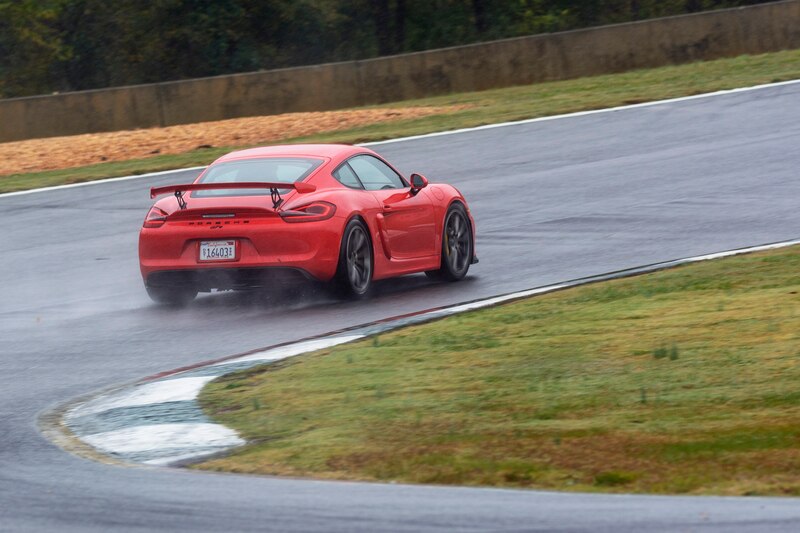 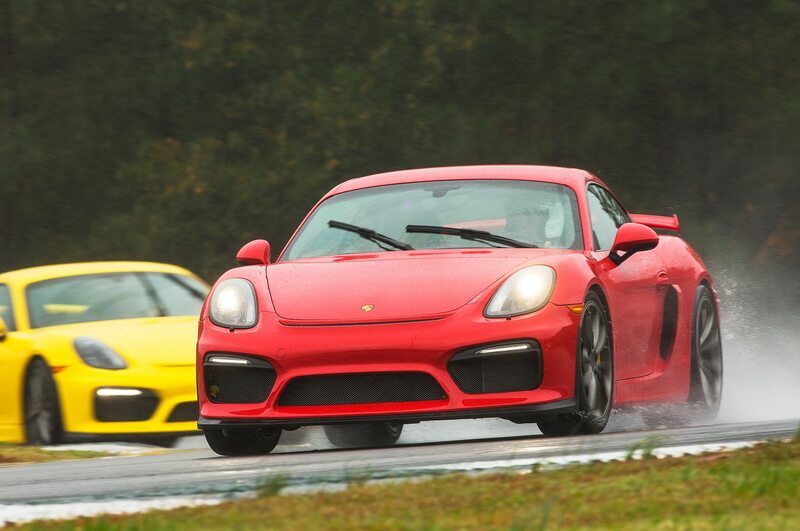 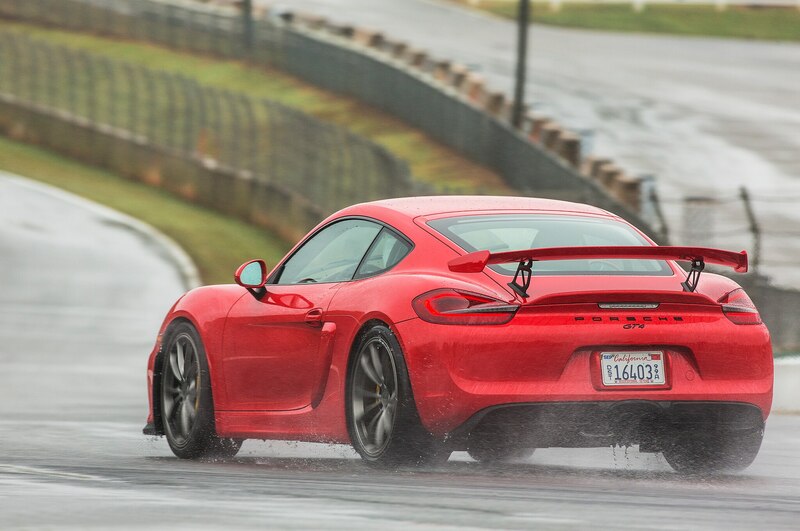 The Cayman was diabolical on the cold, slick surface. 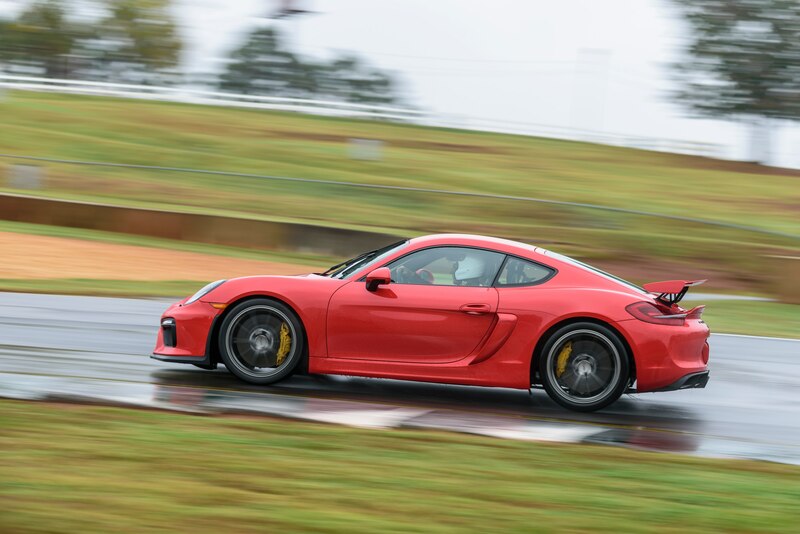 Virtually any application of throttle with the steering-lock applied caused the rear end to step out, and the first time the Porsche Stability Management (PSM) system detected the car drifting mid-corner, it kicked in so violently that I initially thought something had broken. 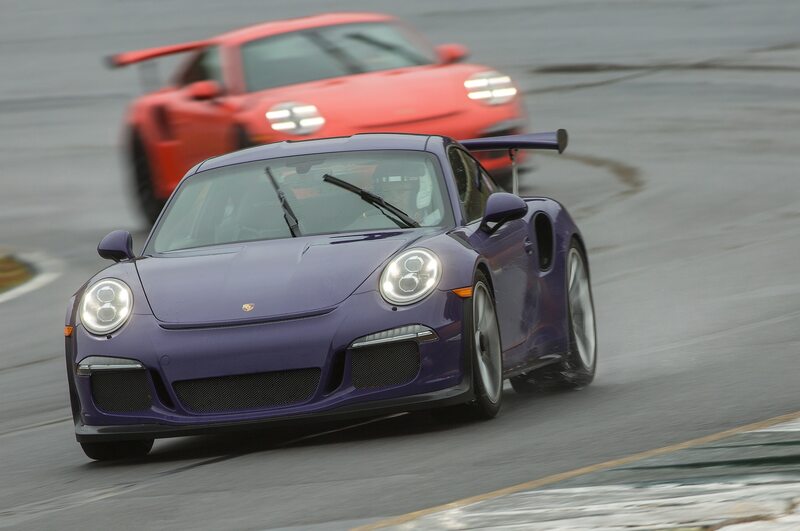 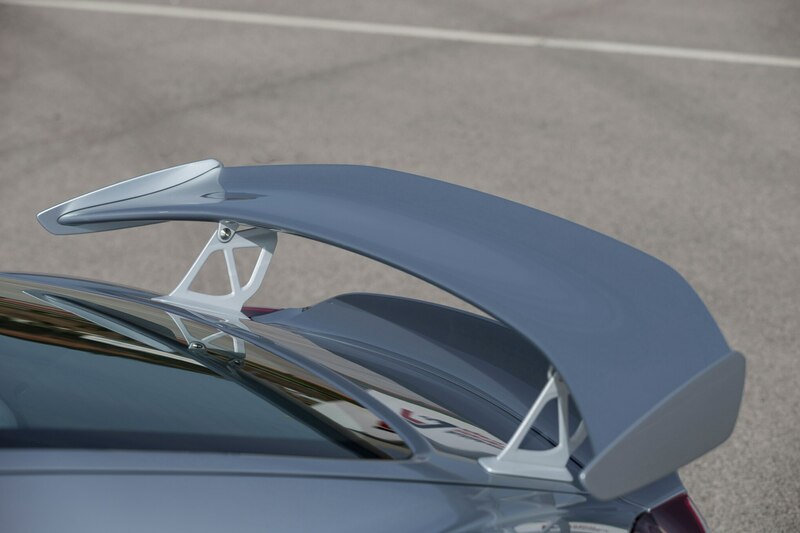 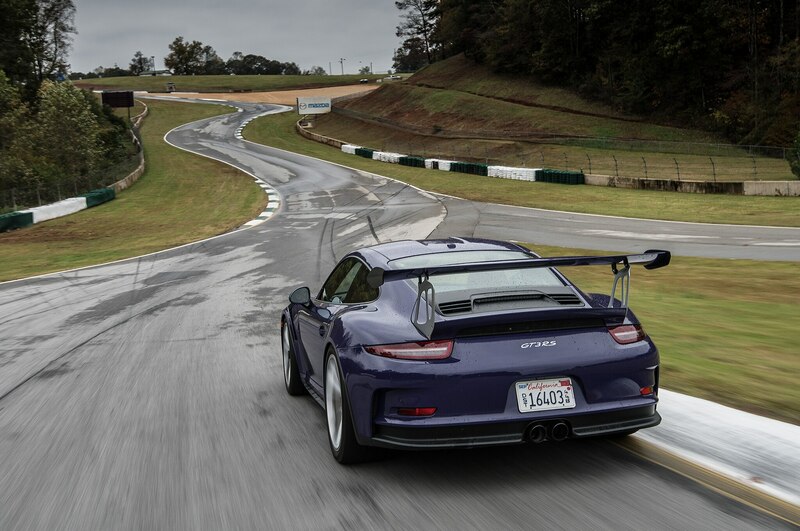 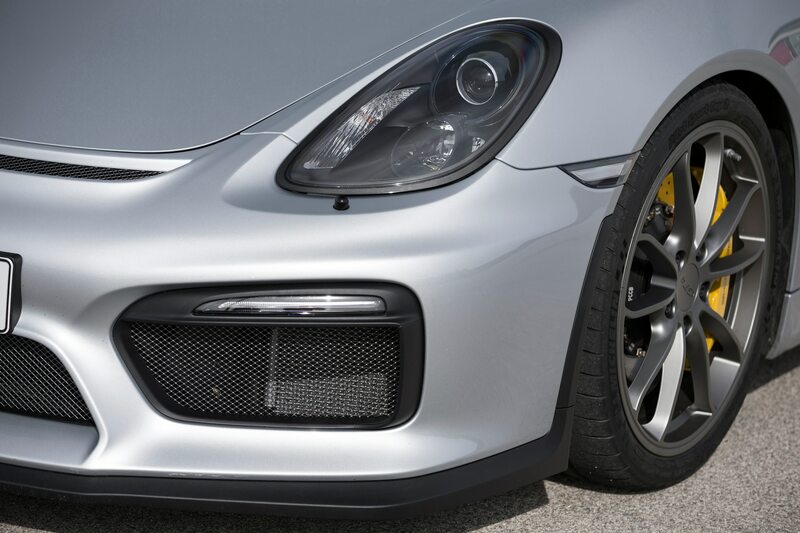 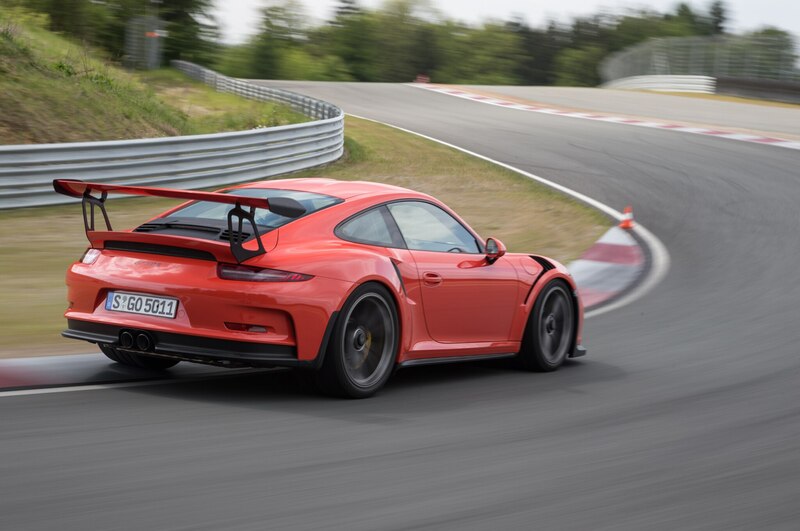 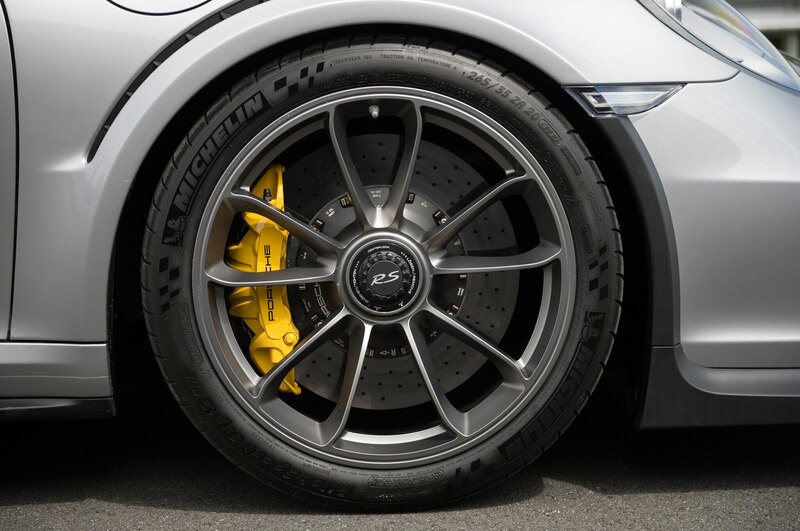 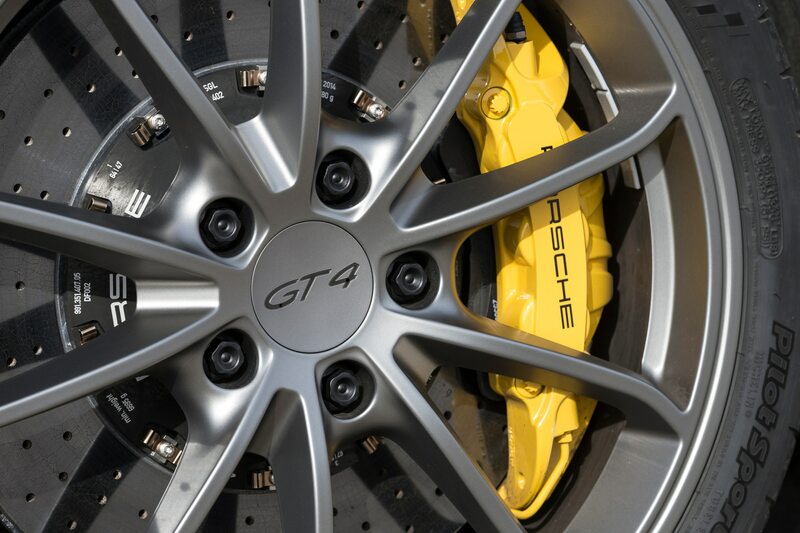 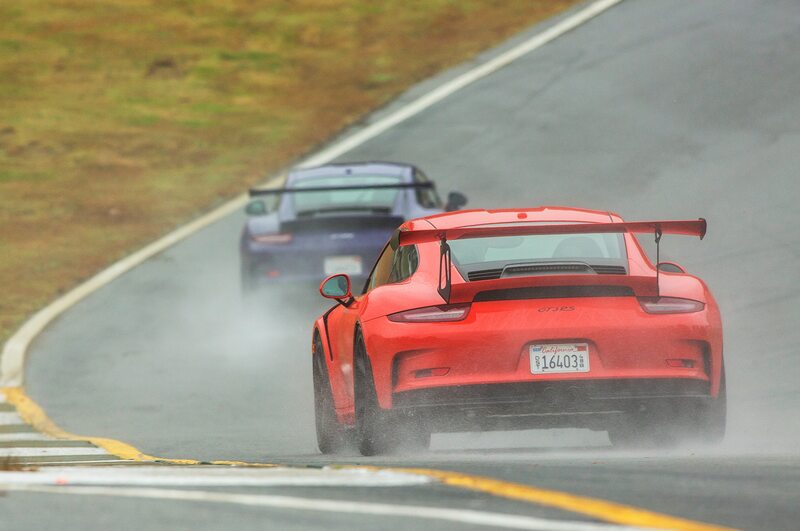 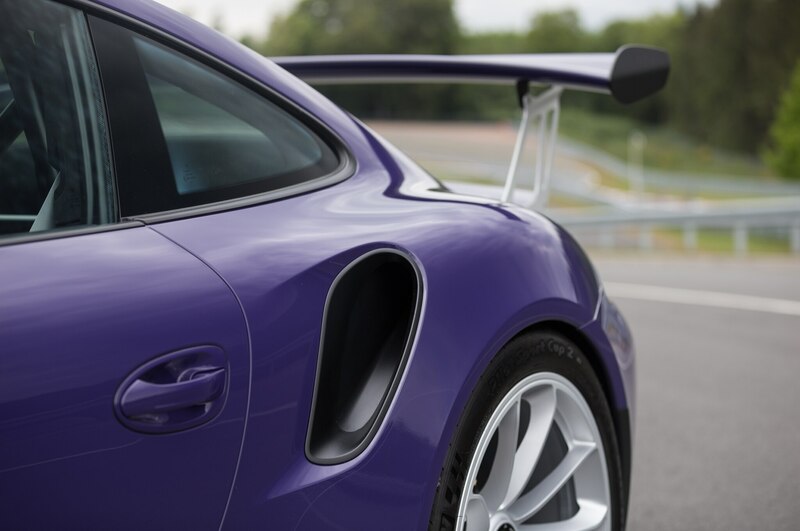 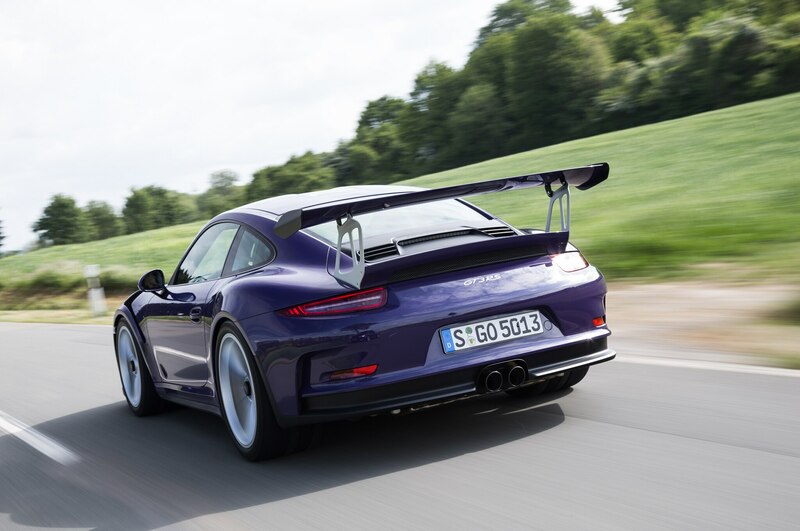 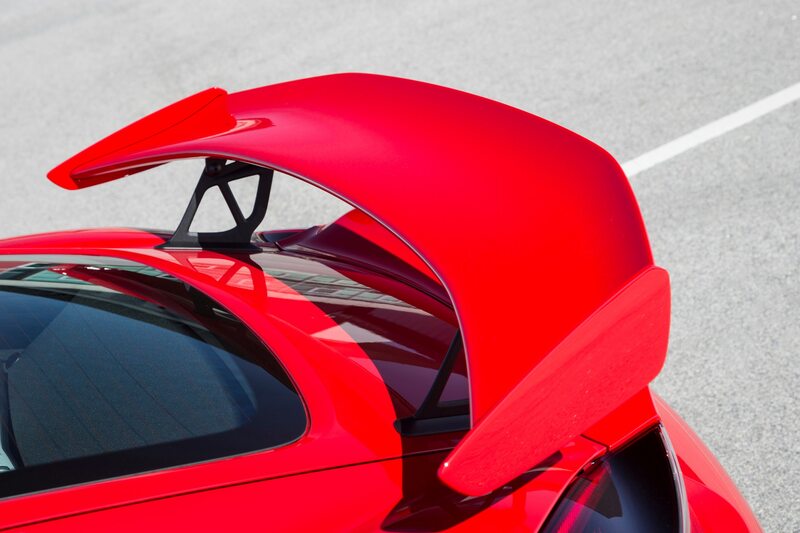 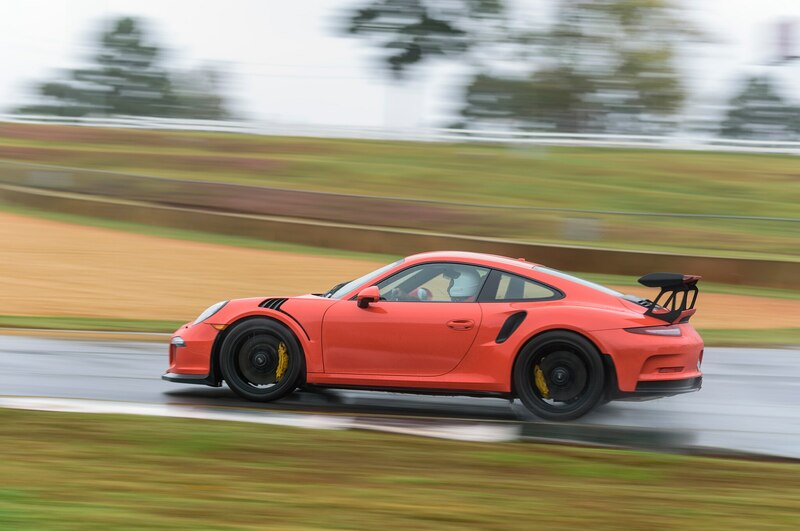 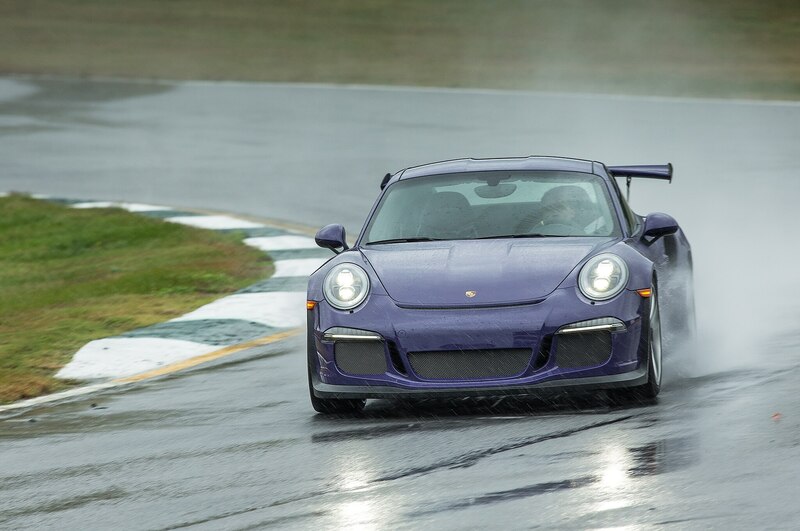 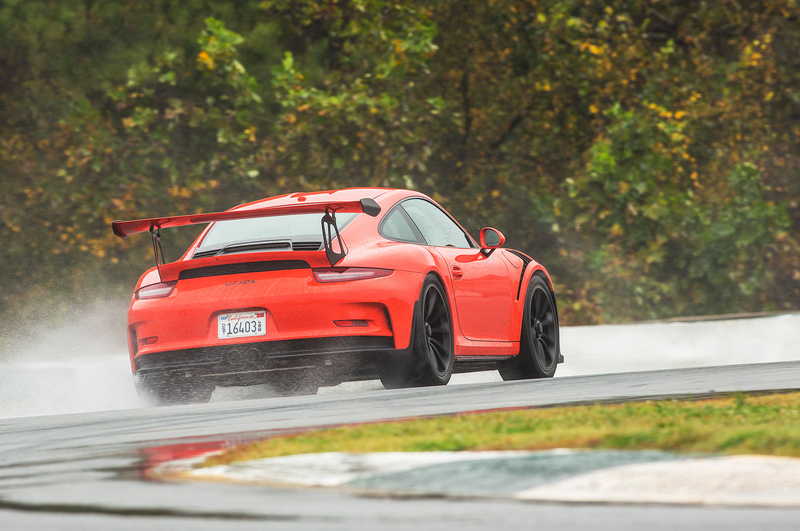 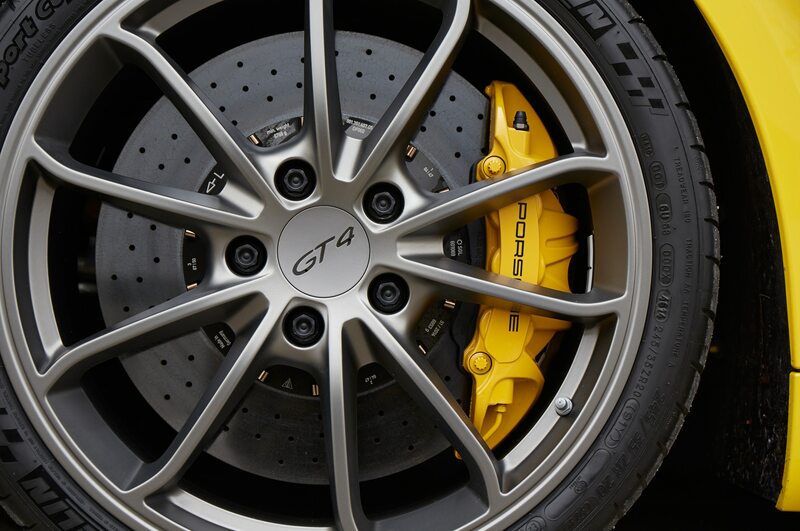 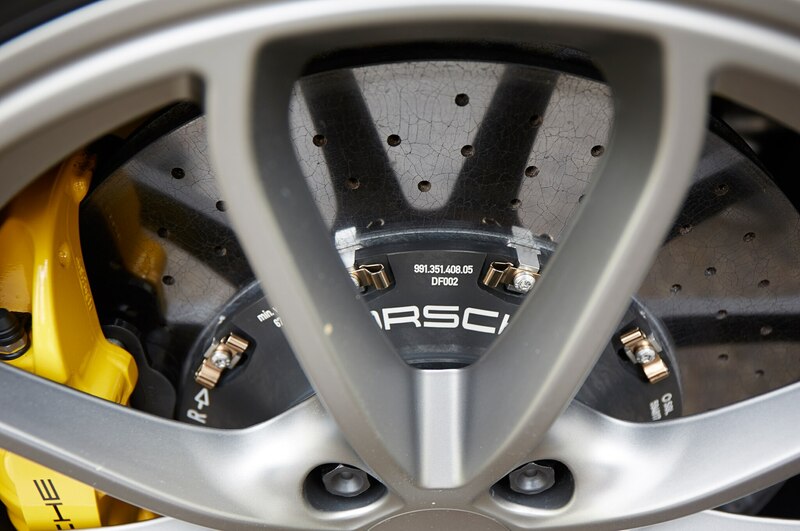 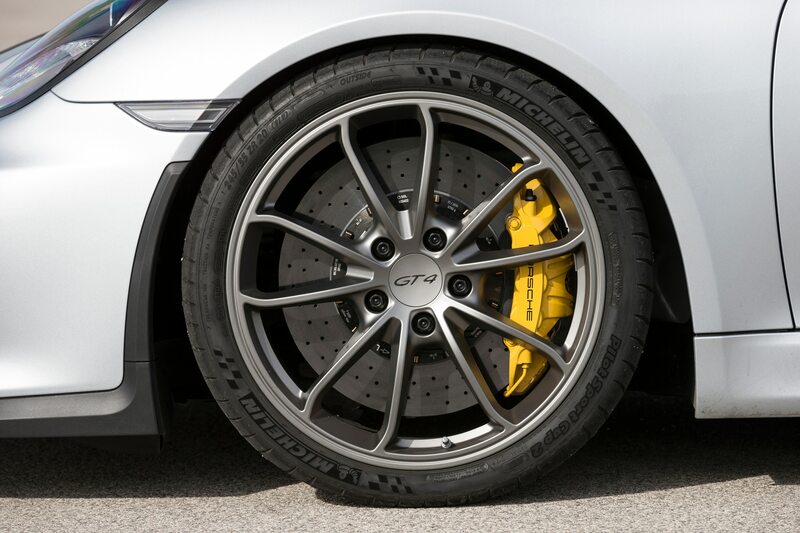 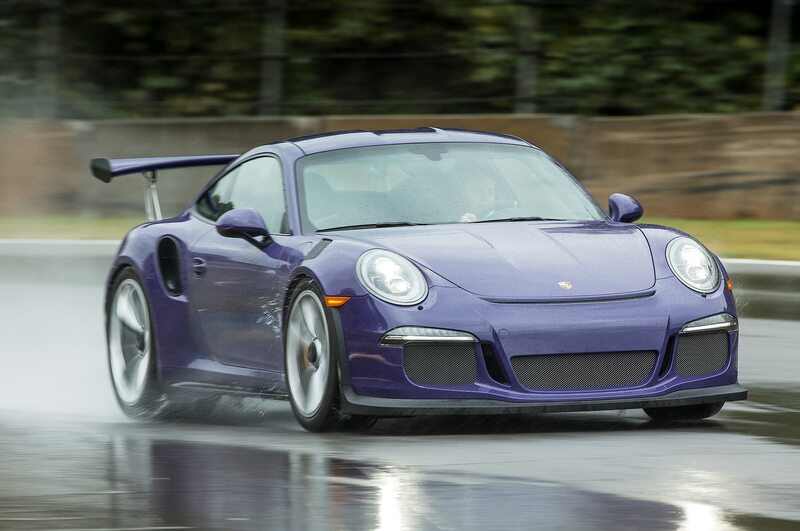 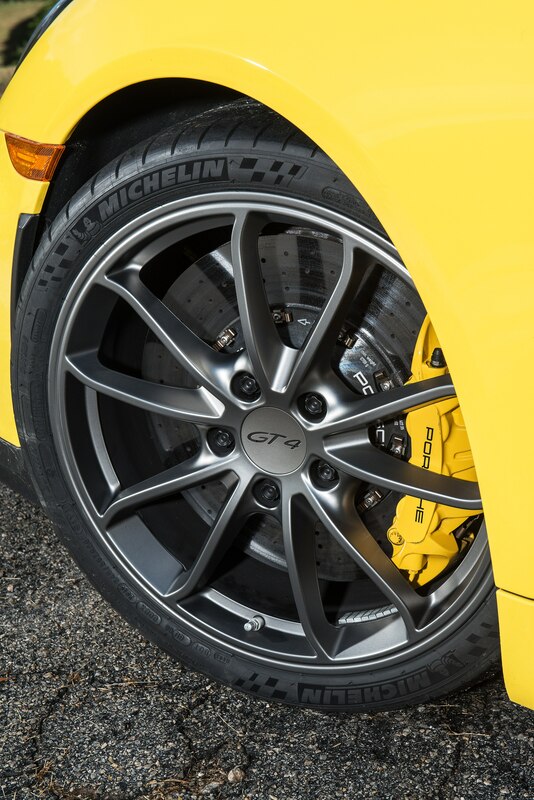 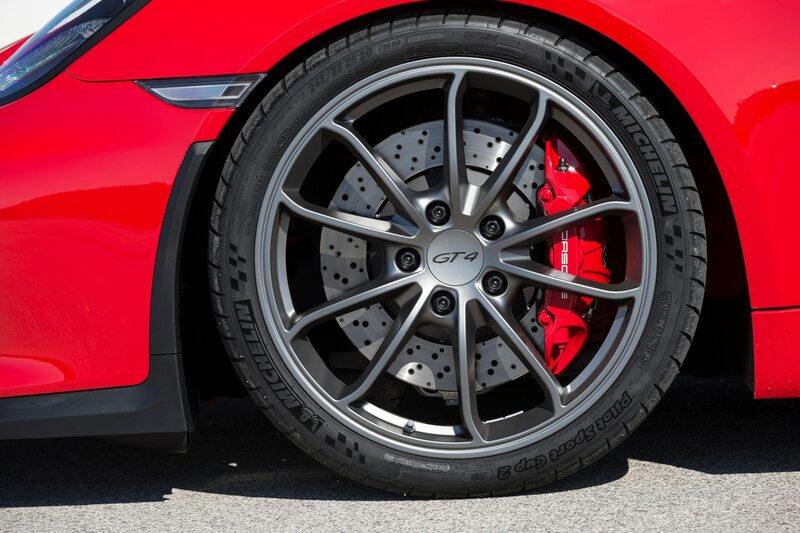 The GT3 RS performed better, thanks to a more forgiving tire compound and three-and-a-half times more downforce than the Cayman. 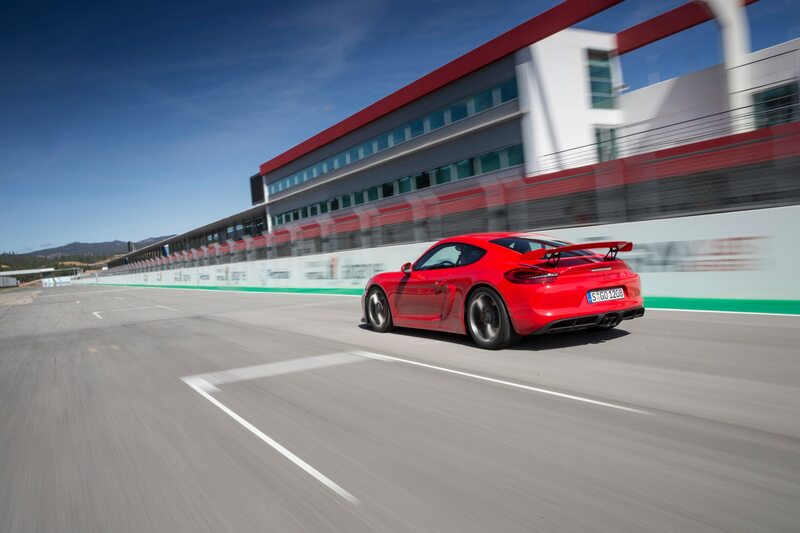 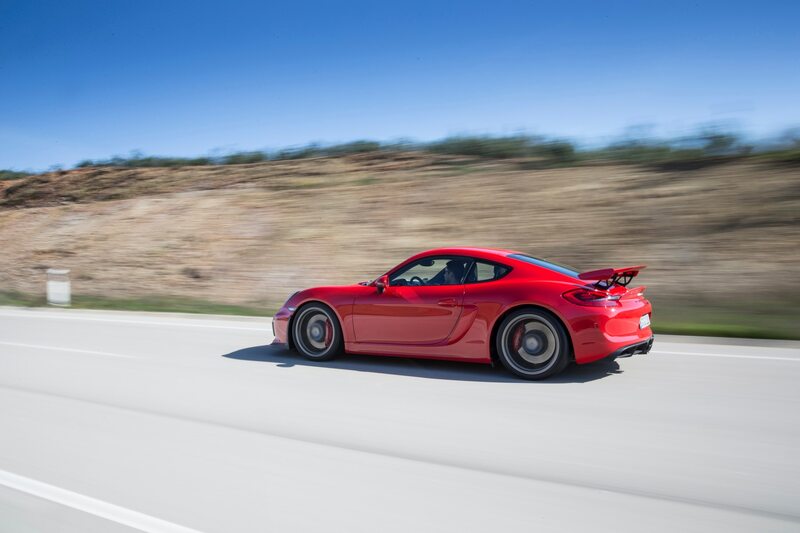 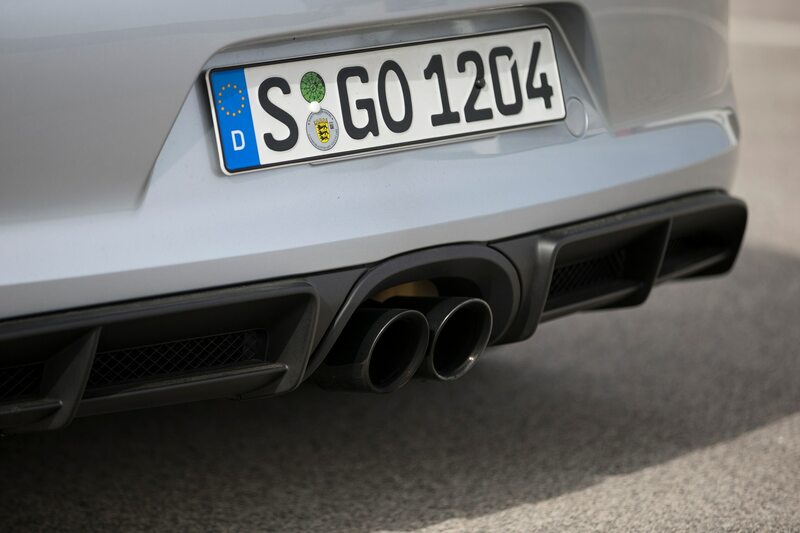 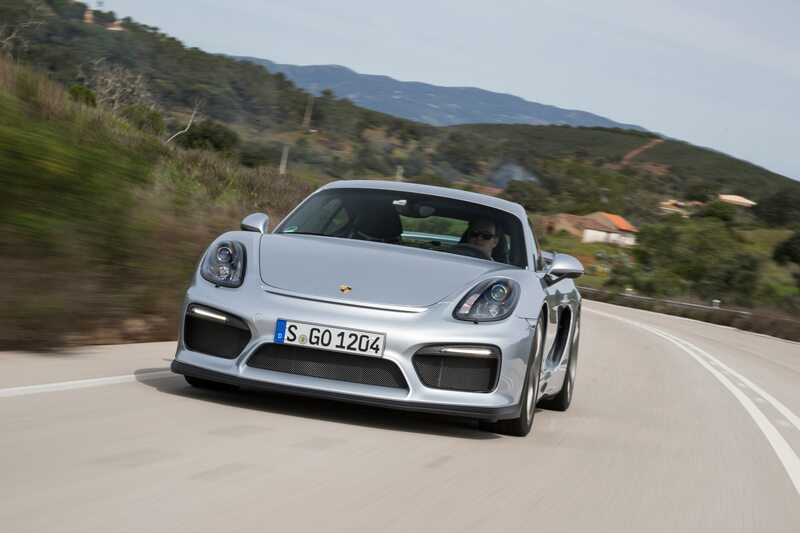 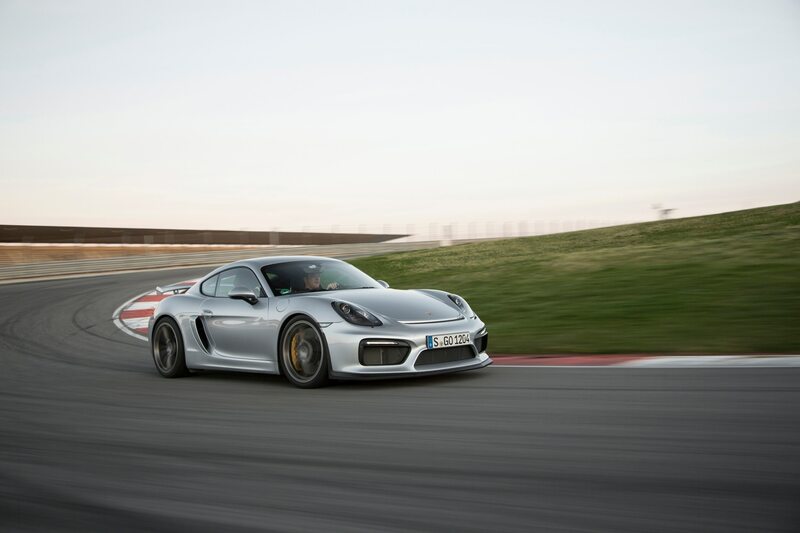 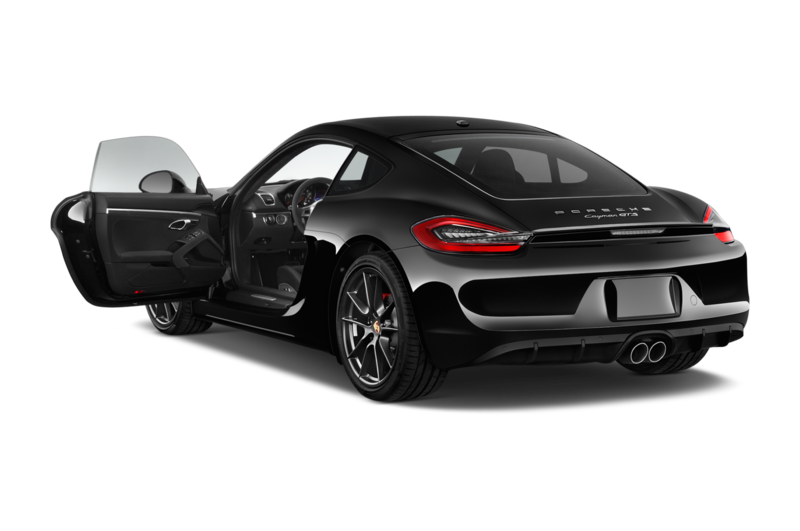 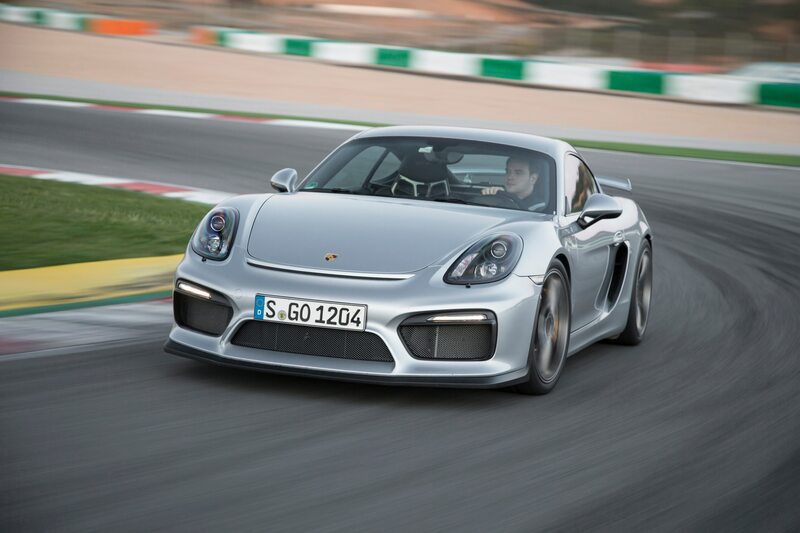 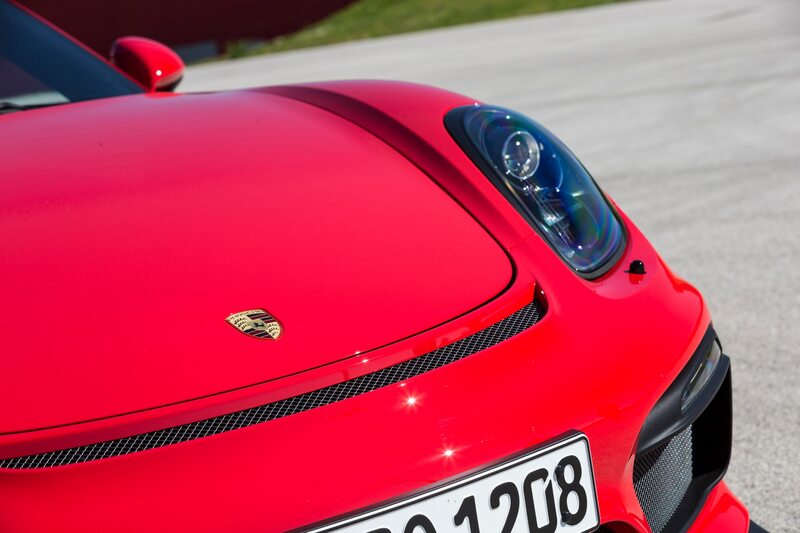 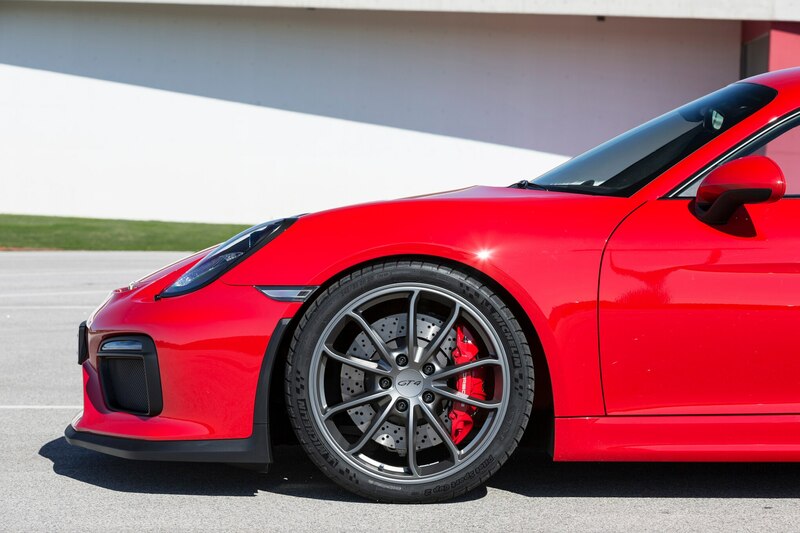 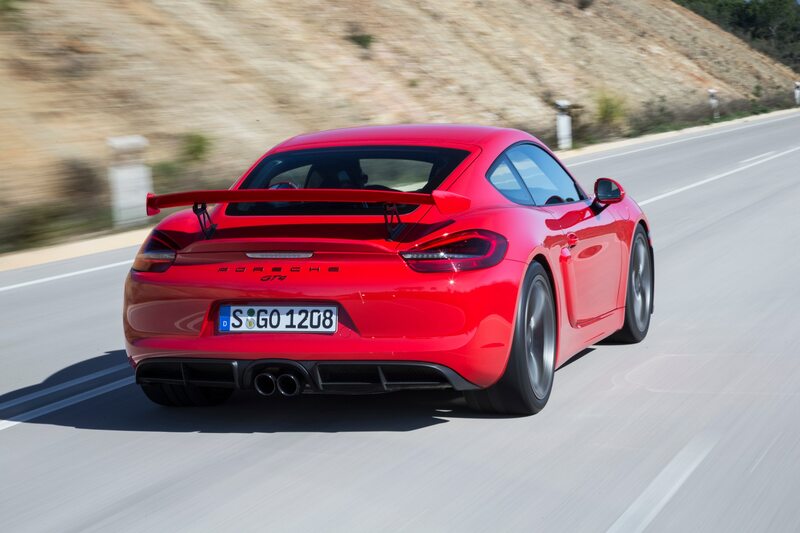 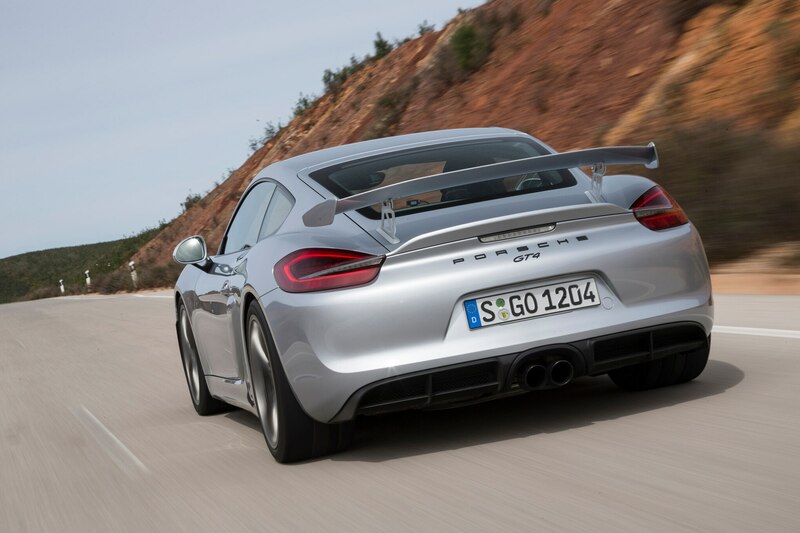 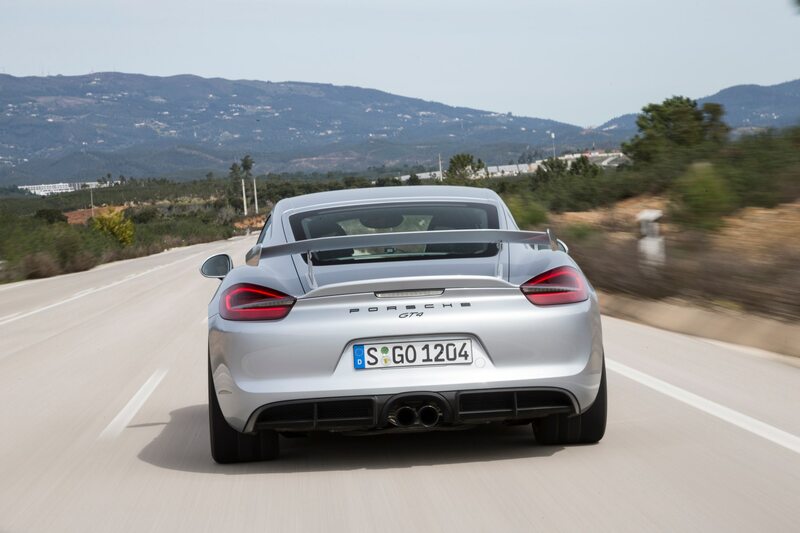 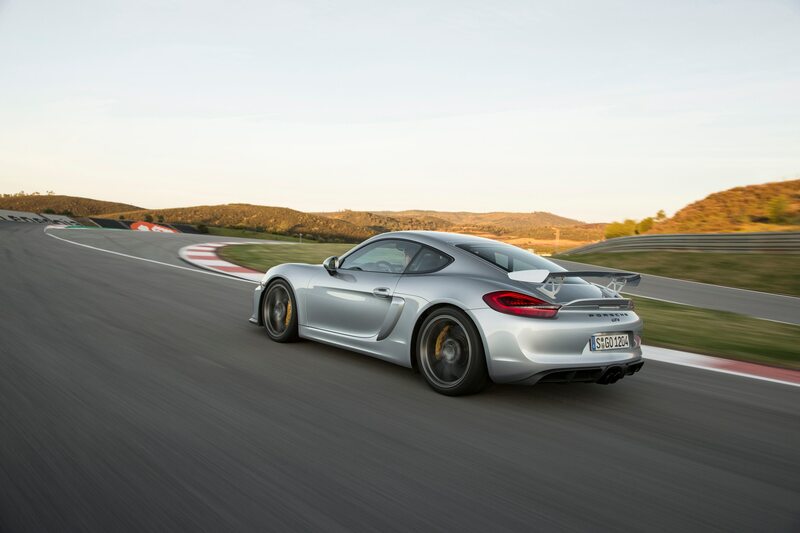 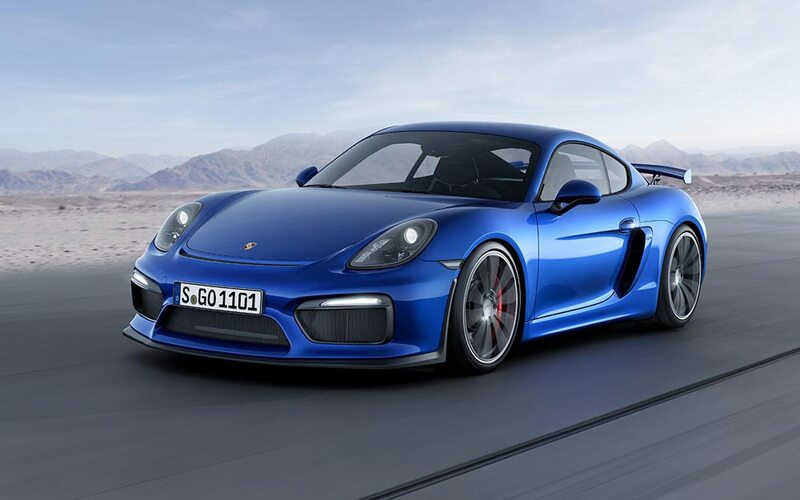 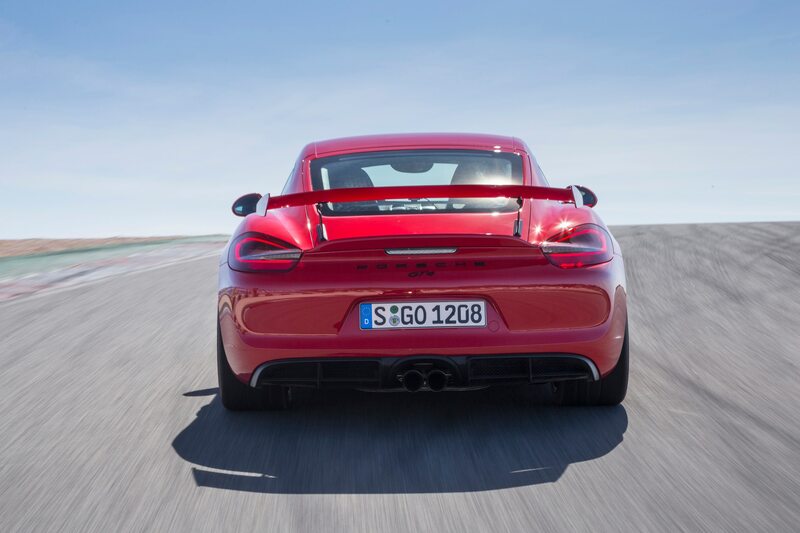 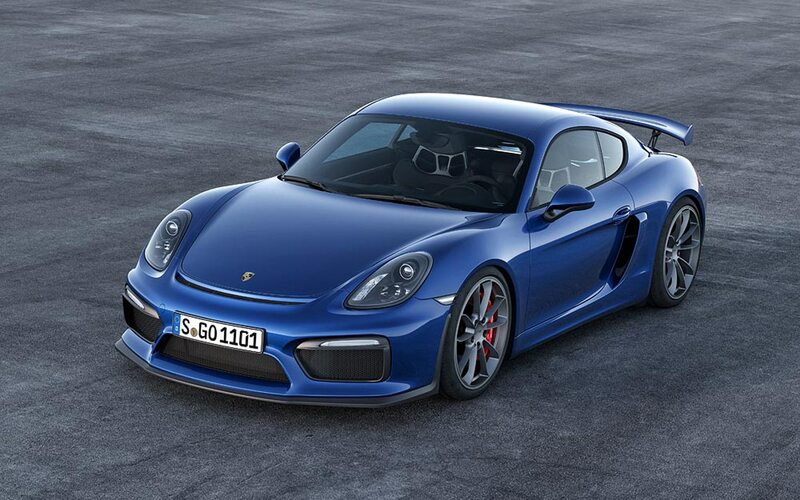 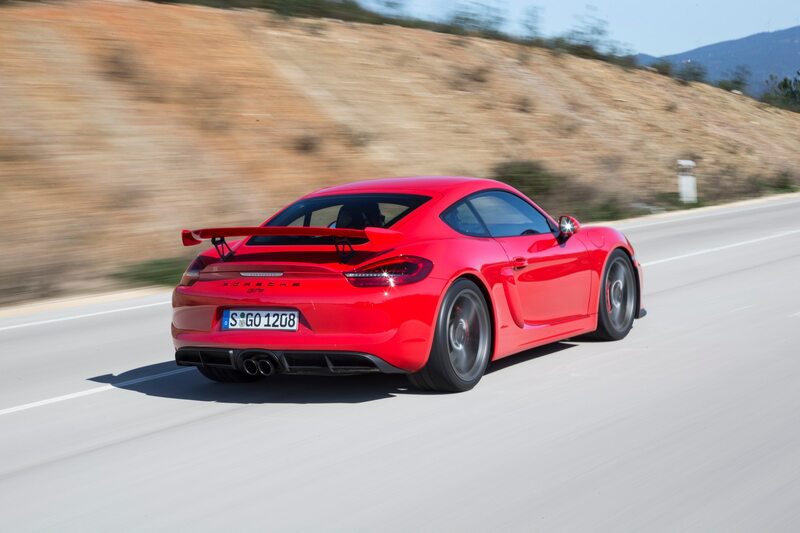 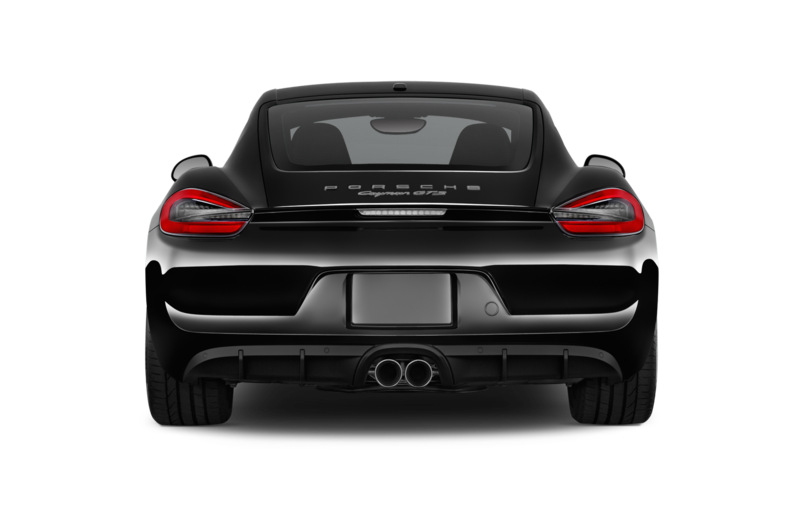 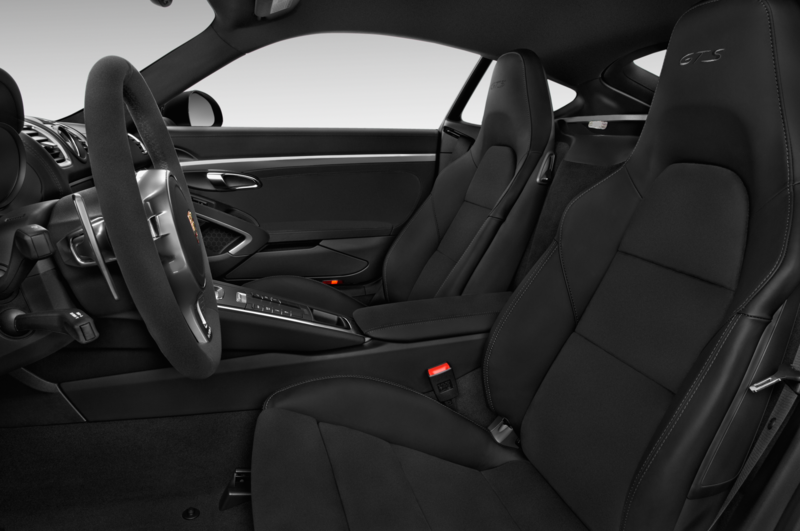 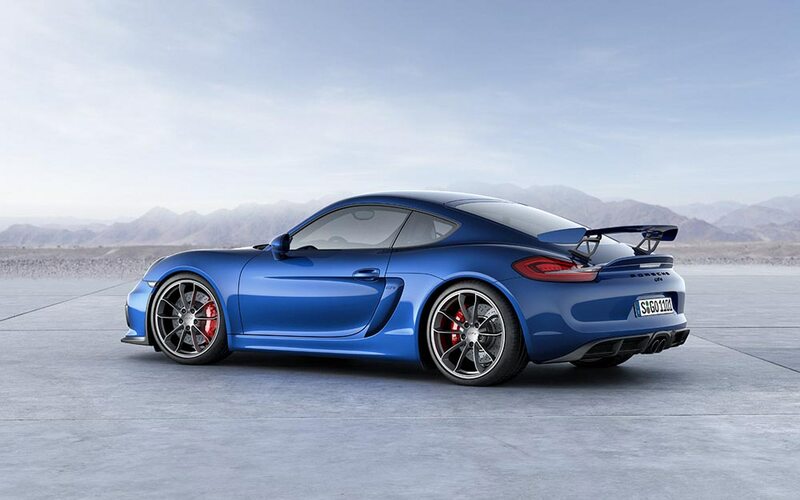 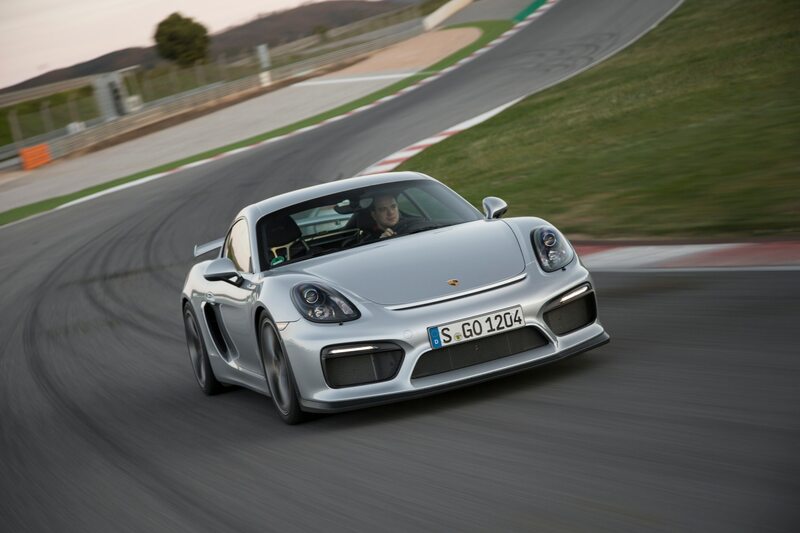 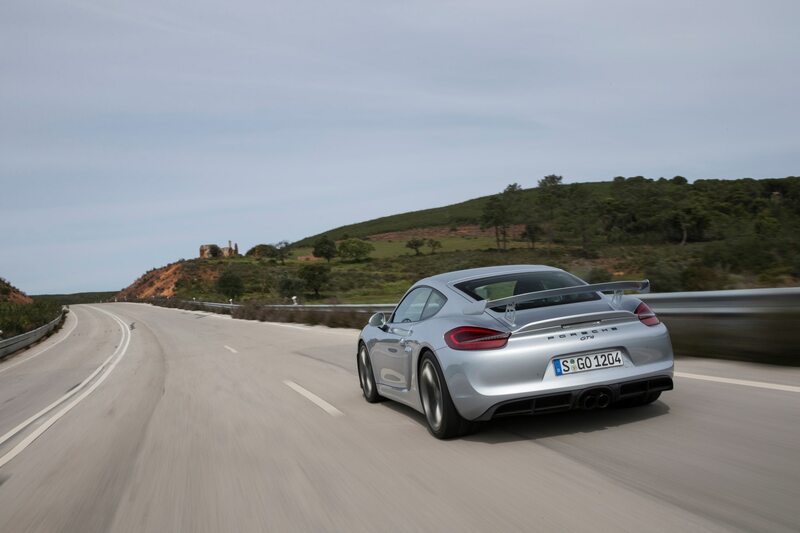 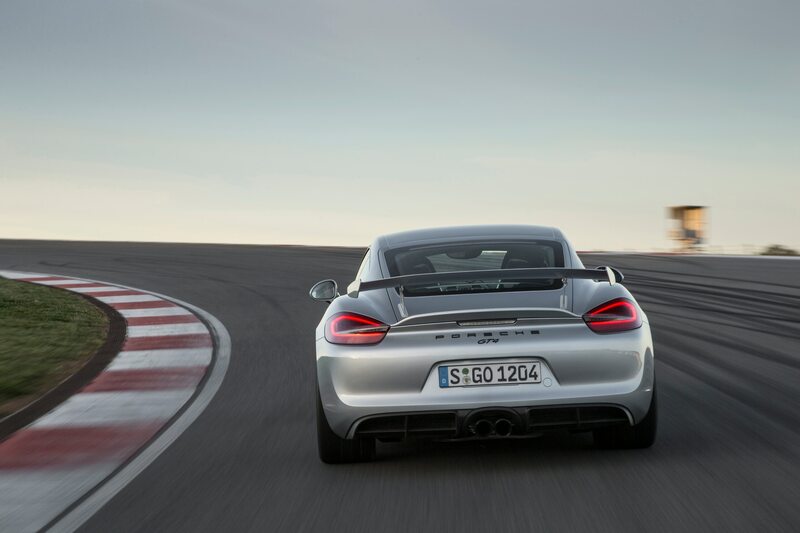 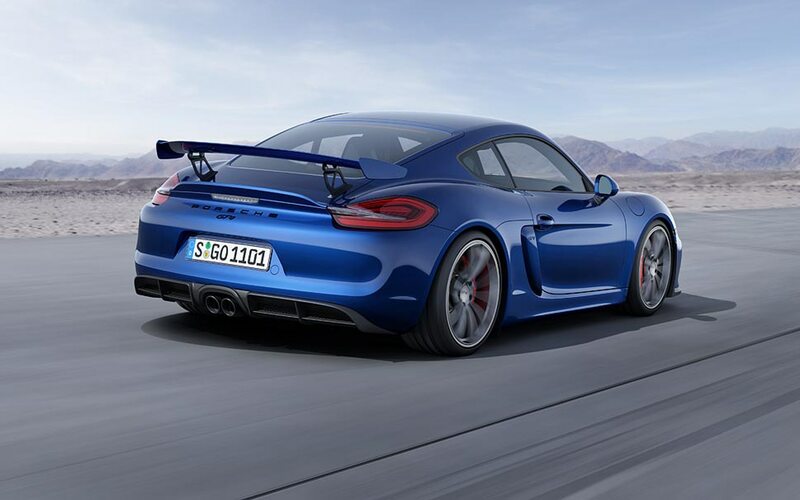 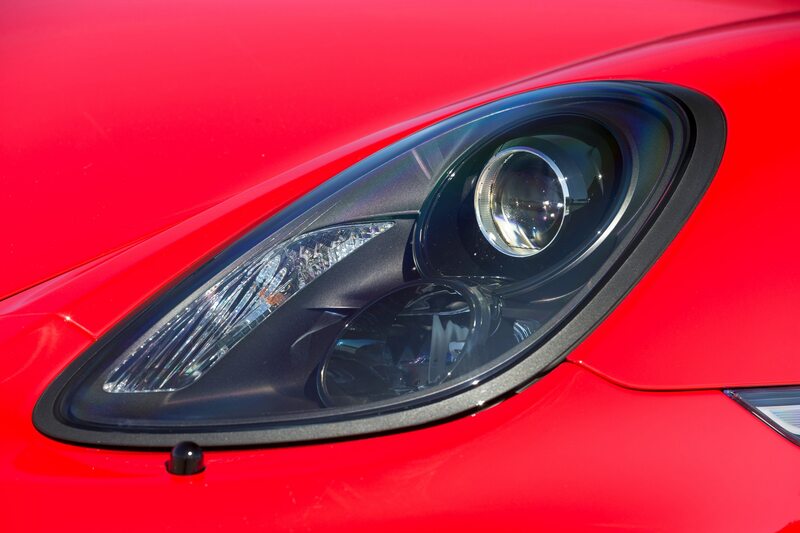 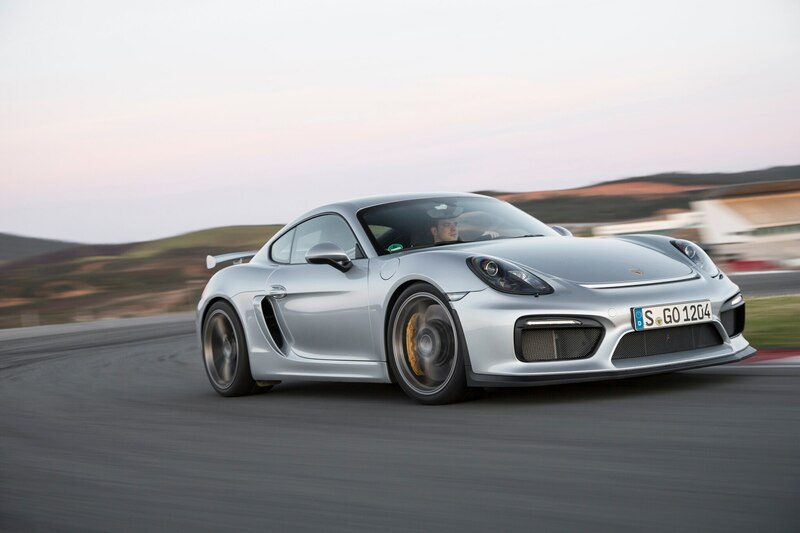 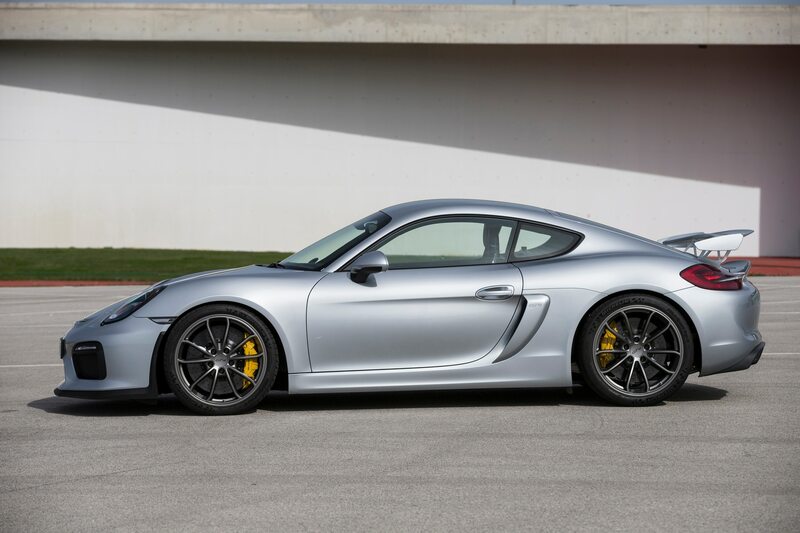 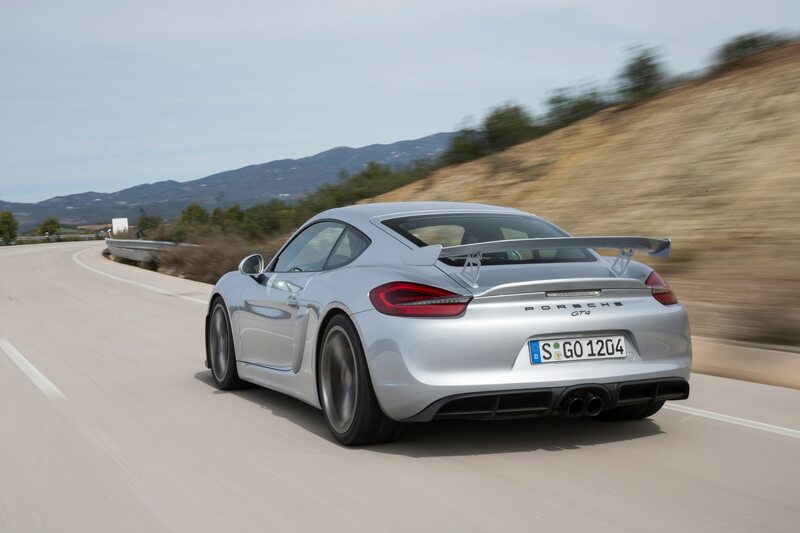 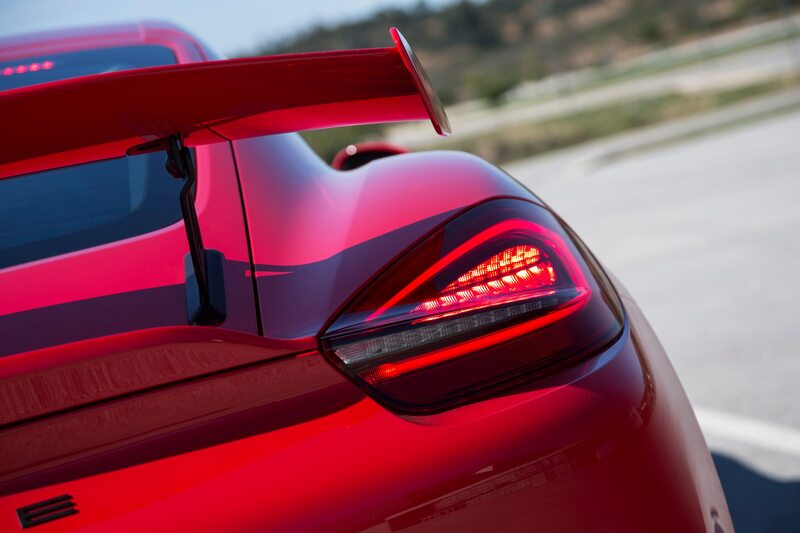 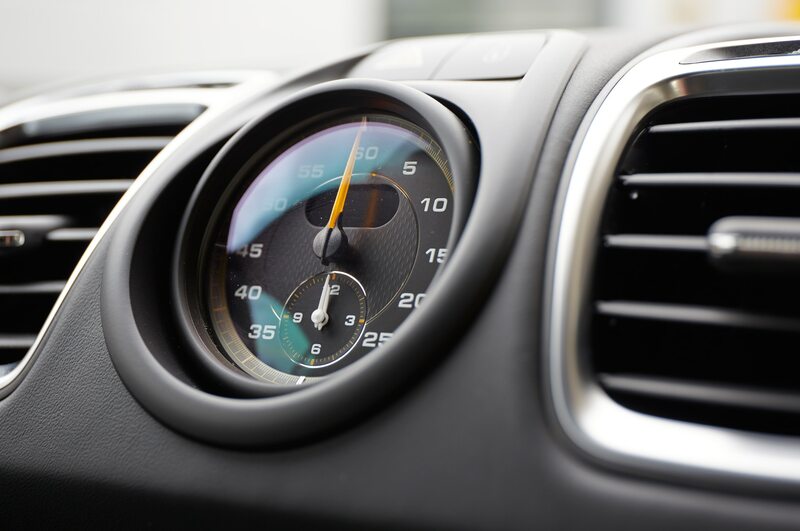 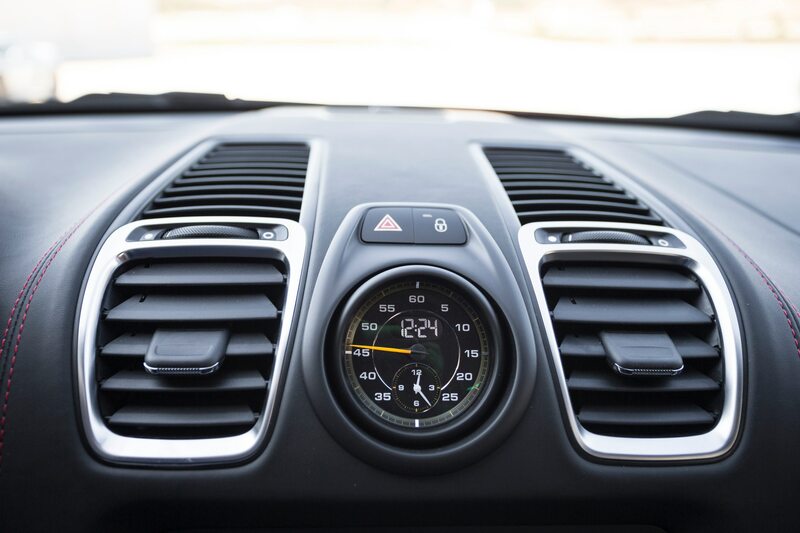 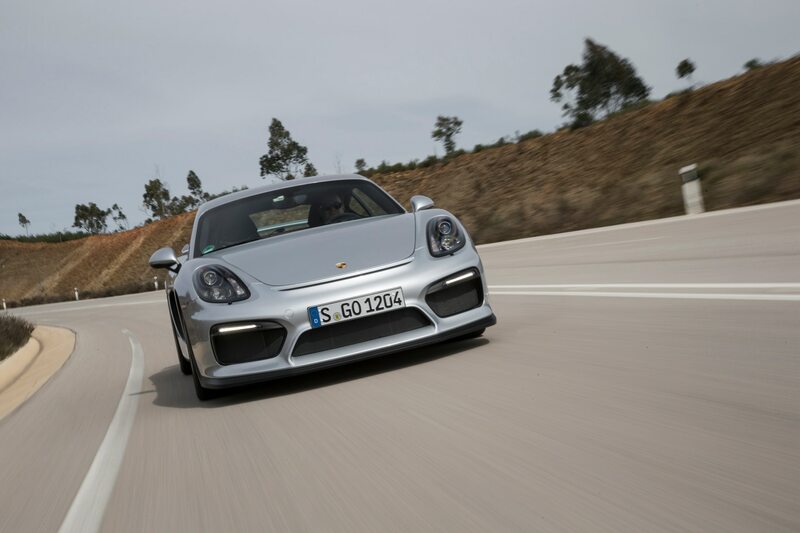 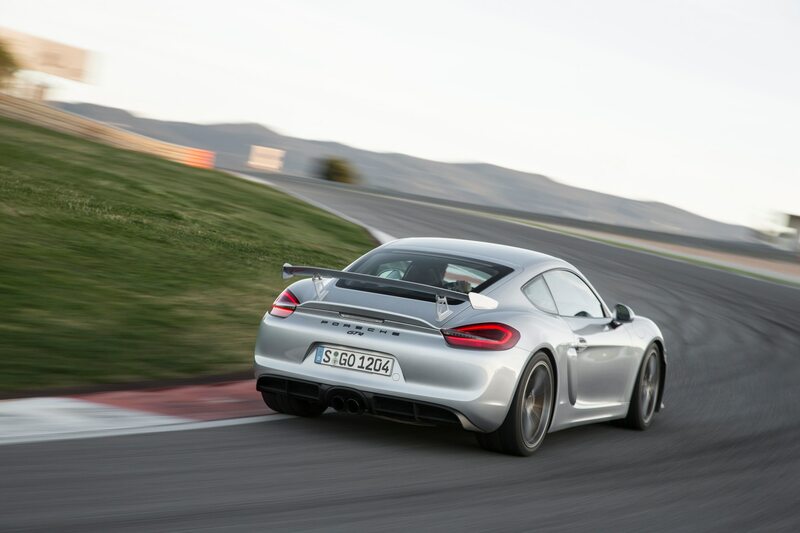 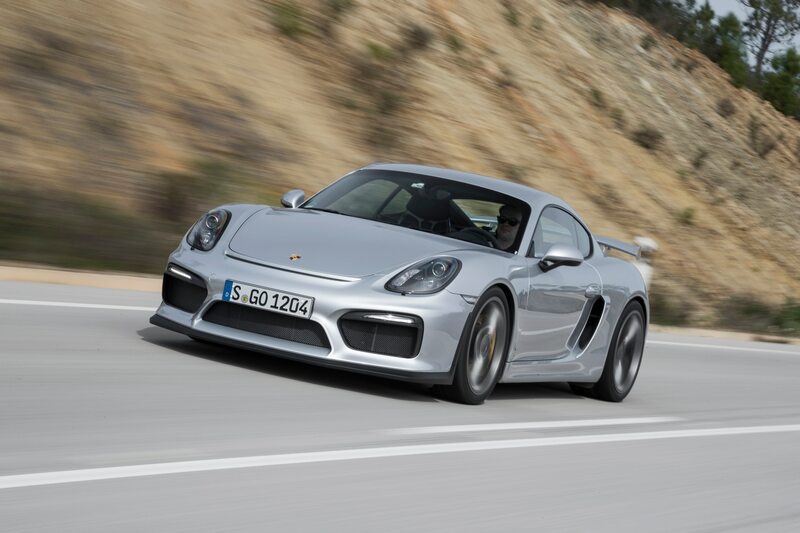 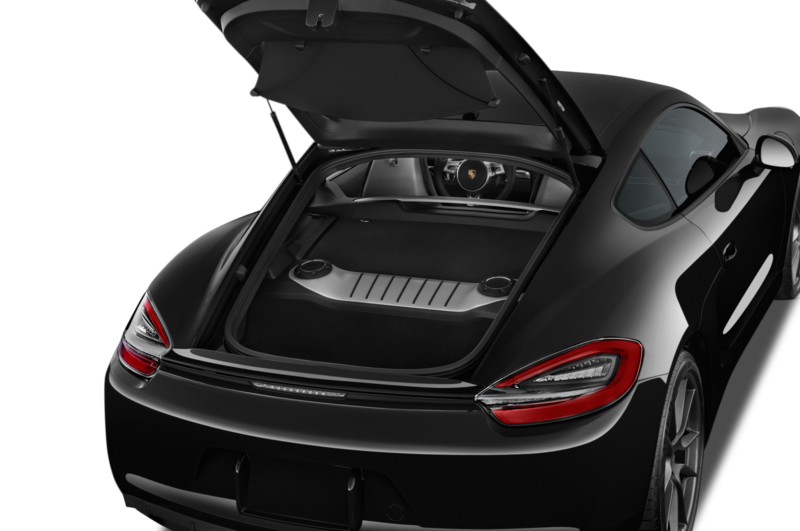 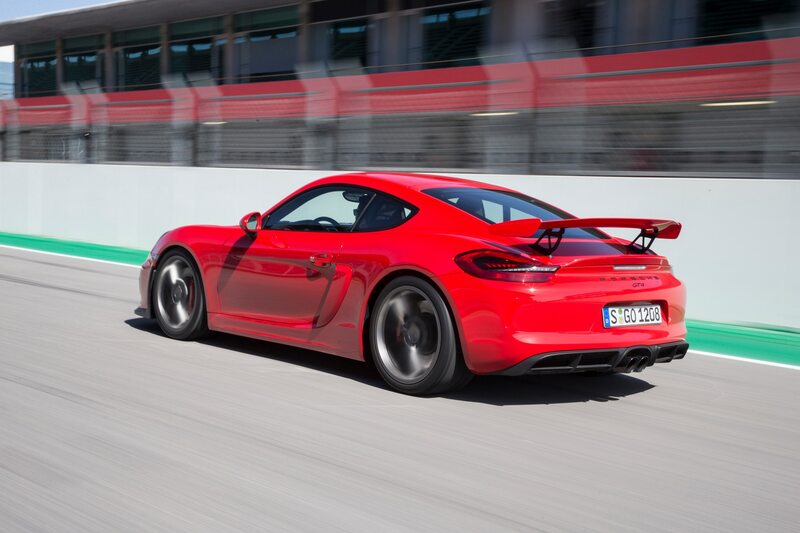 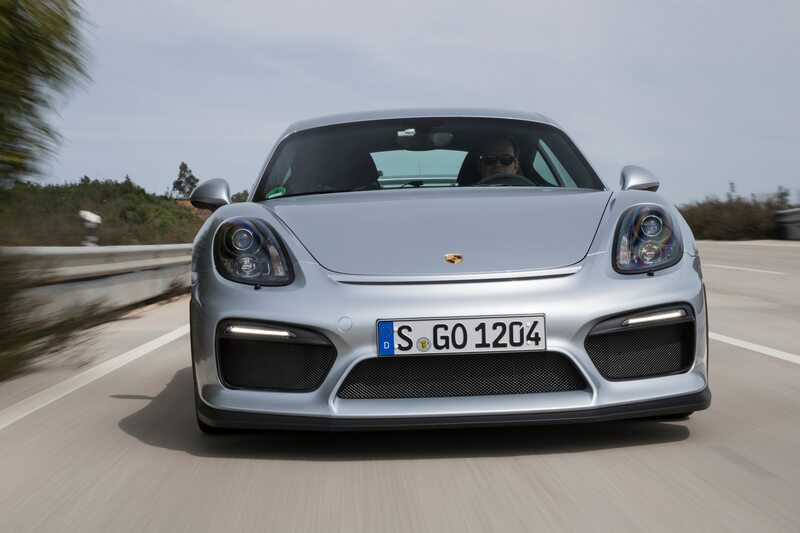 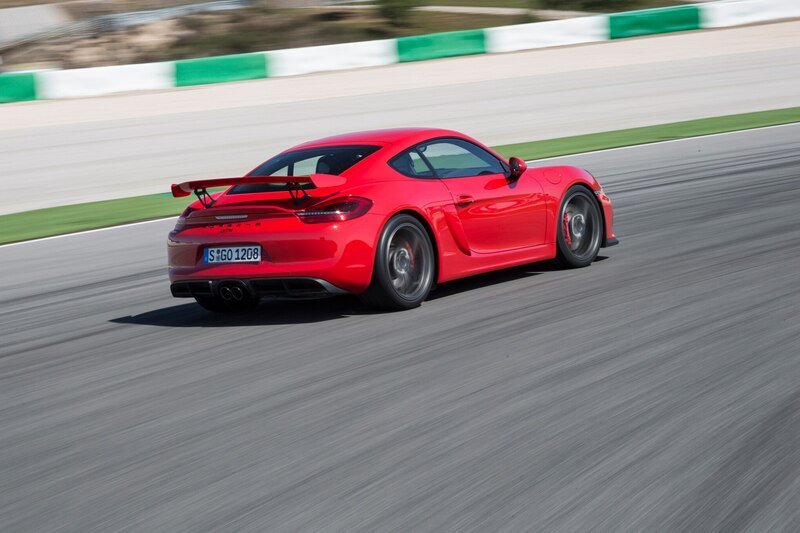 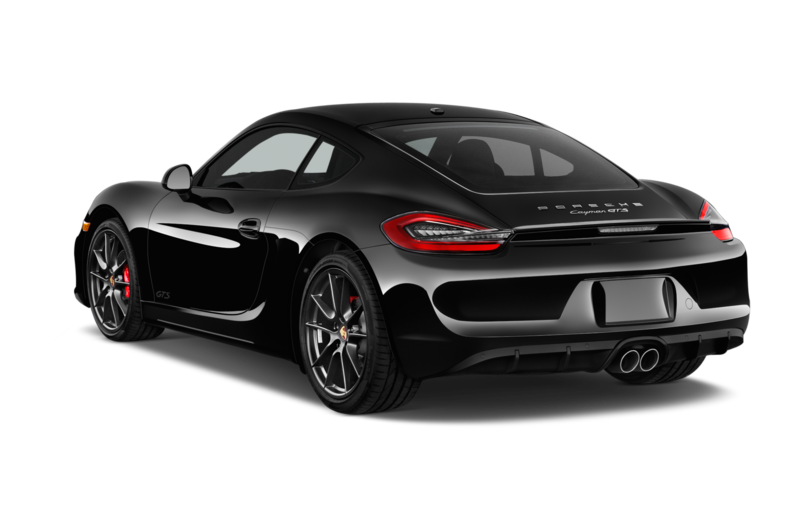 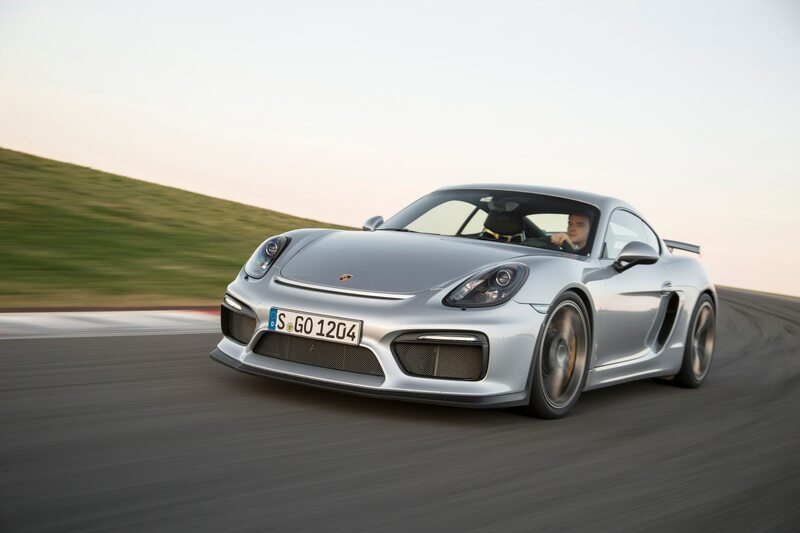 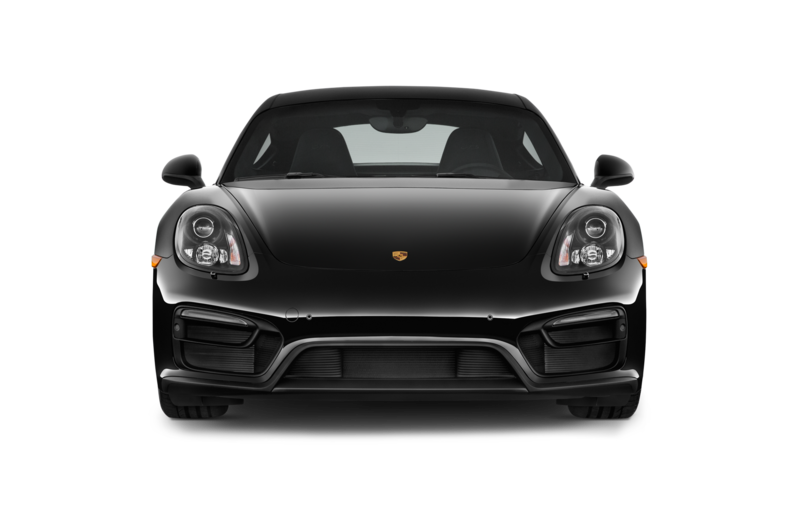 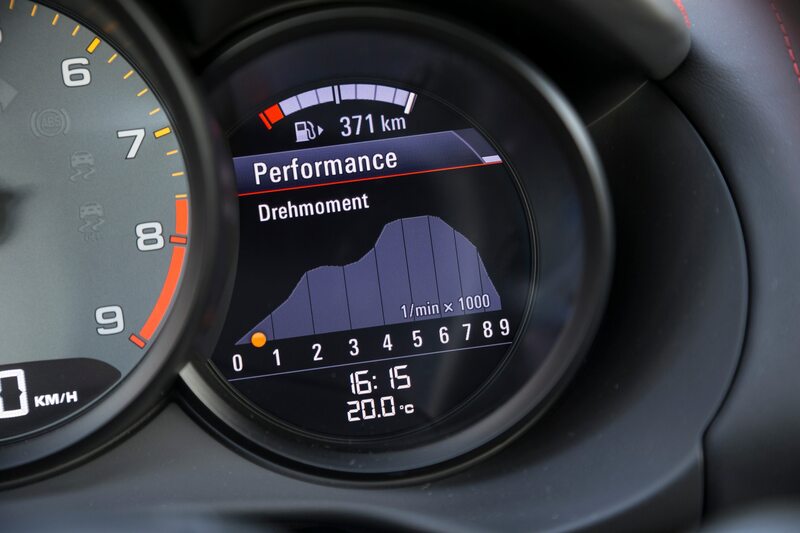 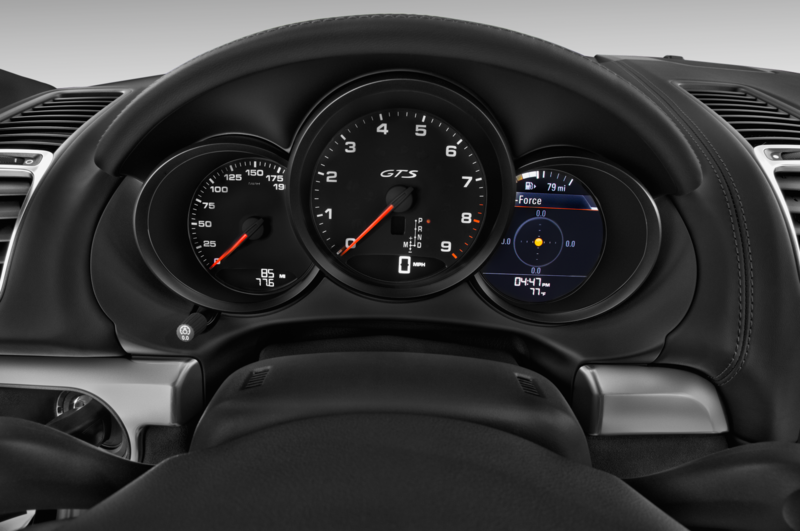 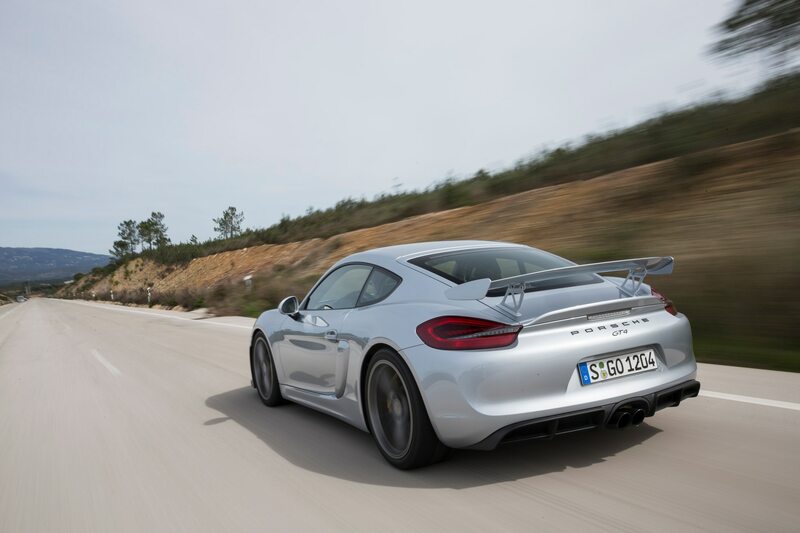 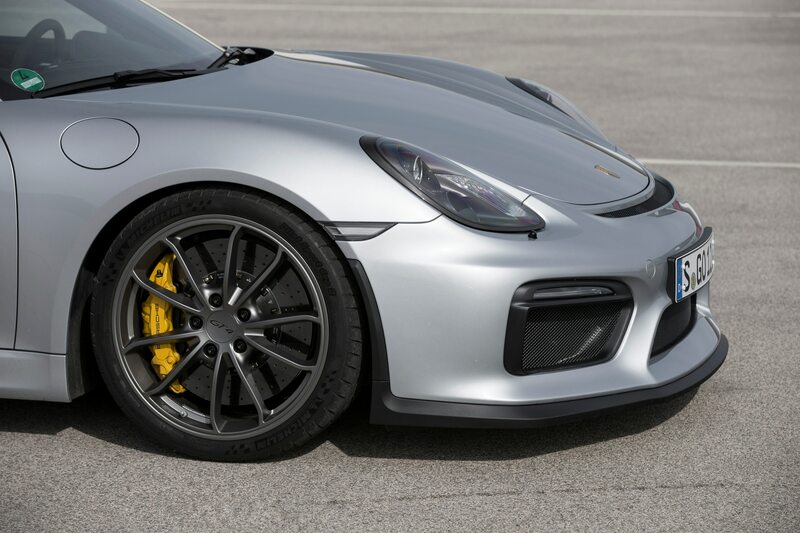 (It makes 761 pounds at 186 miles per hour, Porsche says.) 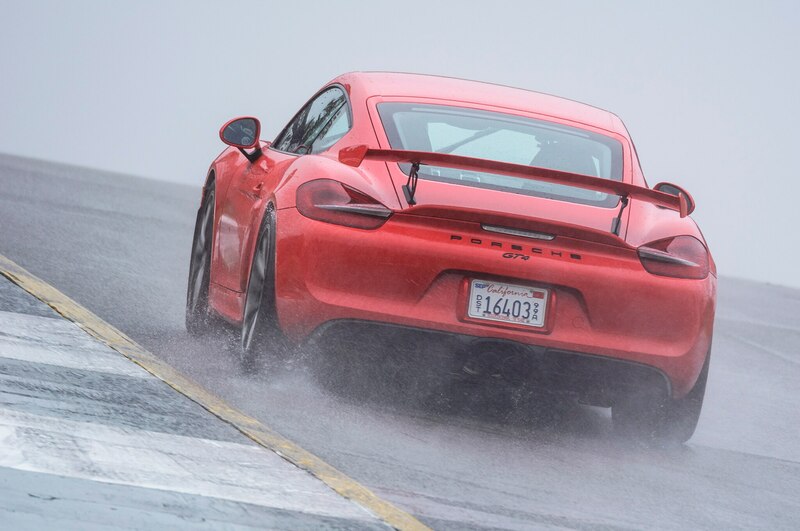 This meant, paradoxically, that the car felt more planted in faster corners than slower ones. 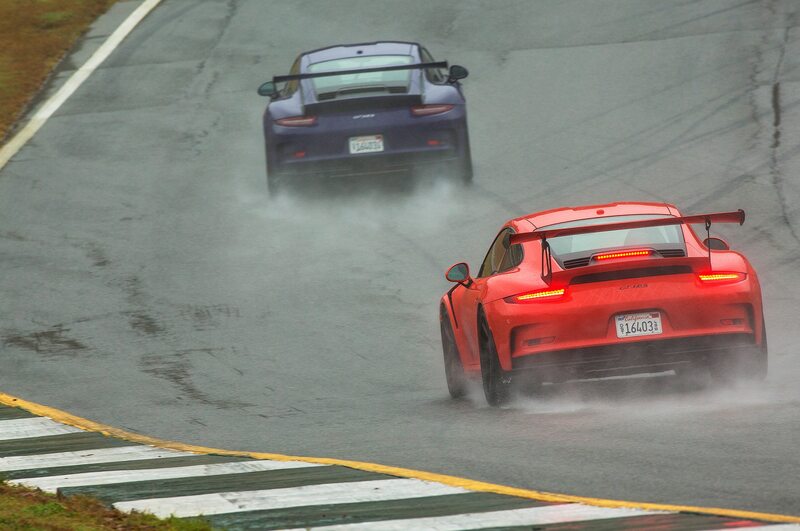 But it never inspired confidence on the damp track. 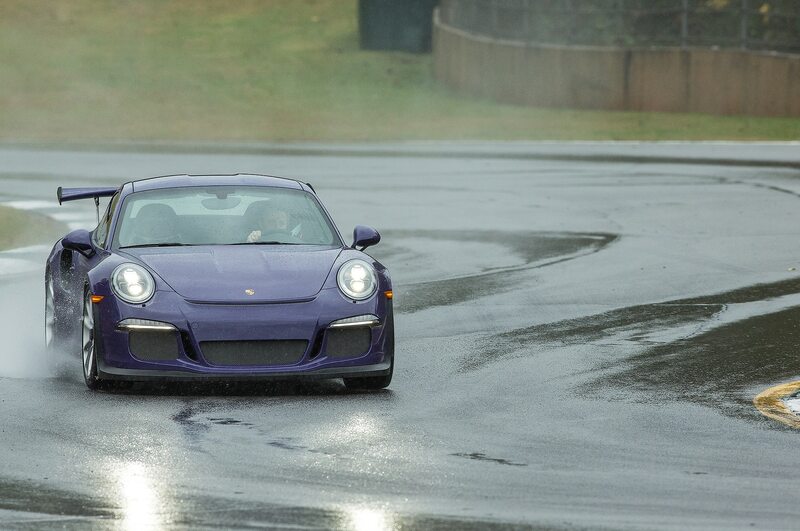 Still, despite the less than ideal conditions, it was possible to glean a lot about the cars. 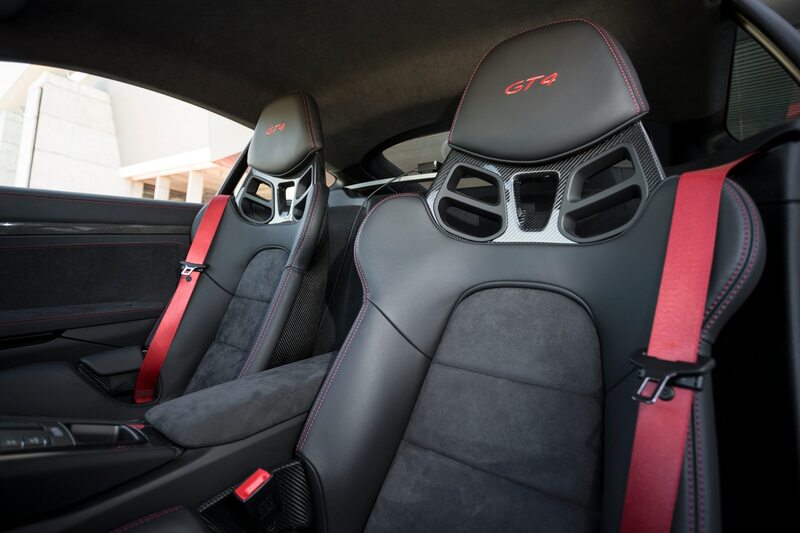 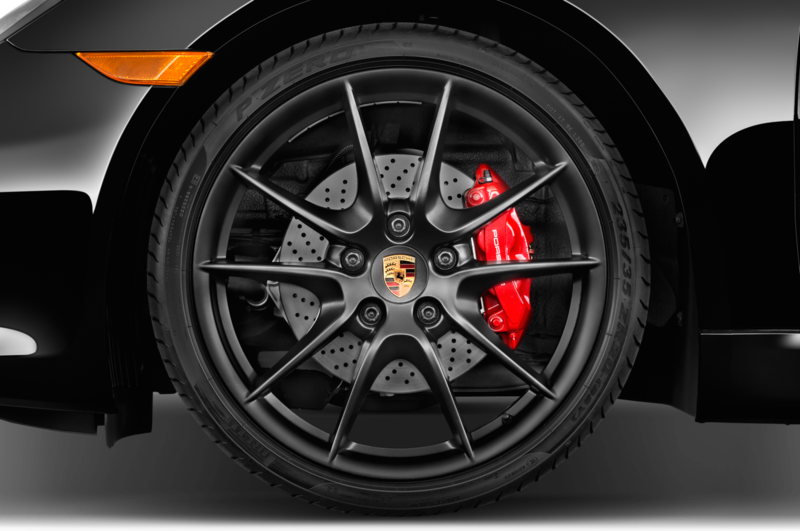 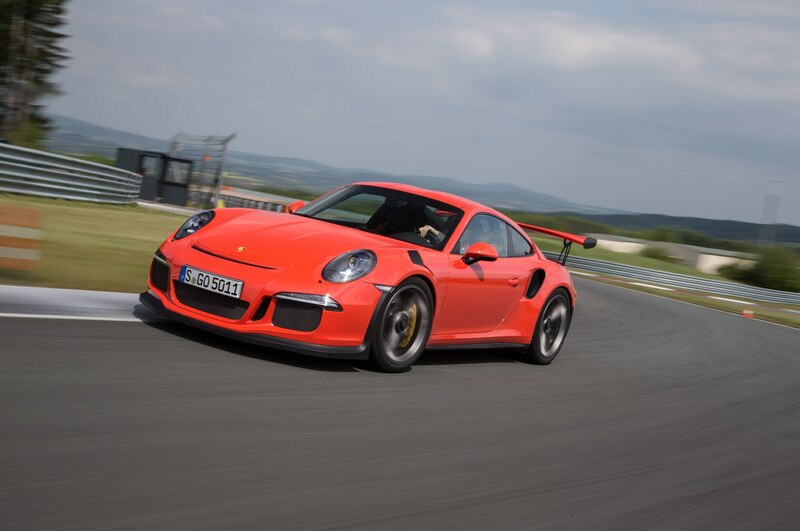 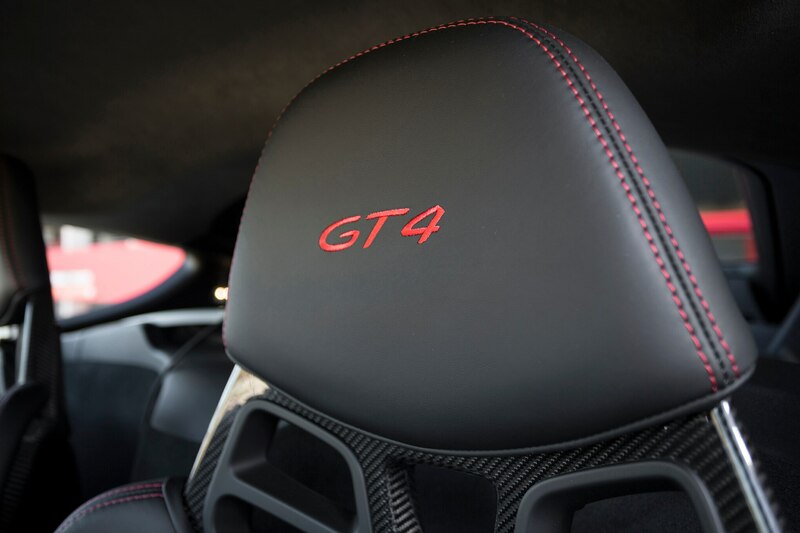 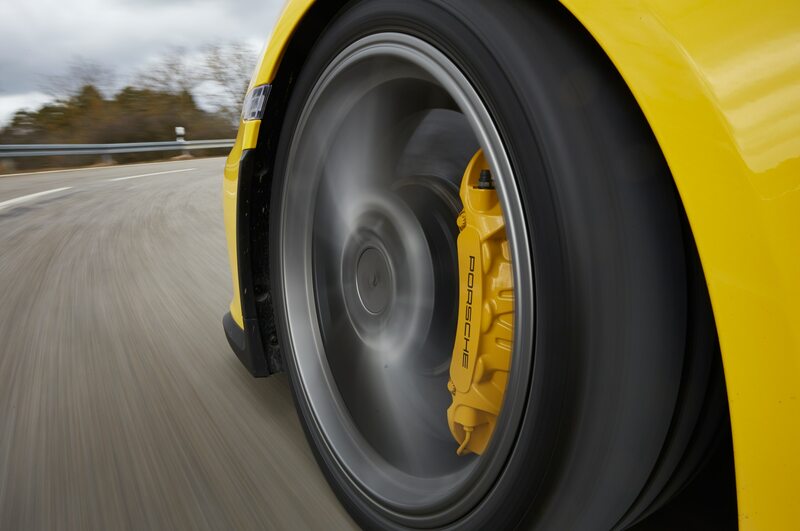 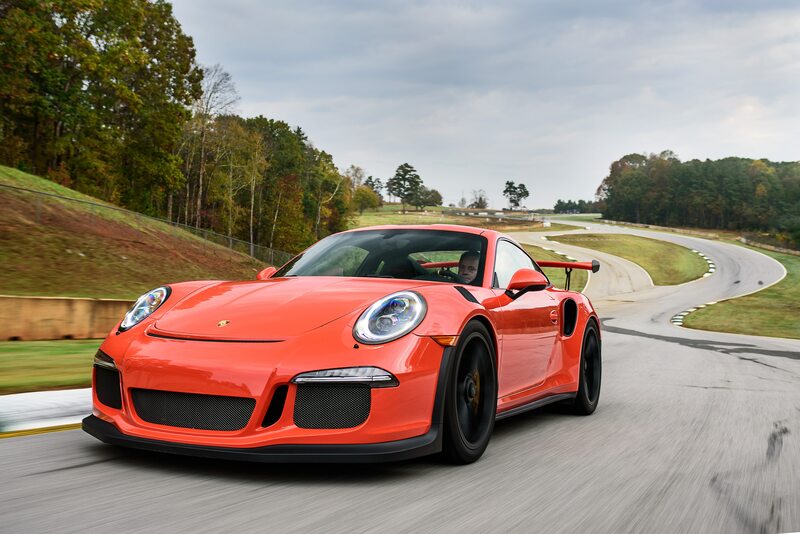 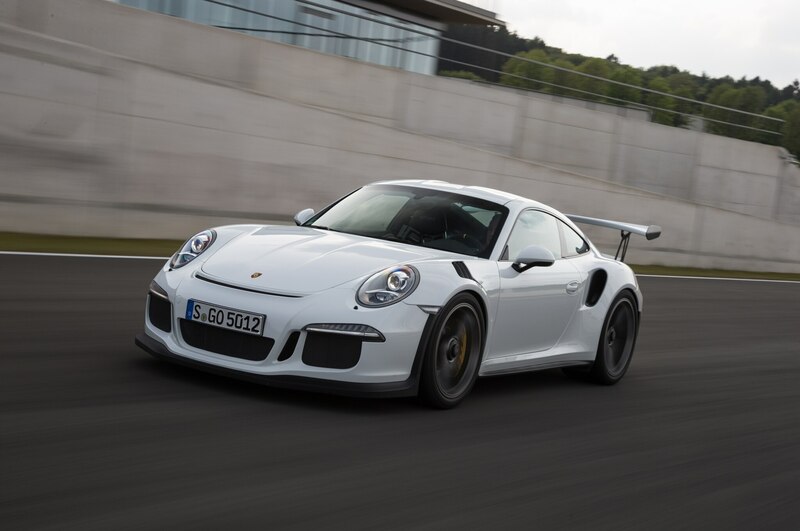 The GT3 RS is one of the only machines on the planet to justify the “street-legal race car” label slapped on virtually any model with high-performance pretentions. 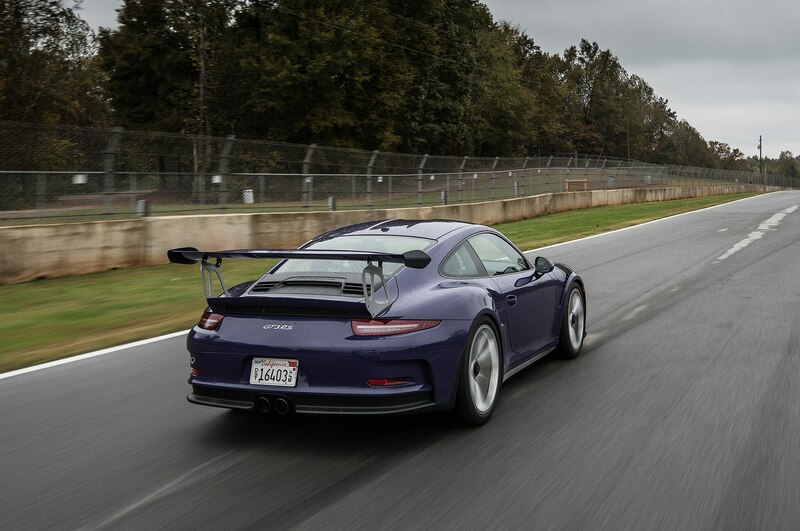 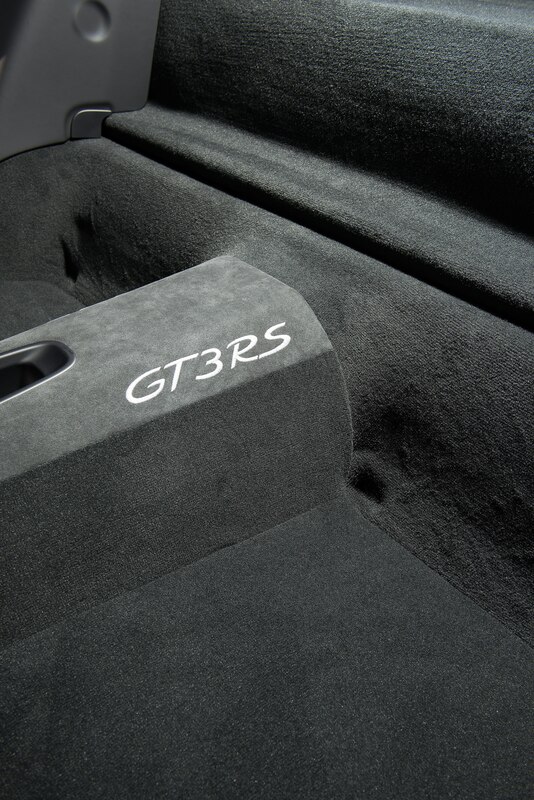 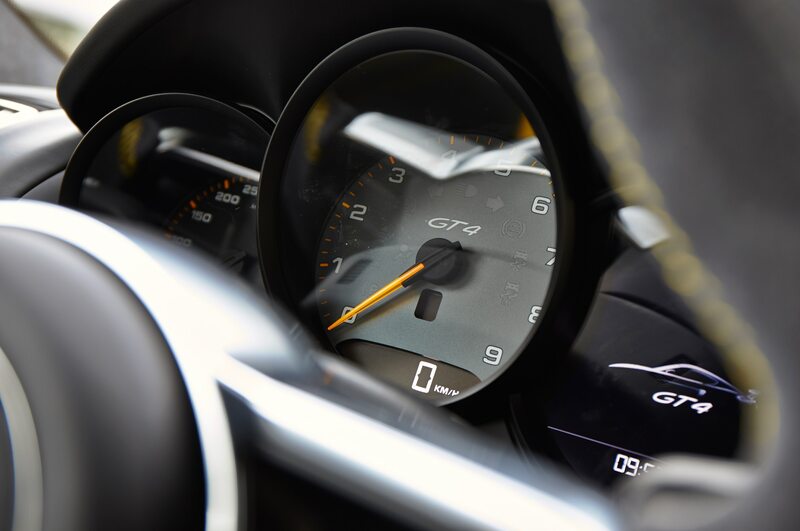 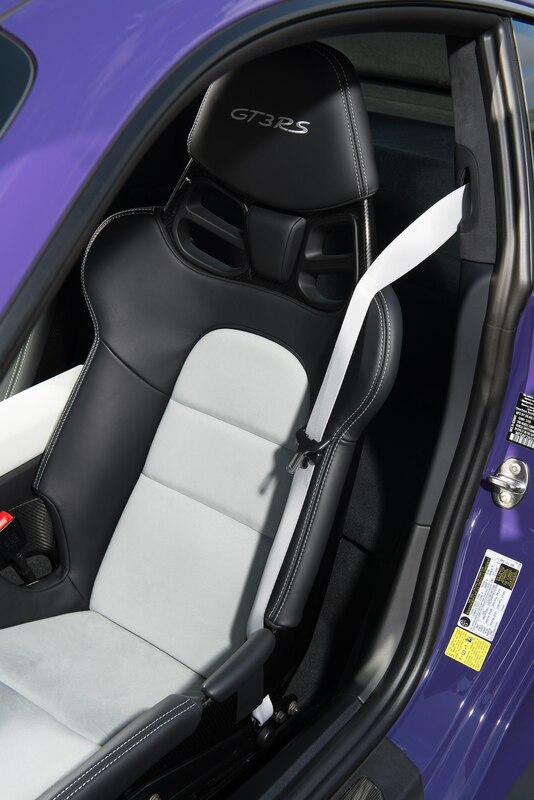 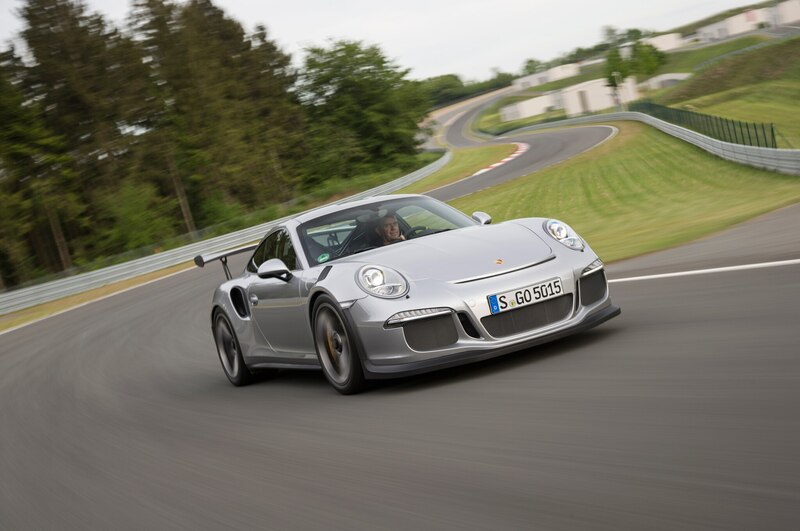 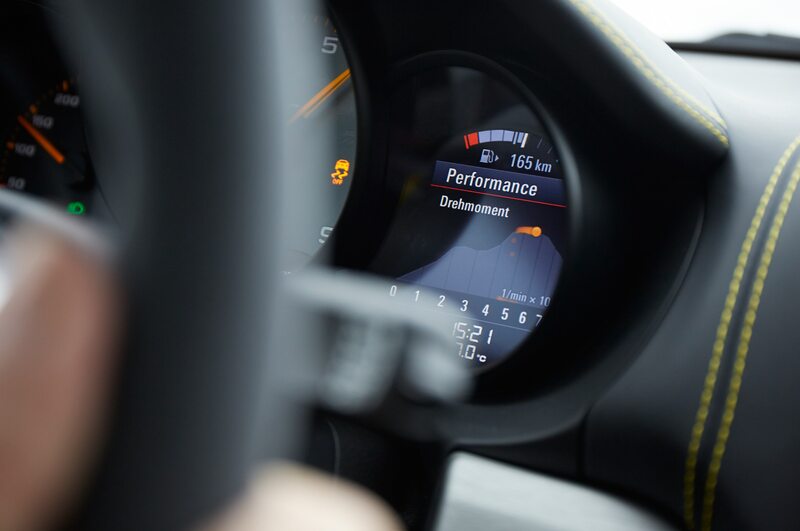 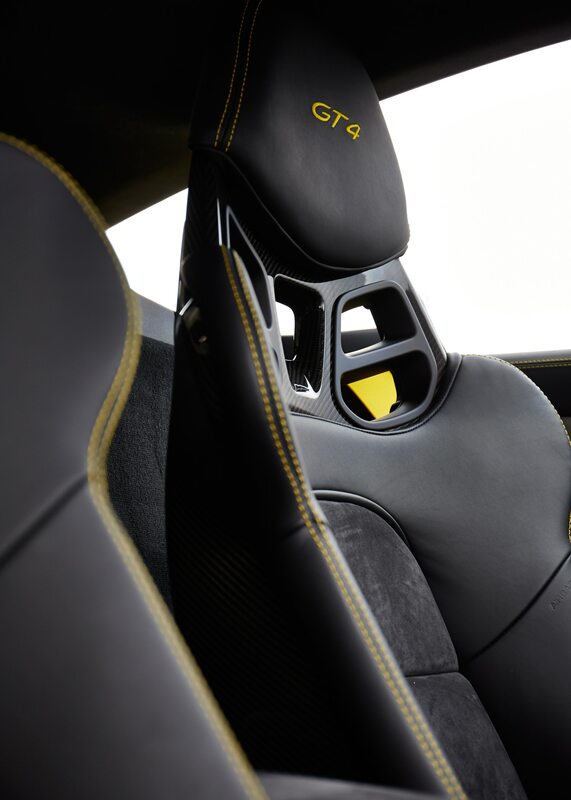 Besides serving as the homologation special for the 911 RSR race car, the GT3 RS aims at what Preuninger calls “track rats,” defined as owners who track their babies on a regular basis. 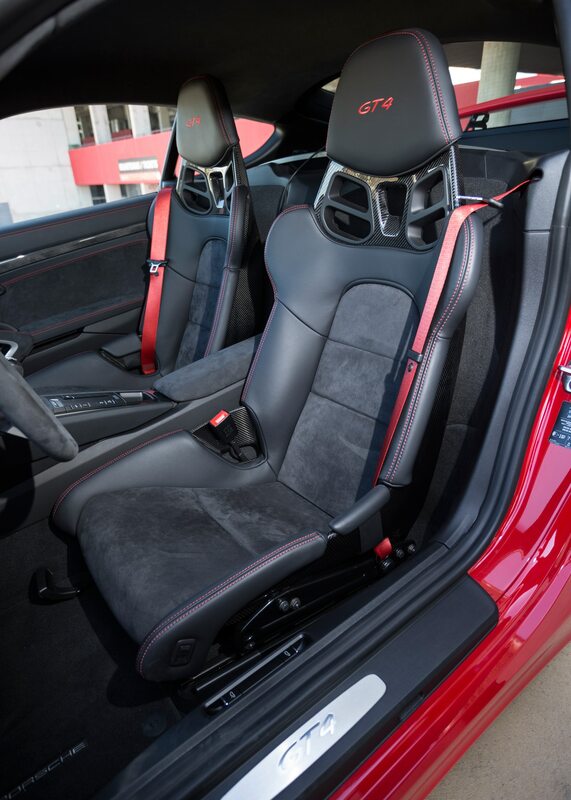 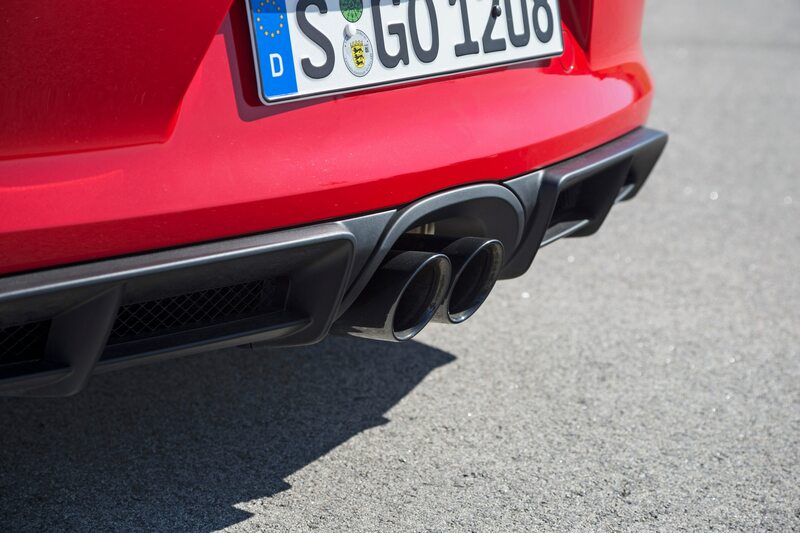 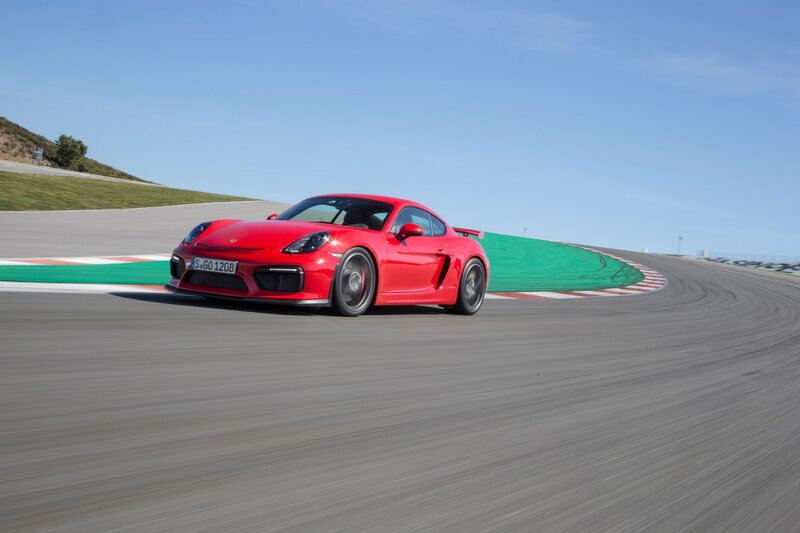 The heart of the RS is a 4.0-liter motor that produces a throaty scream and what seems to be endless acceleration as it winds freely to the 8,800-rpm redline. 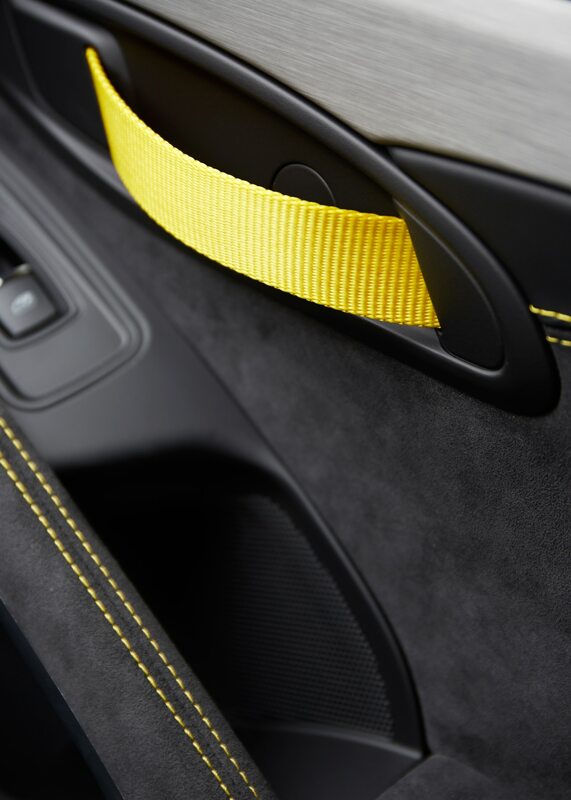 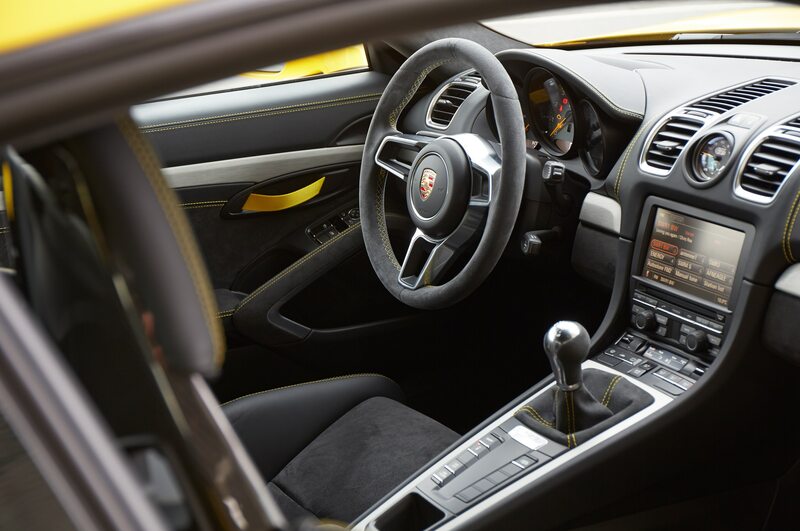 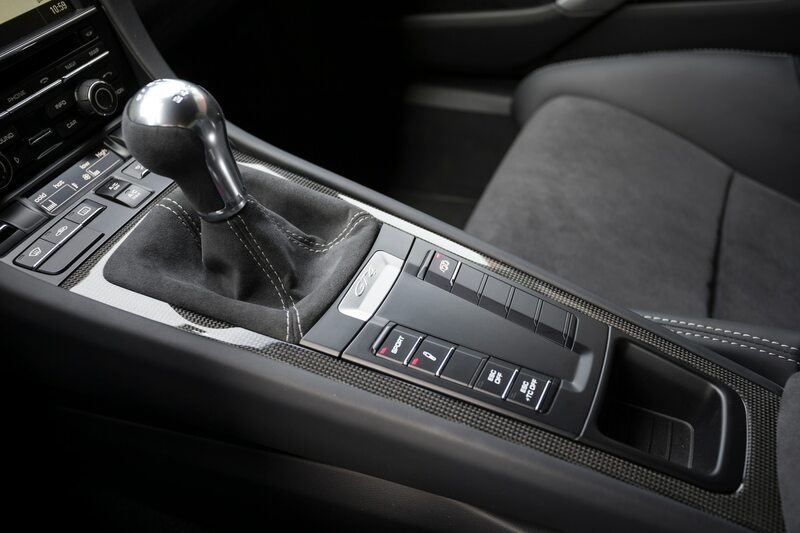 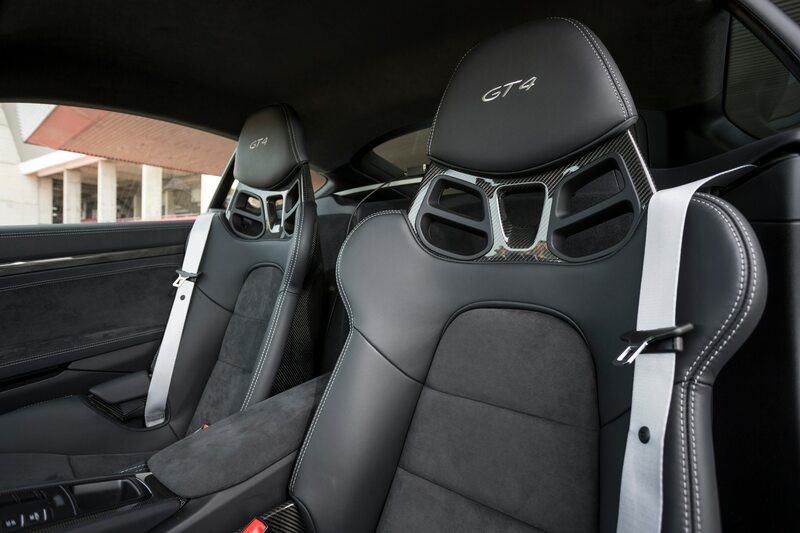 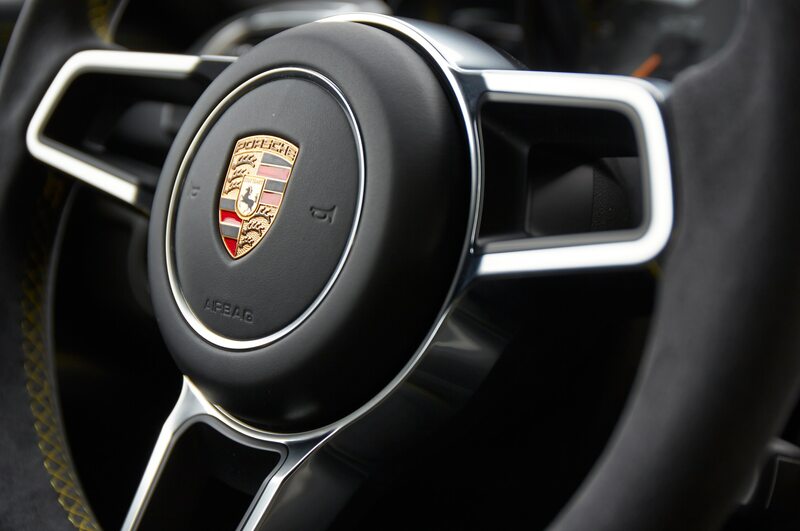 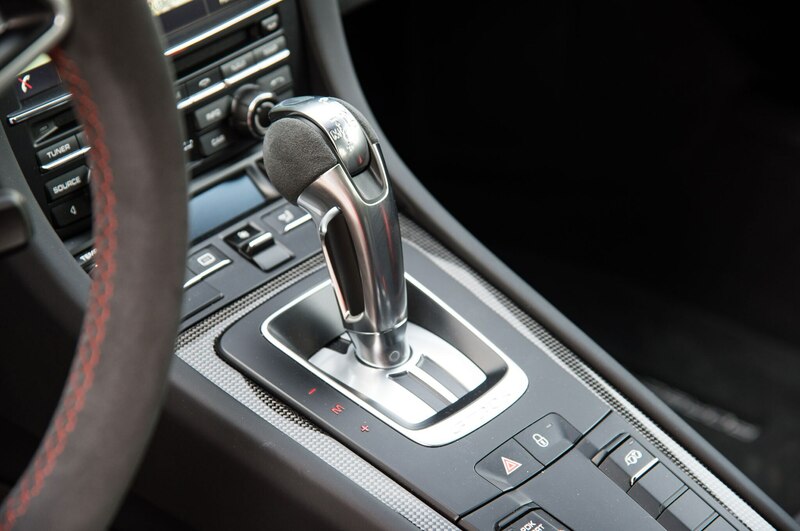 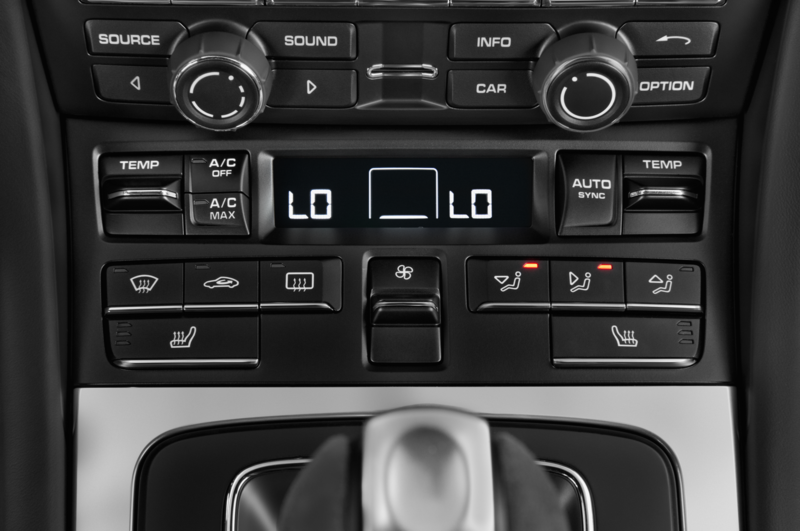 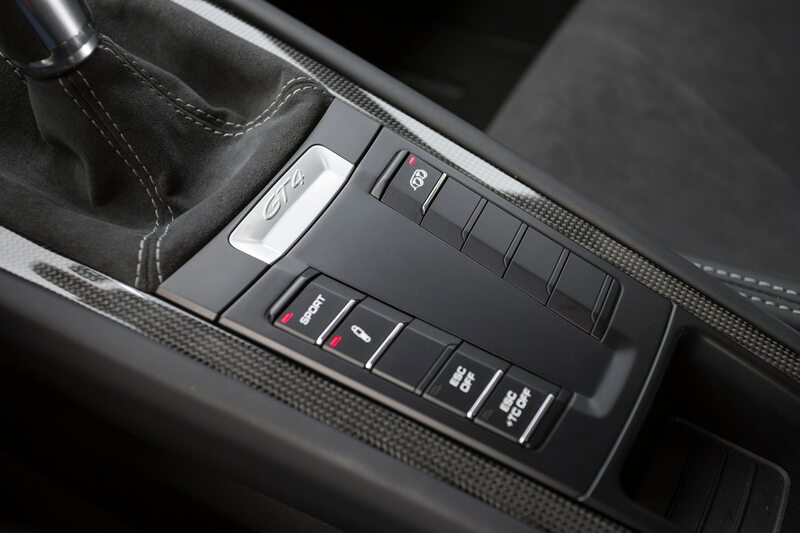 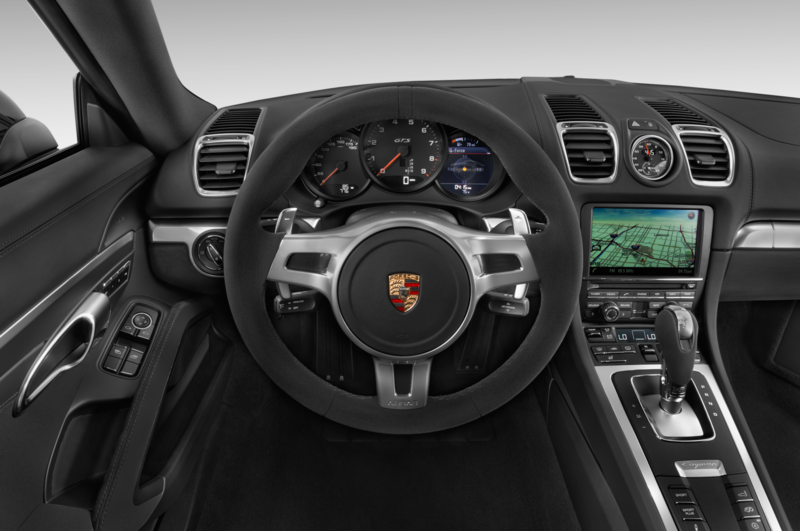 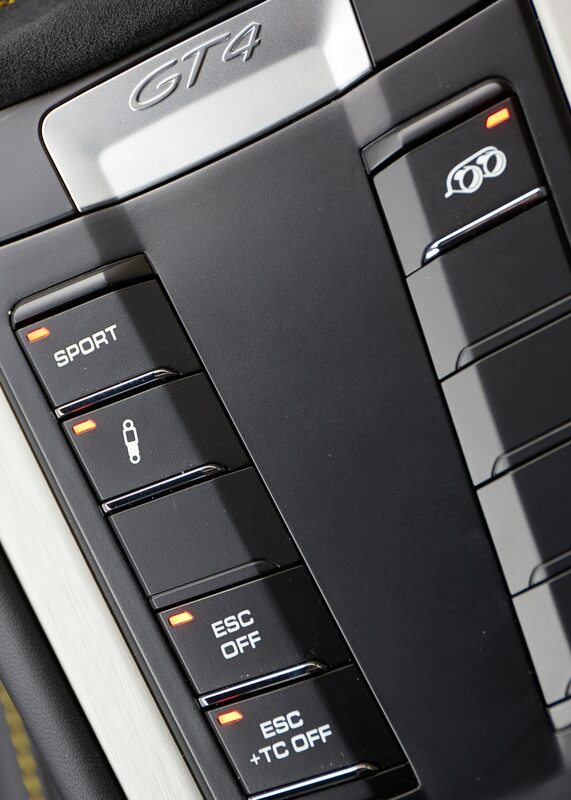 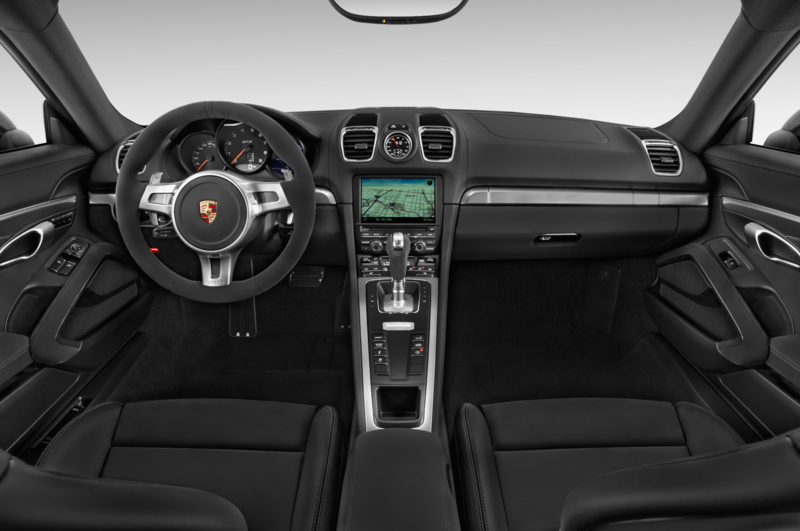 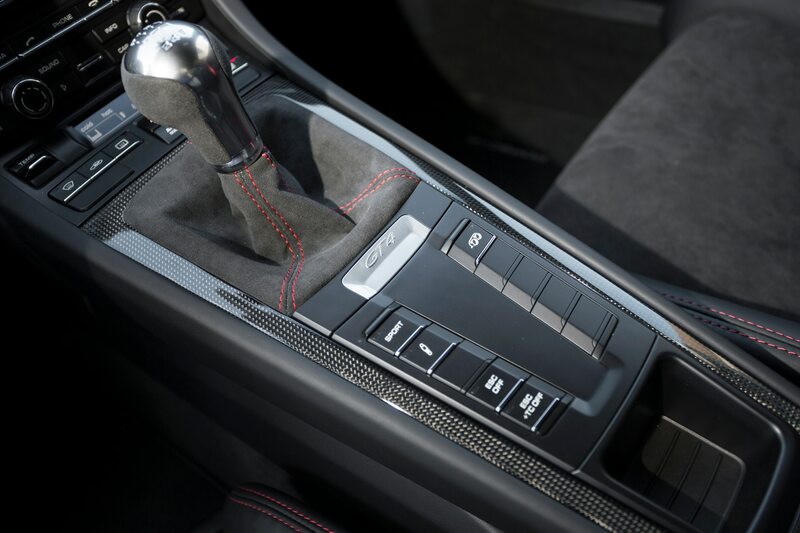 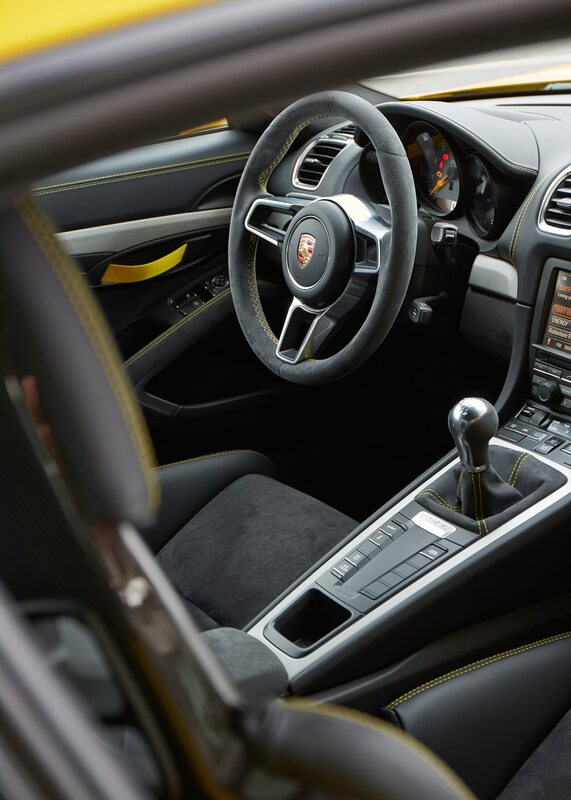 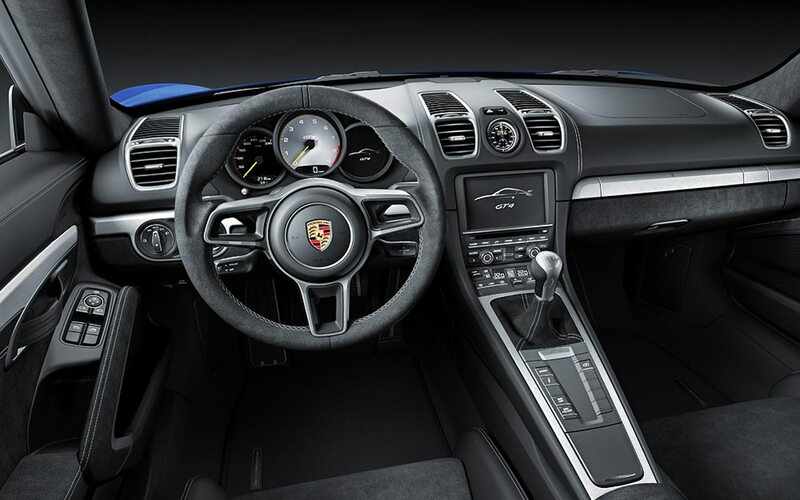 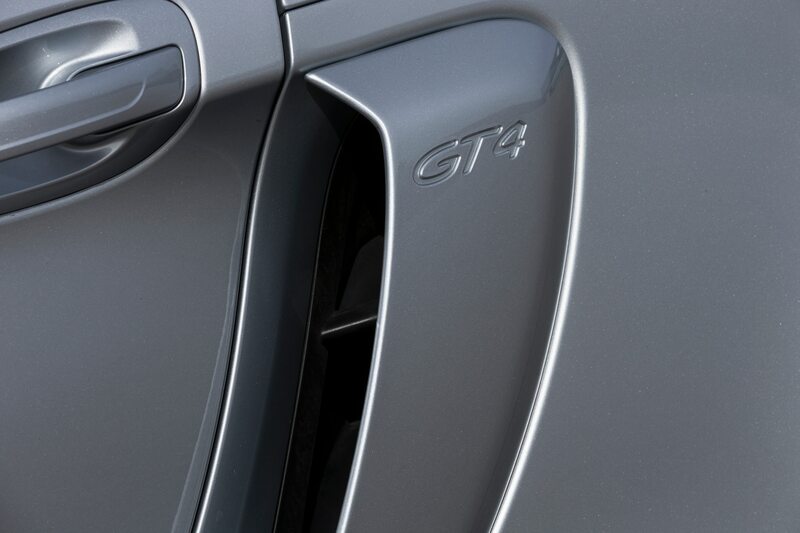 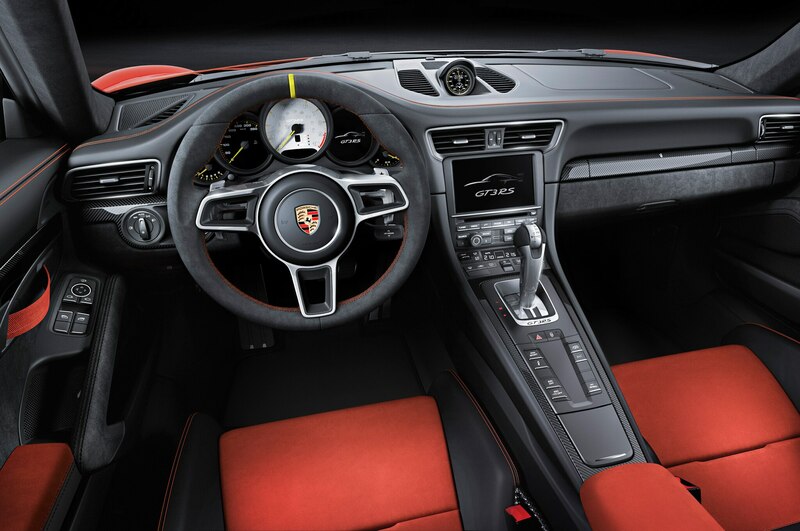 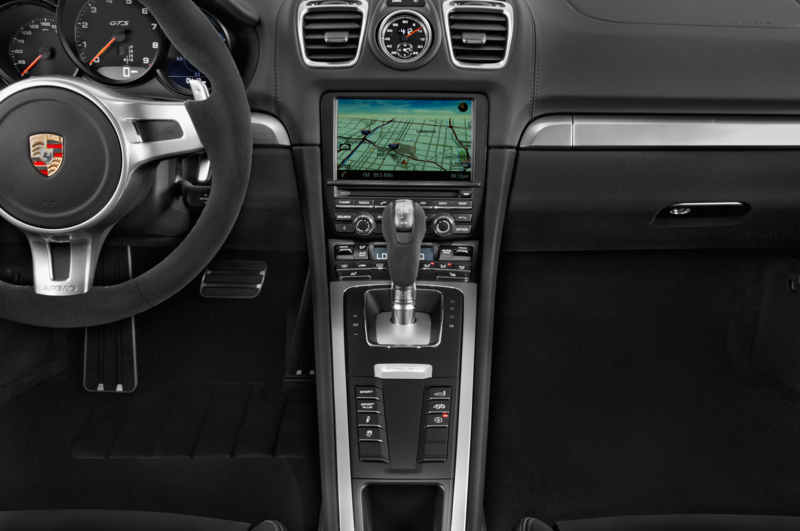 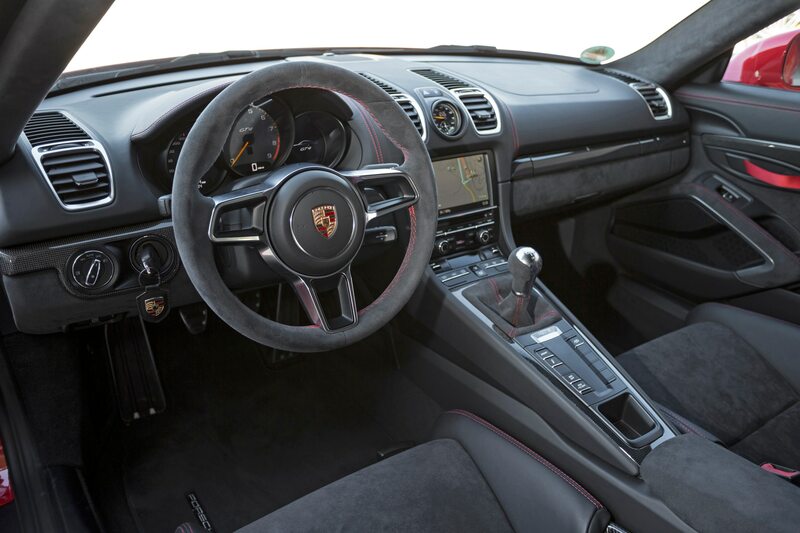 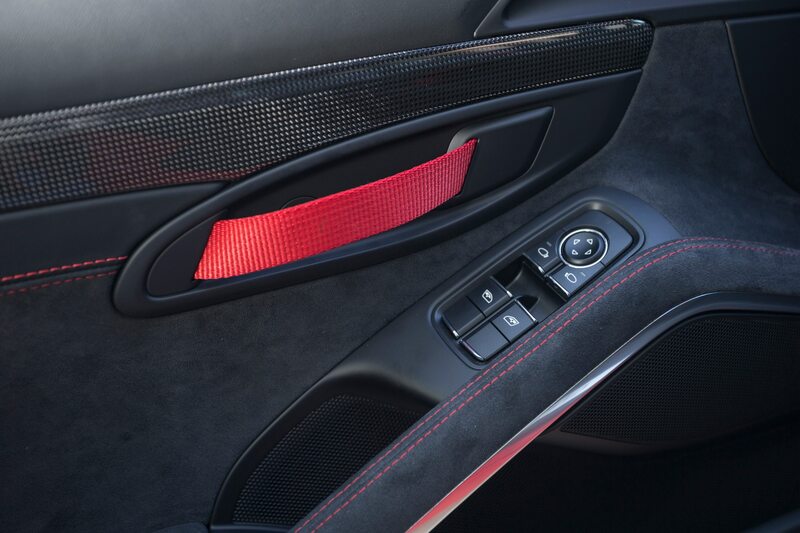 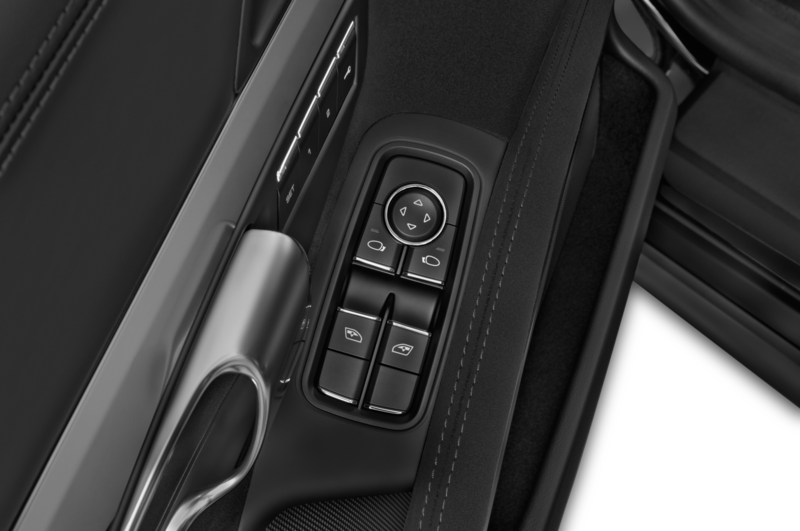 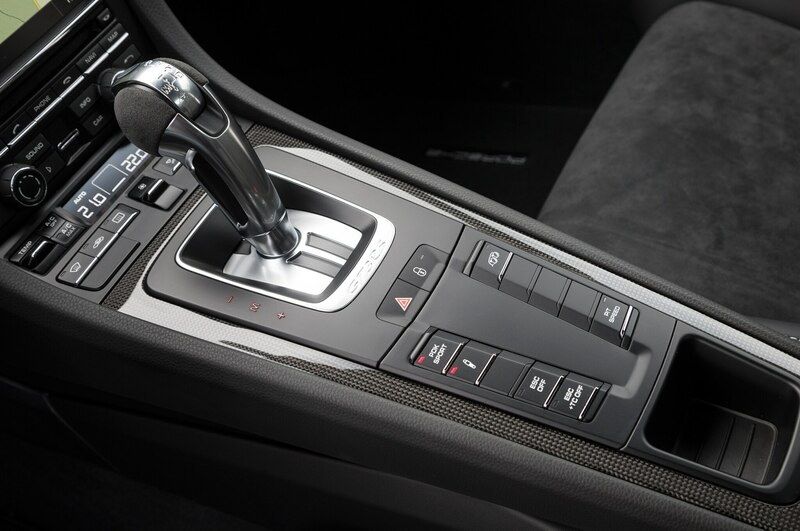 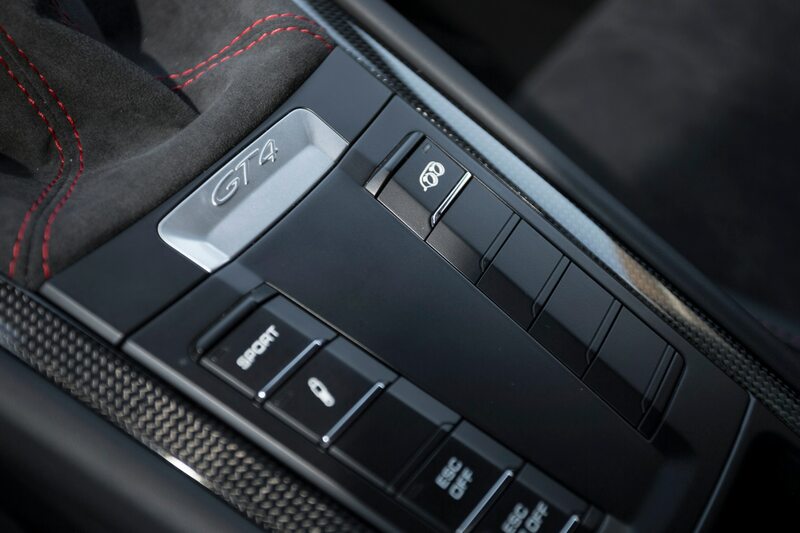 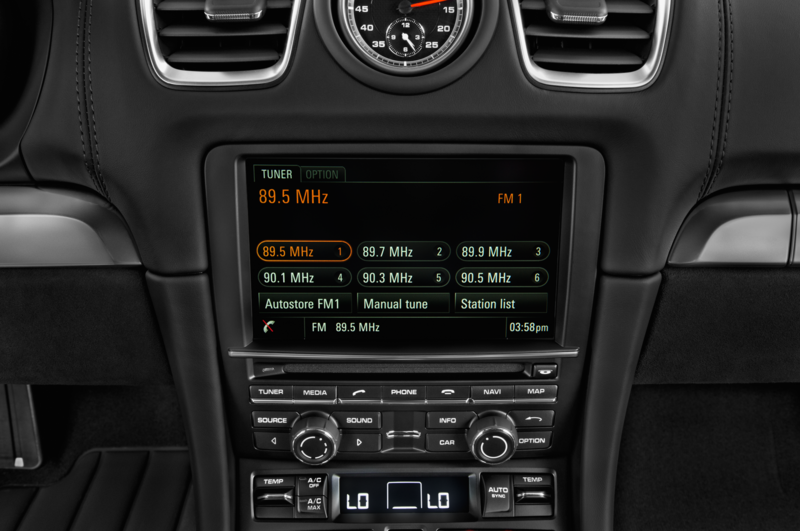 The only transmission is a dual-clutch PDK, and it’s so fast and efficient in Sport mode that all you have to do is select Drive and let the computer do all the rest. 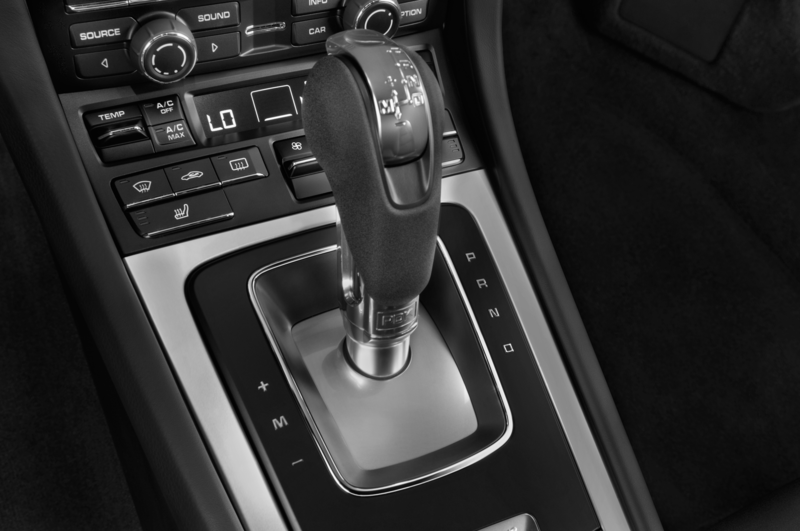 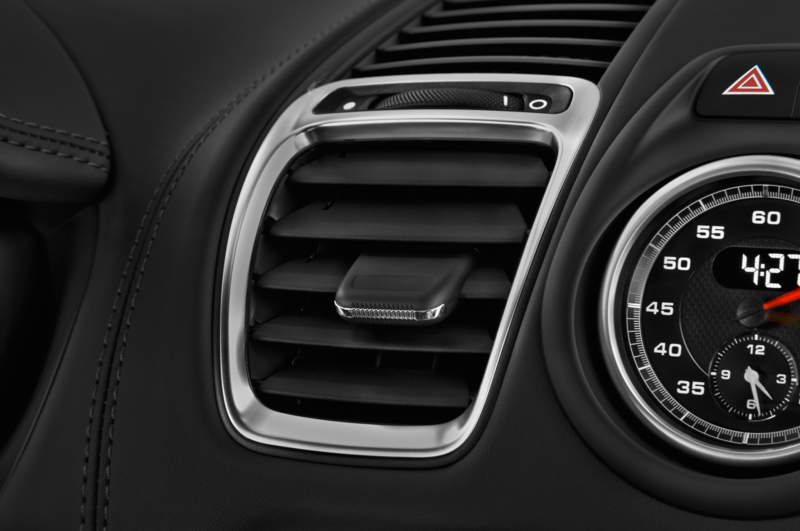 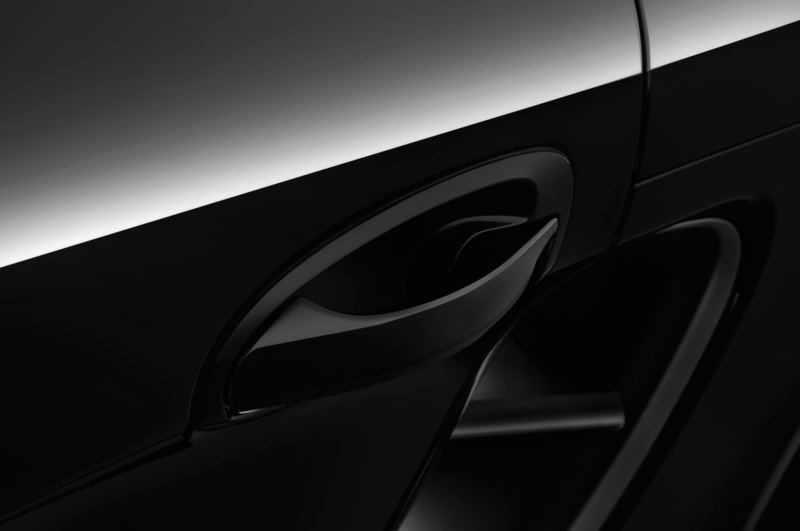 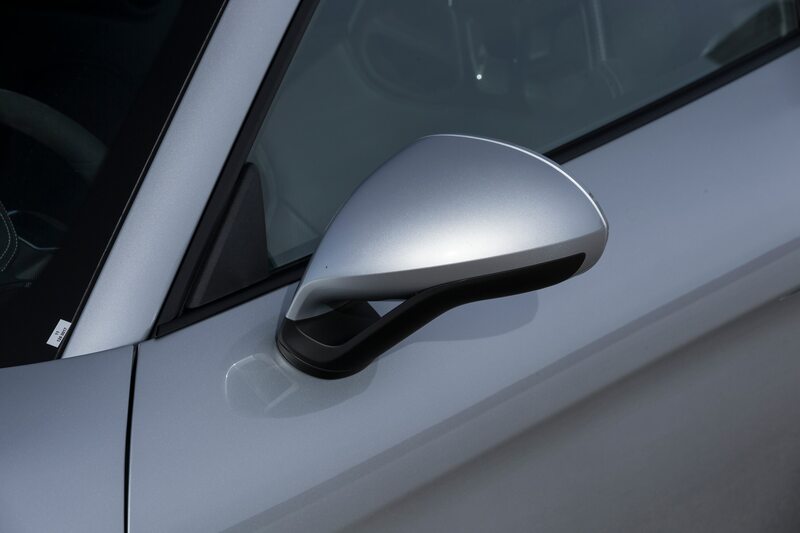 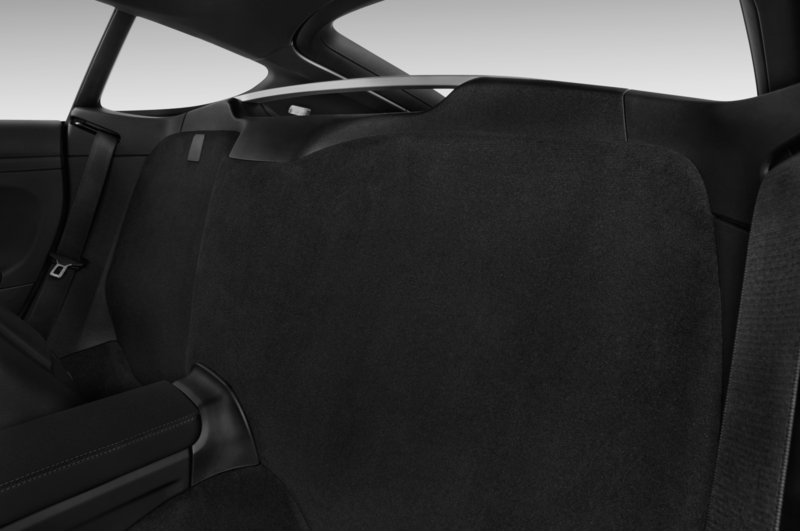 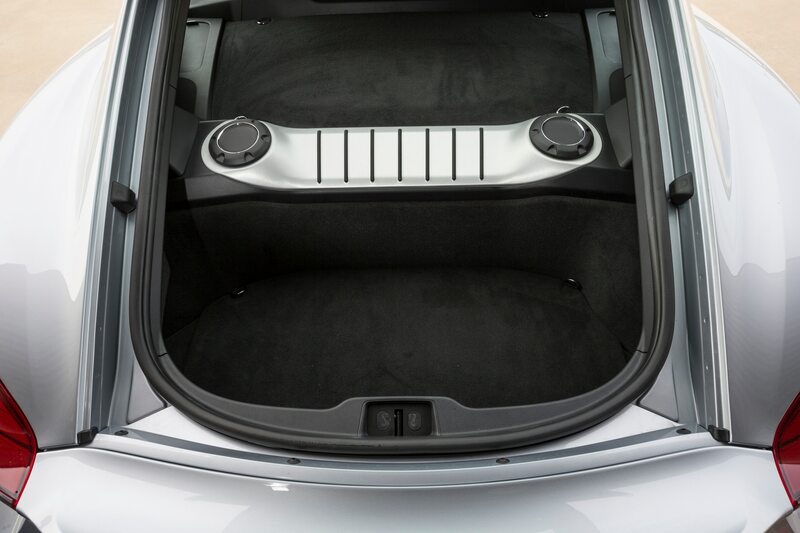 An added bonus of the gearbox is that its hydraulic unit does double-duty driving the magical electronic differential. 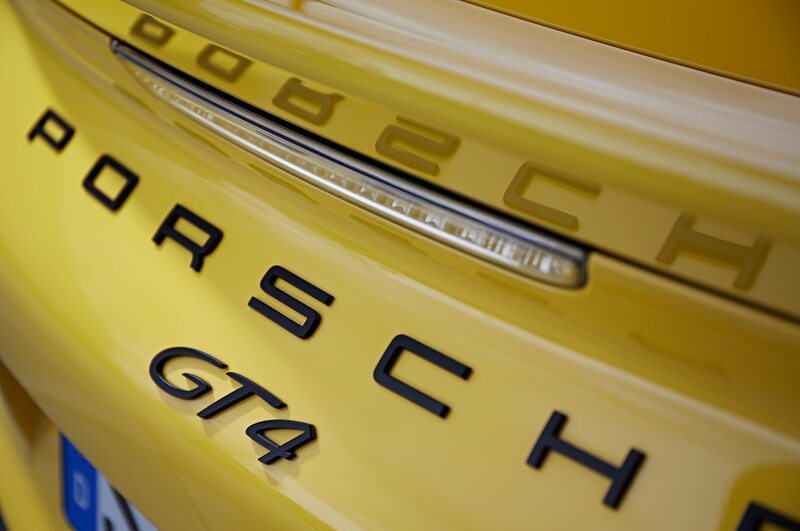 Porsche divides the enthusiast market into segments sliced as delicately as maguro sashimi at a high-end sushi bar. 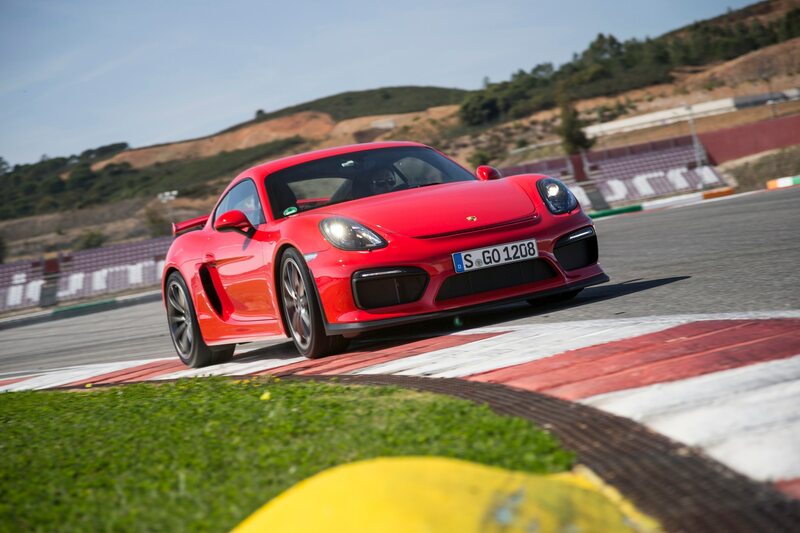 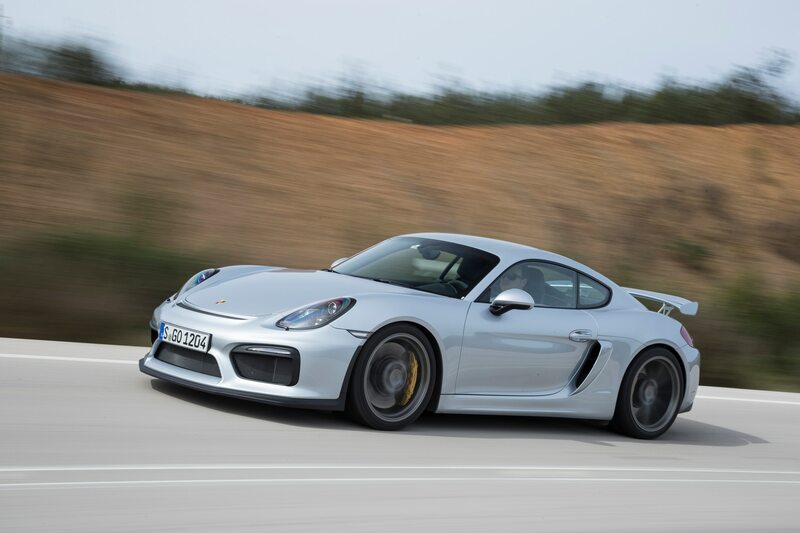 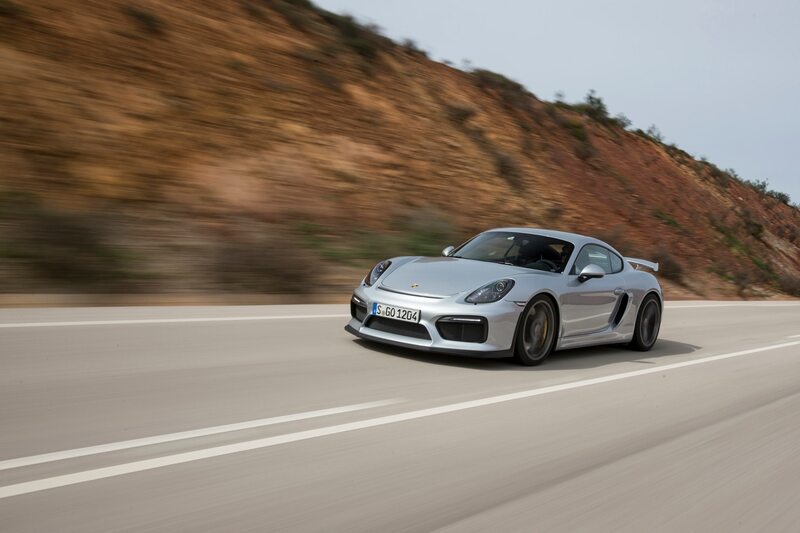 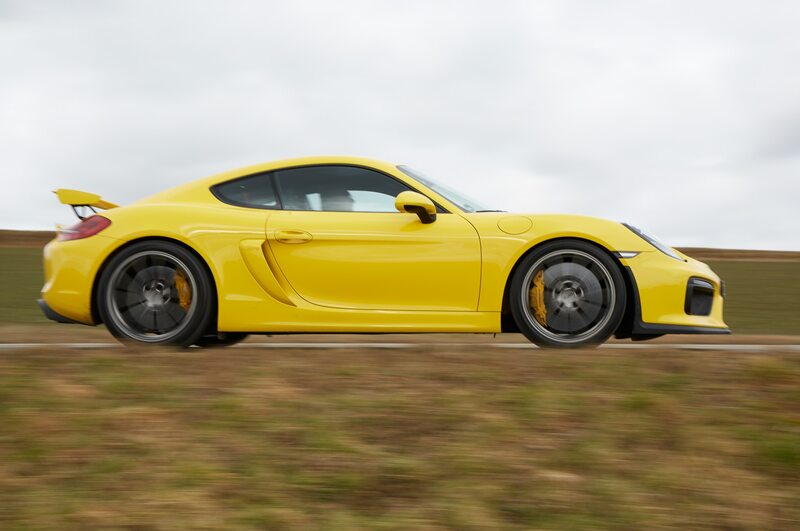 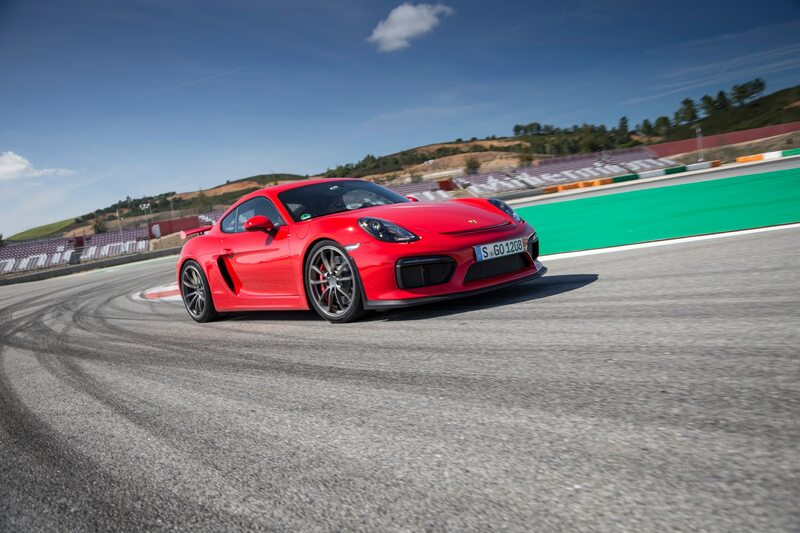 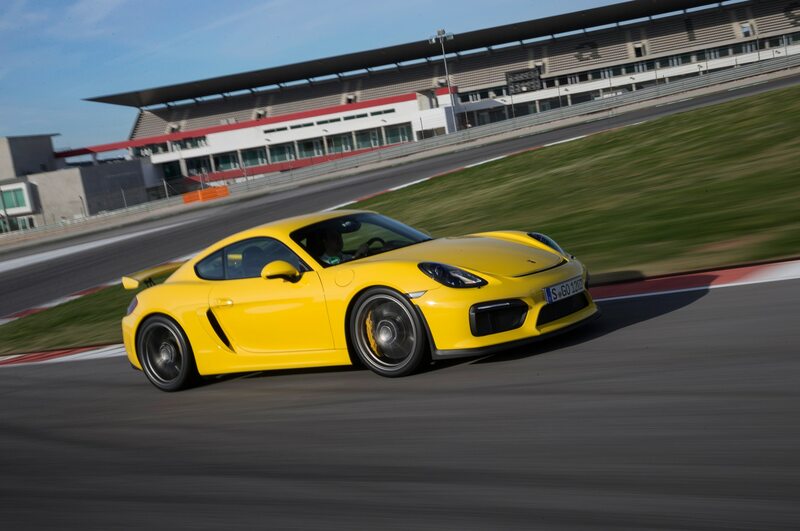 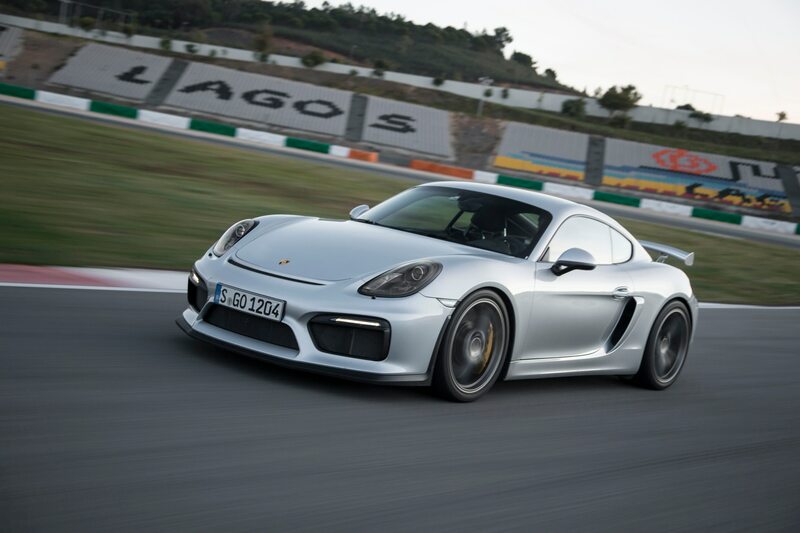 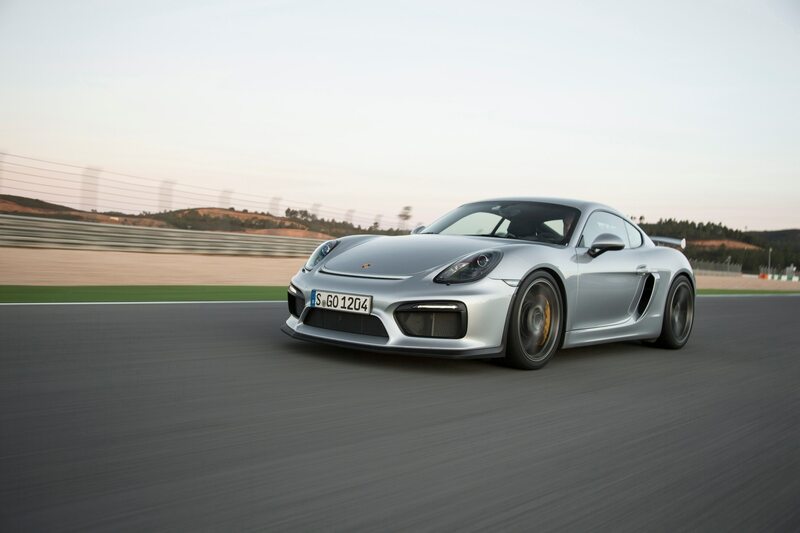 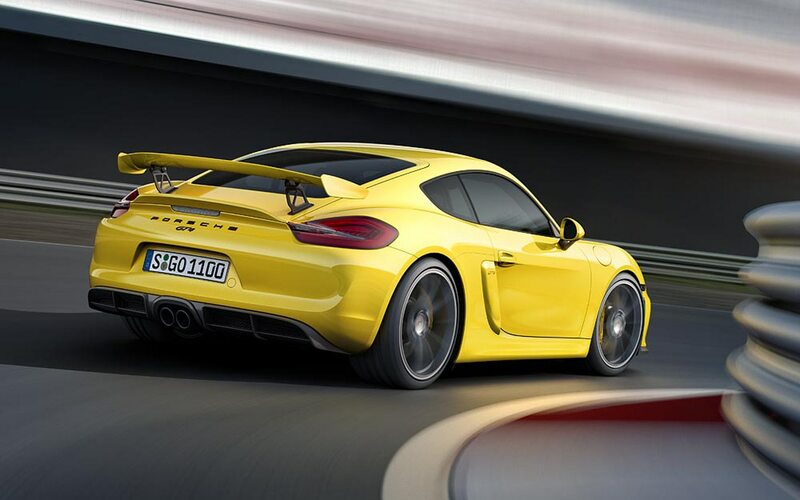 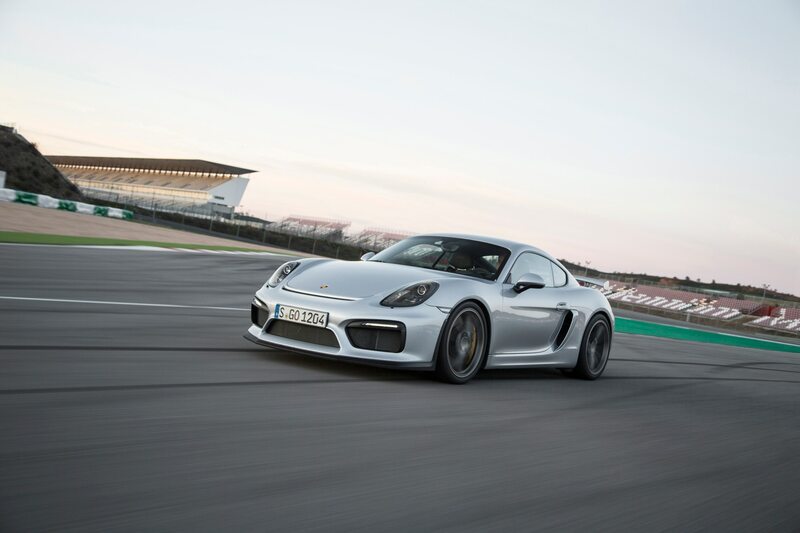 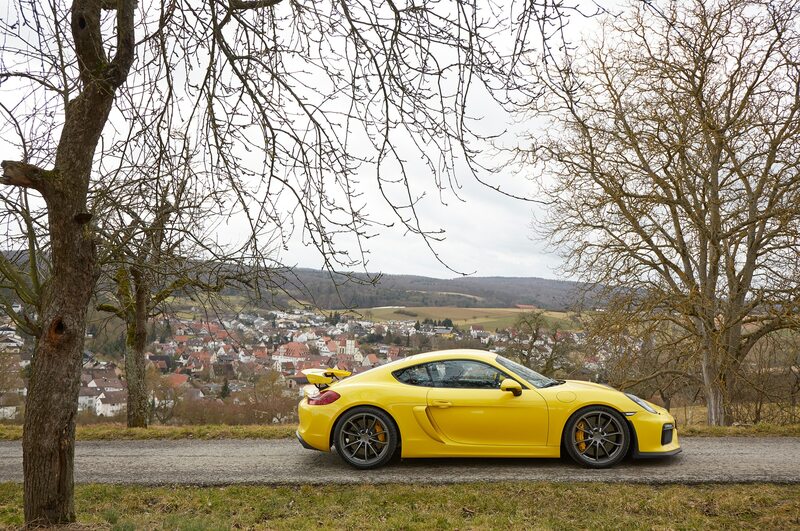 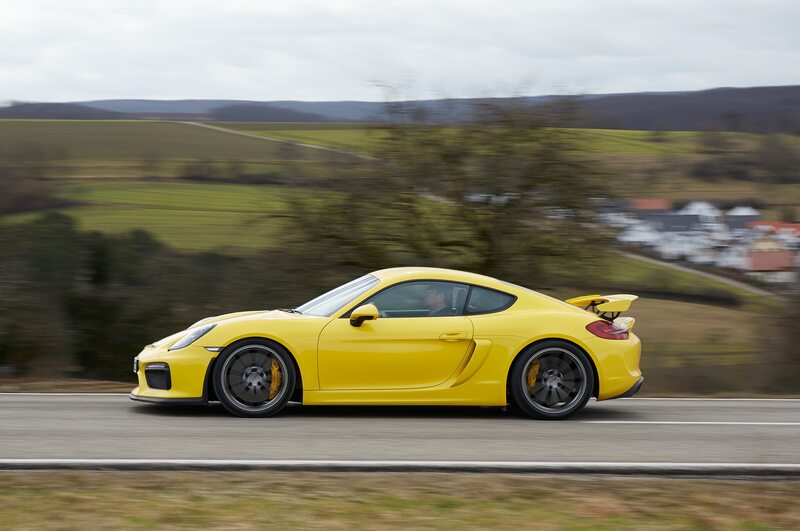 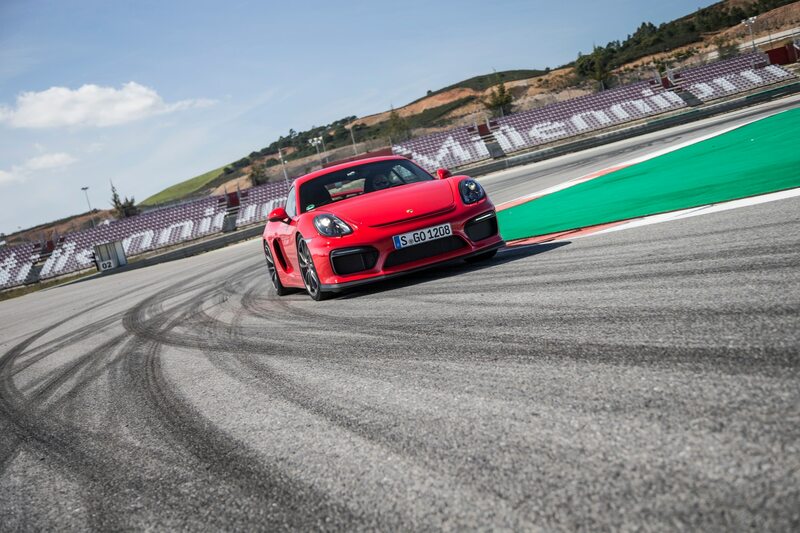 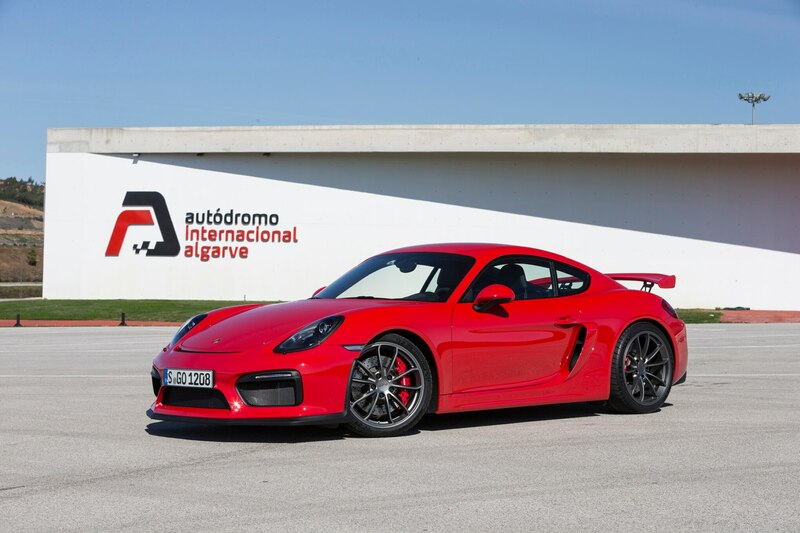 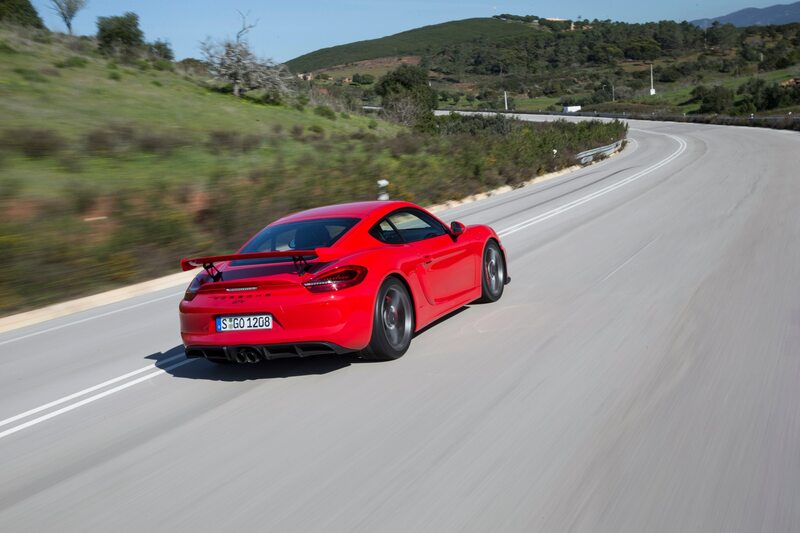 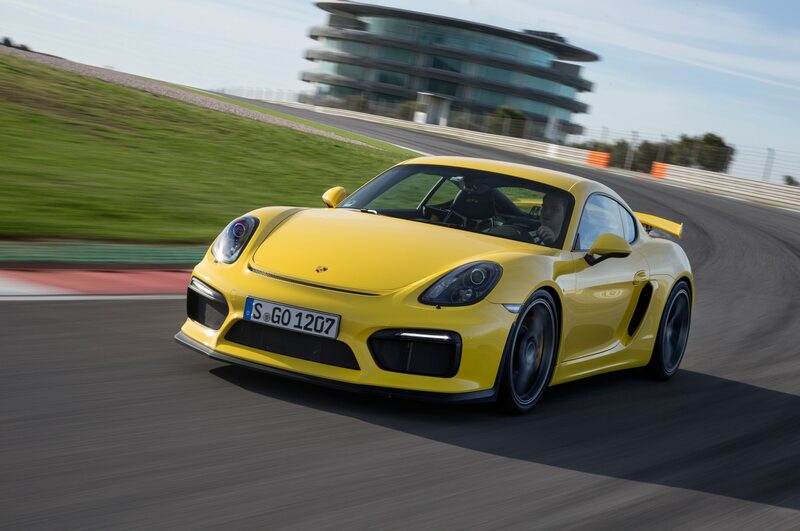 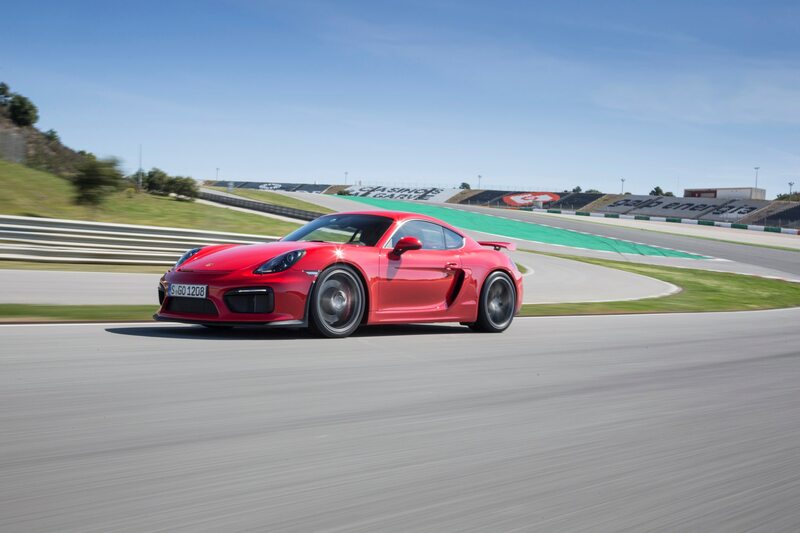 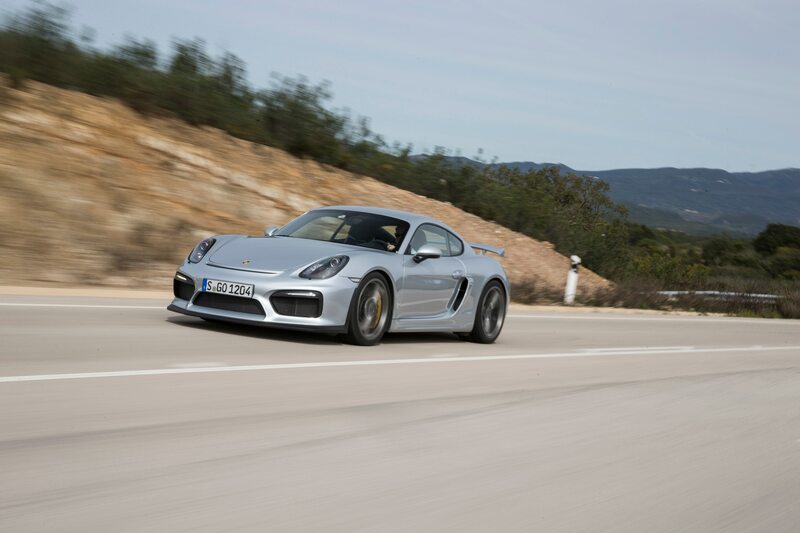 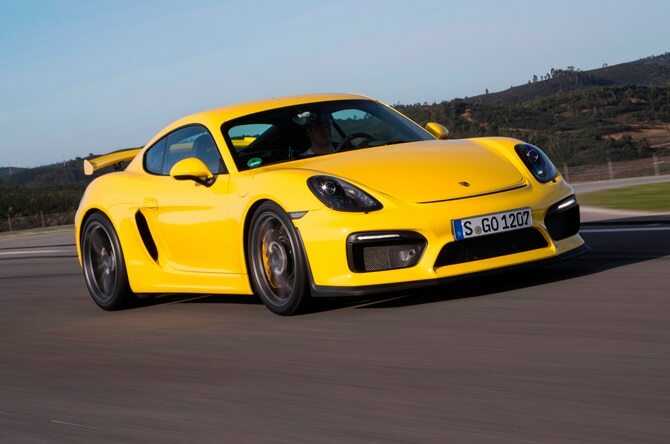 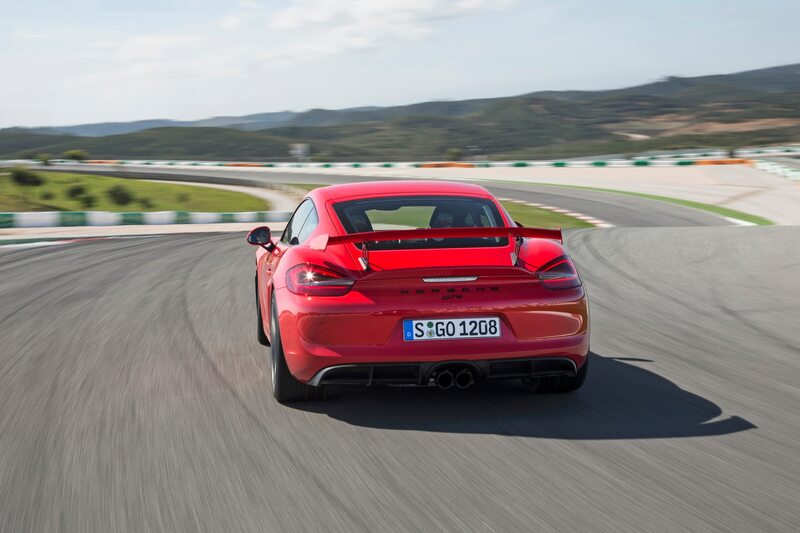 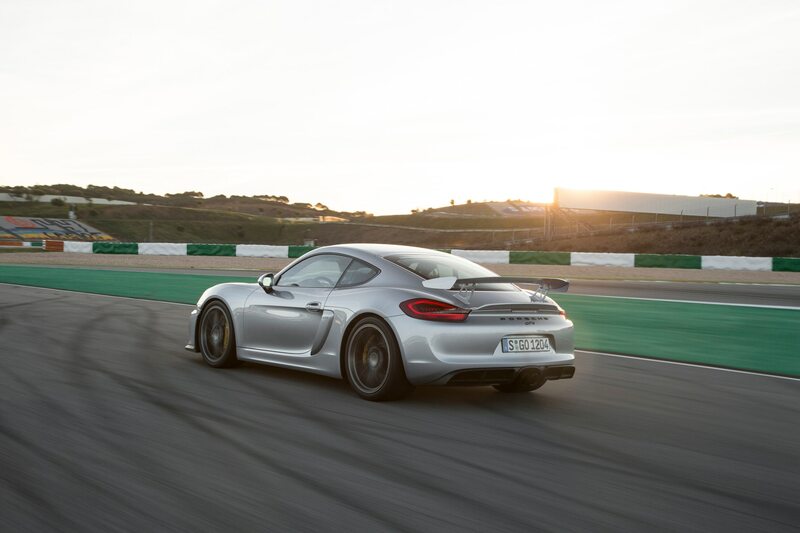 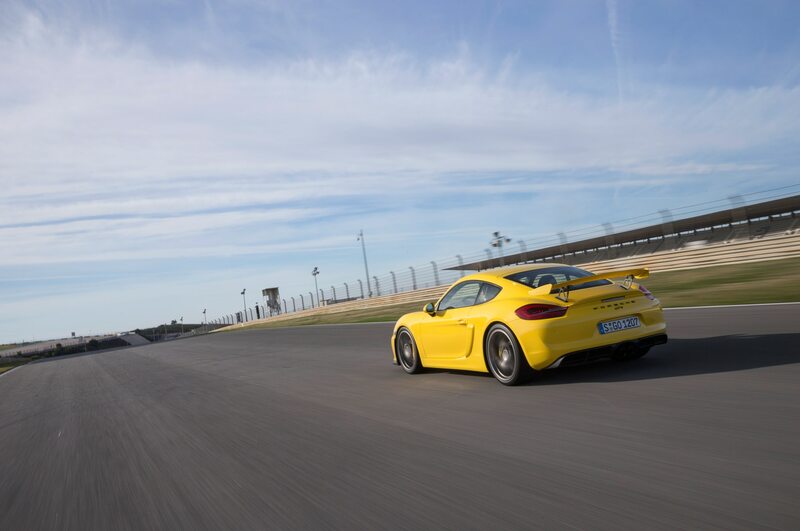 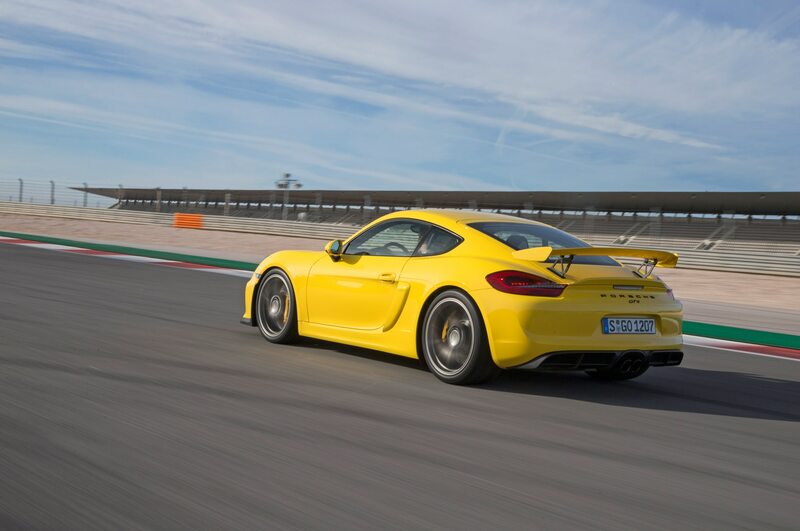 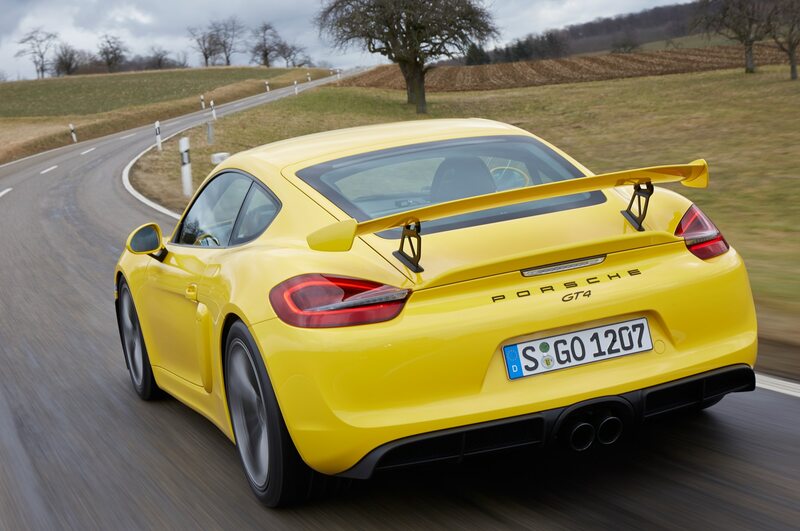 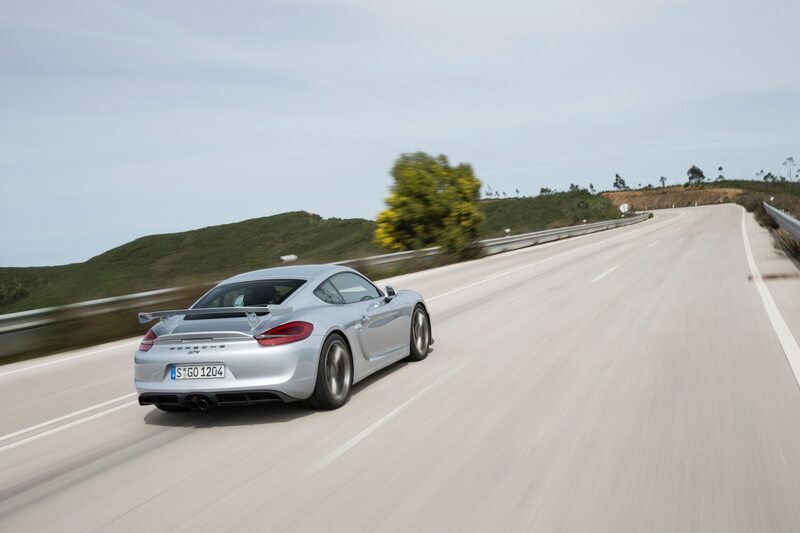 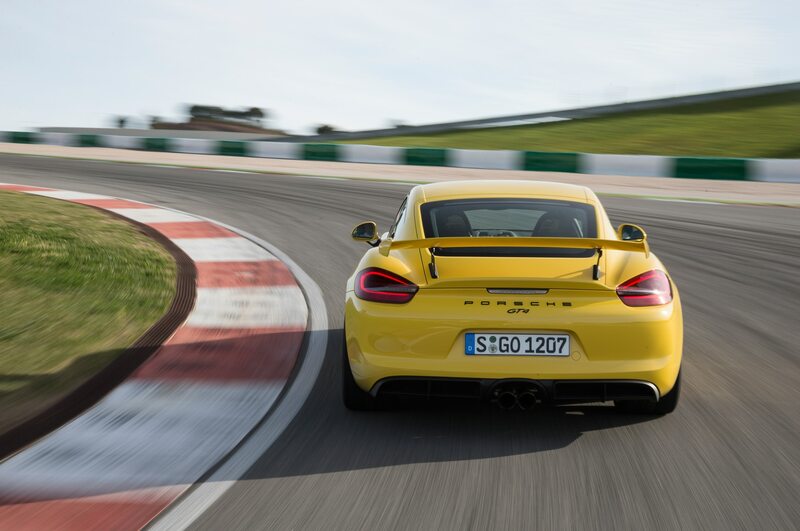 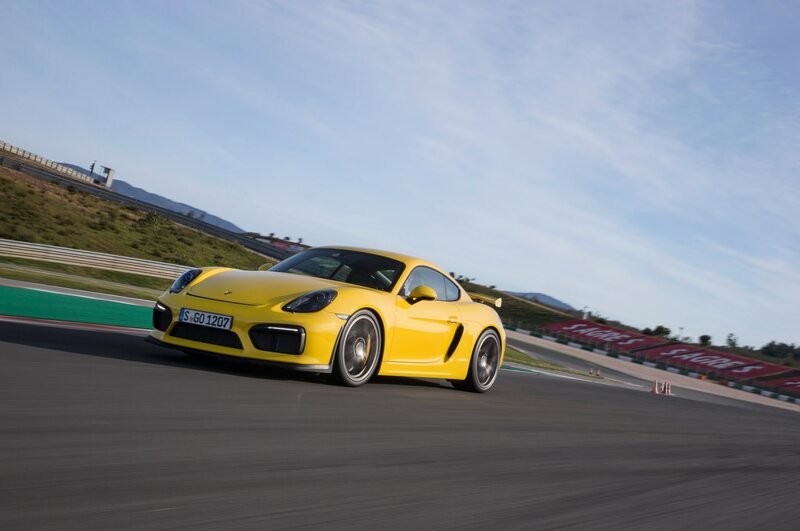 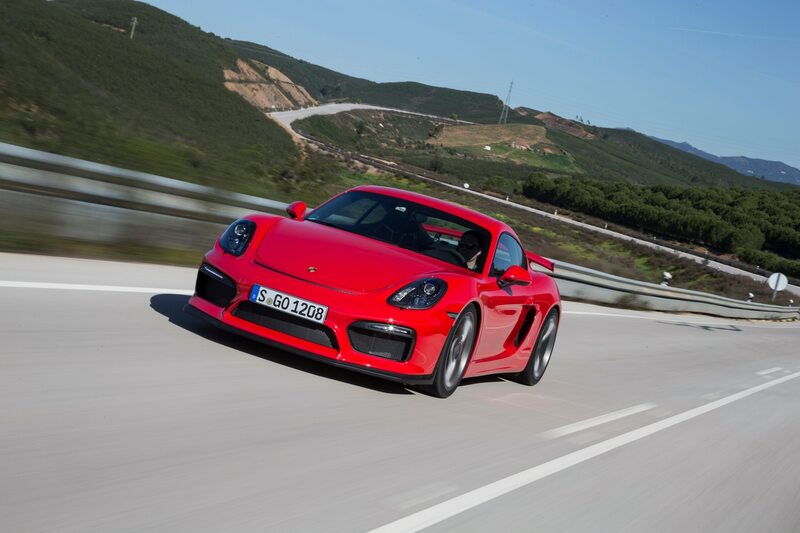 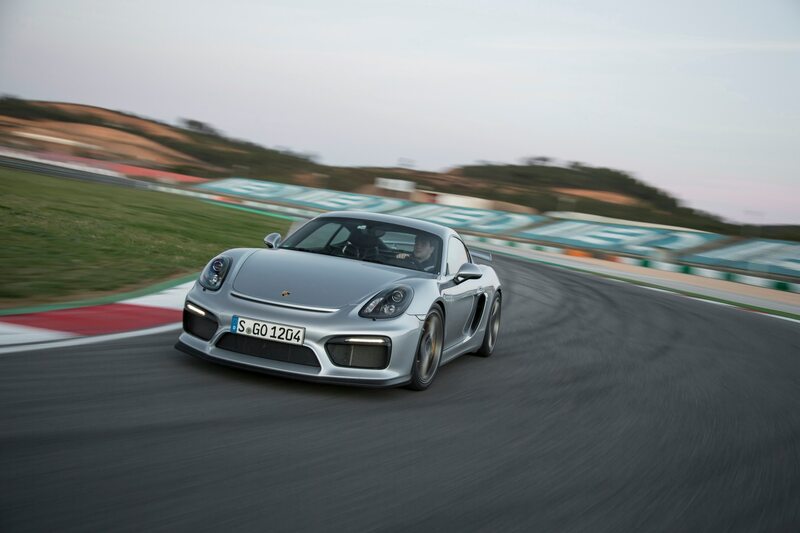 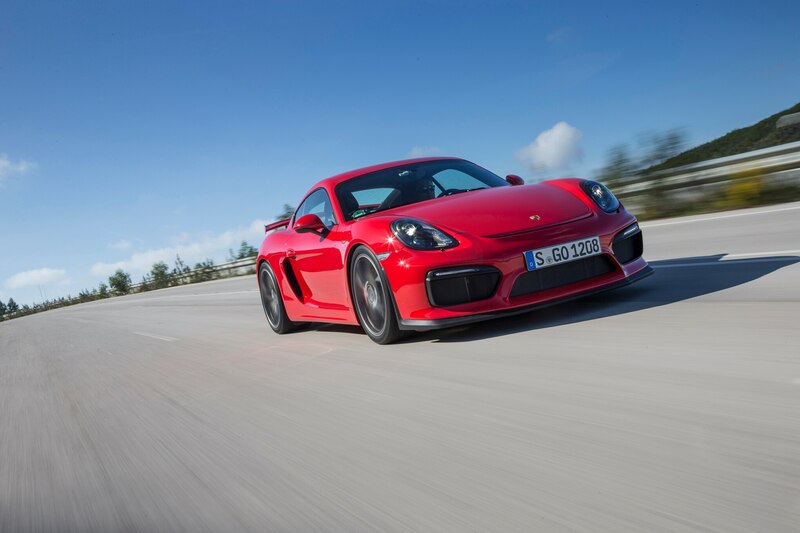 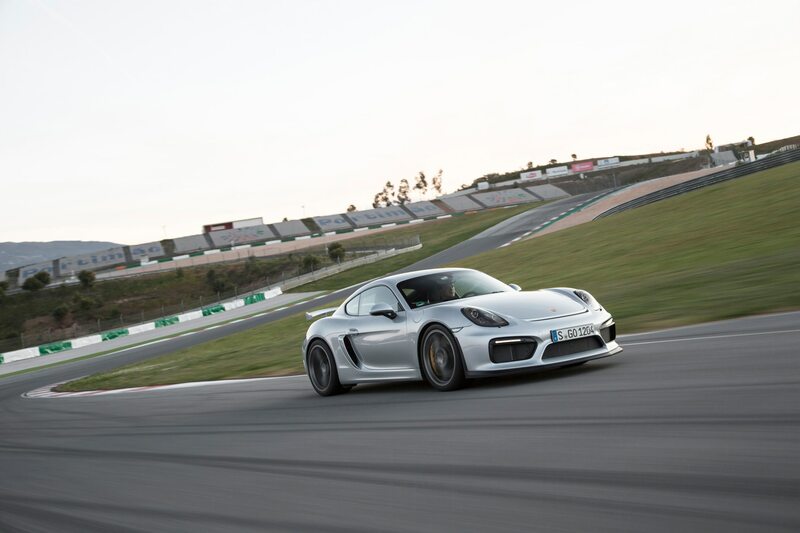 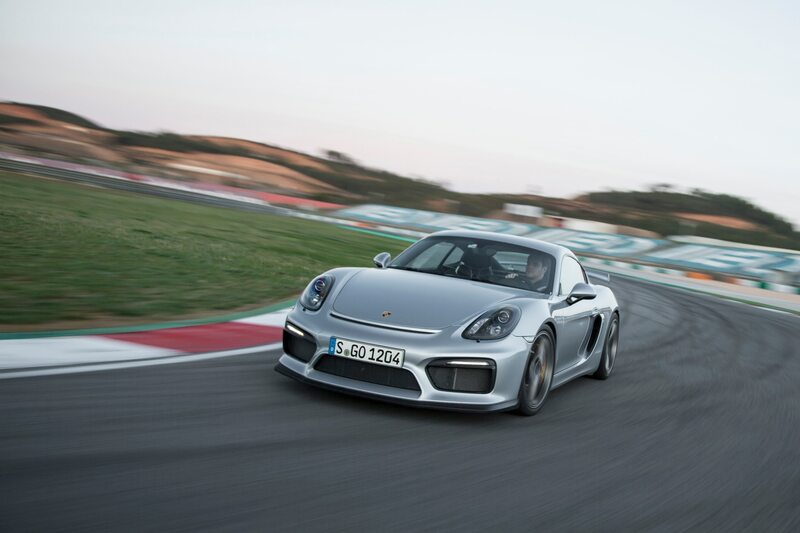 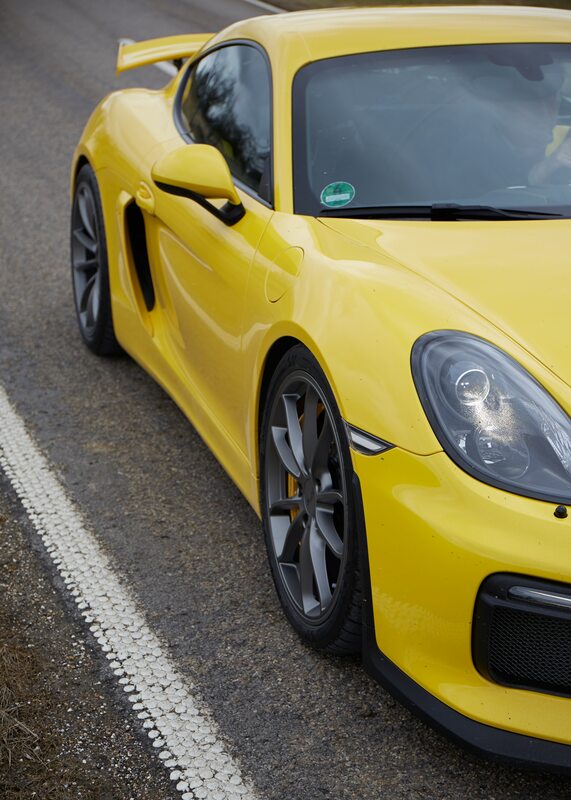 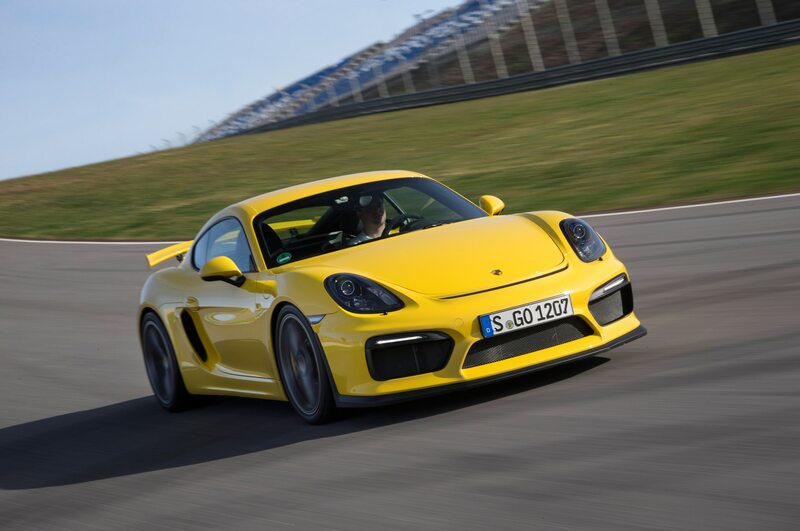 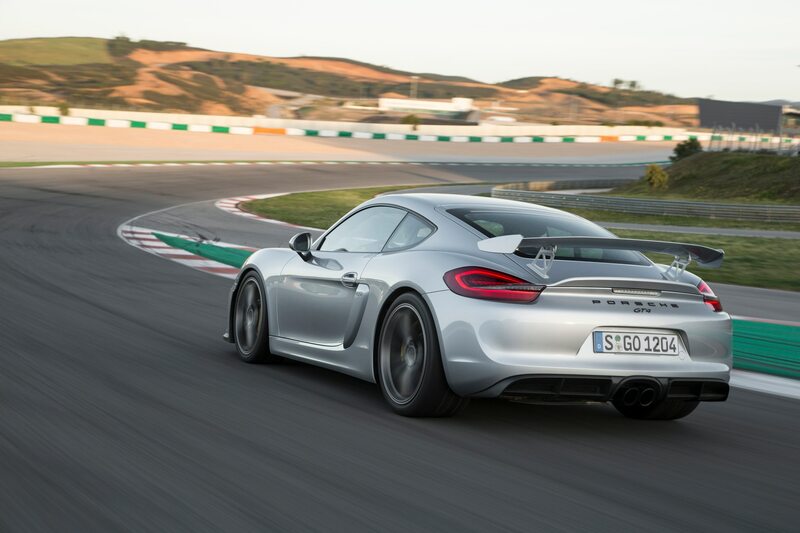 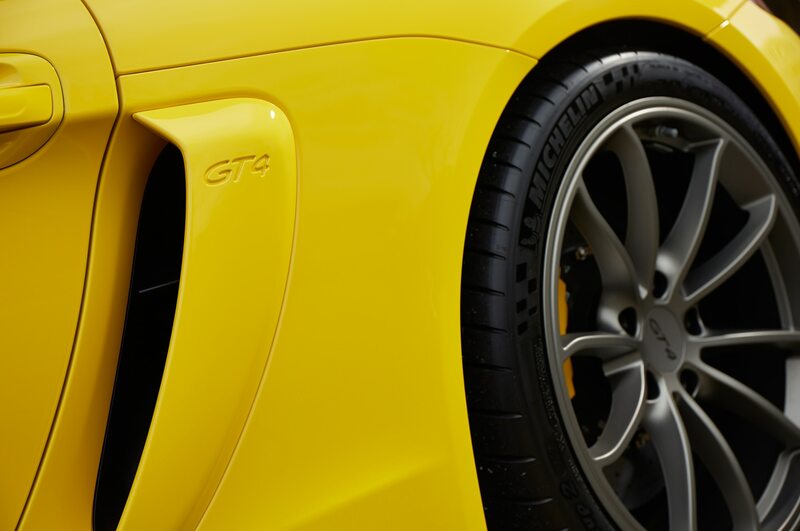 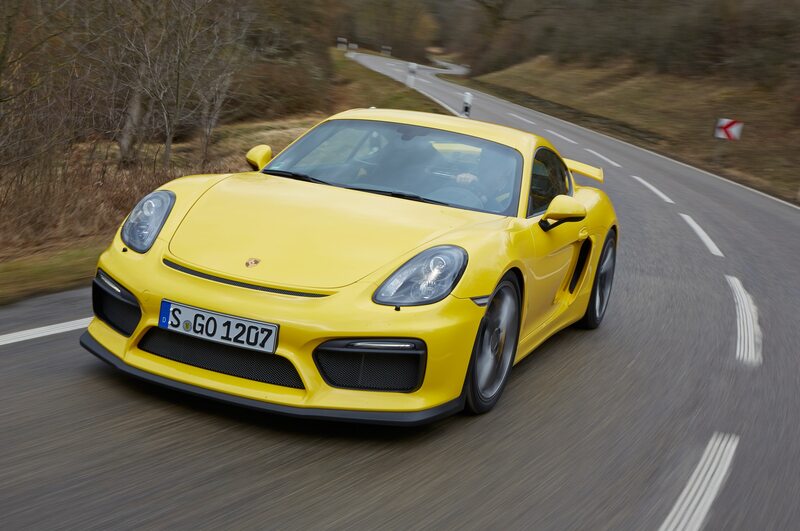 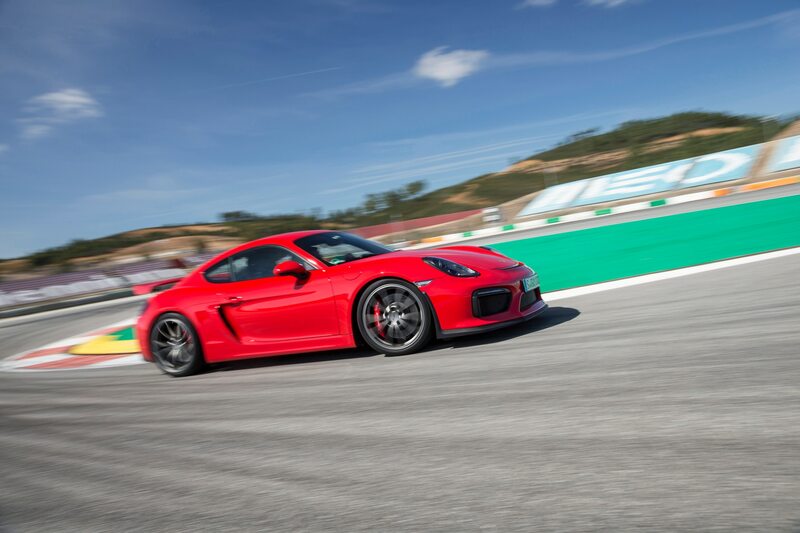 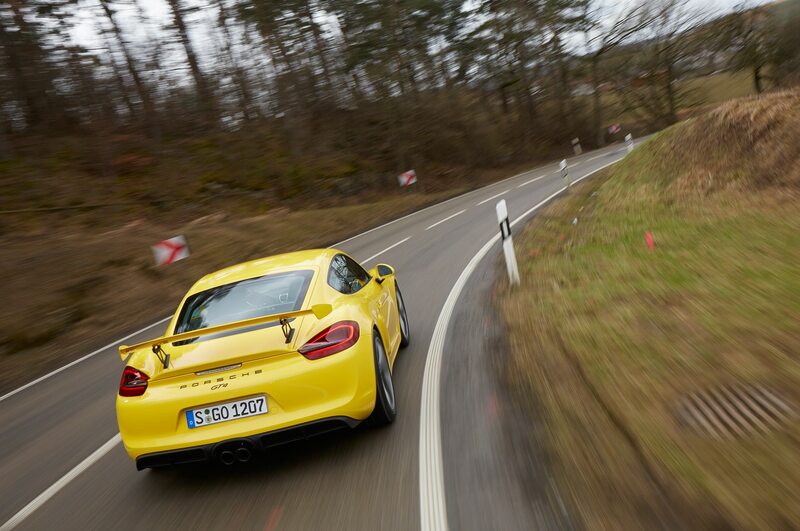 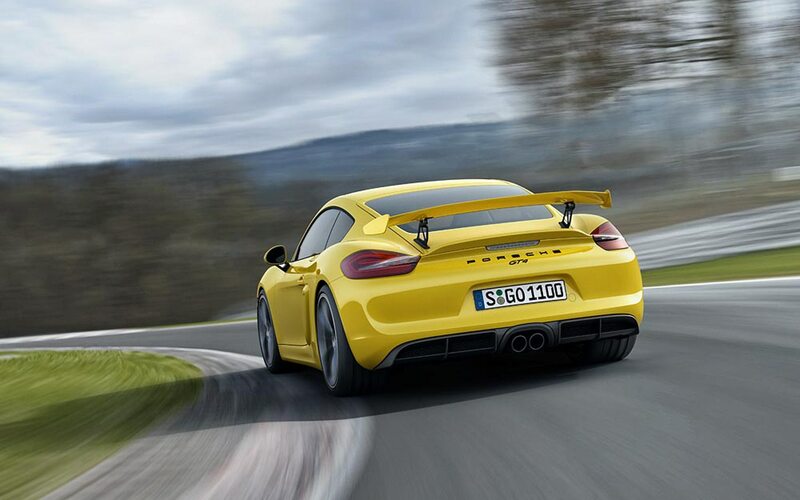 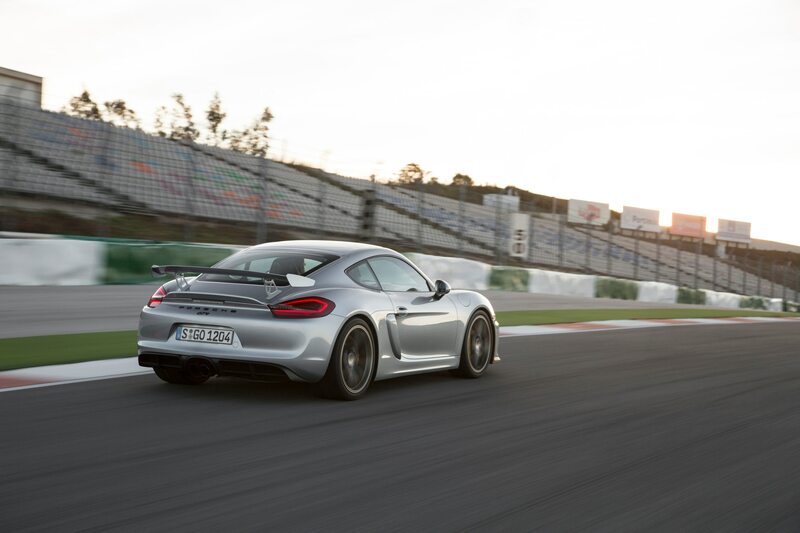 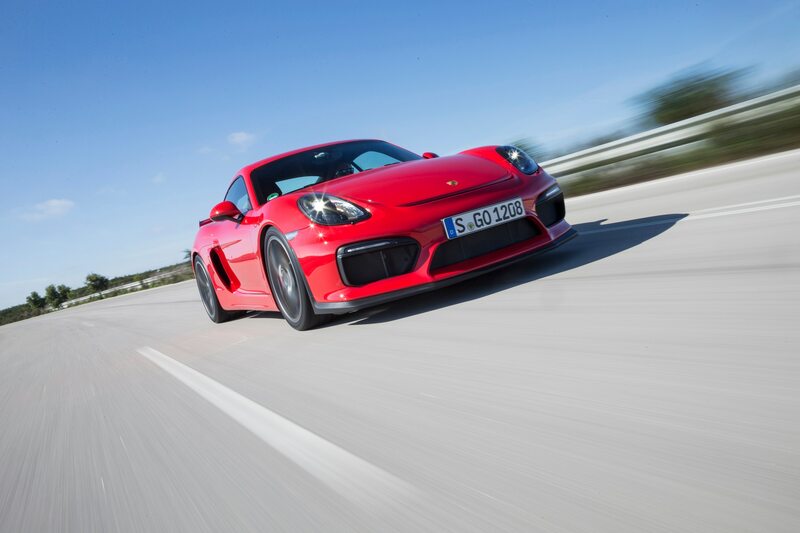 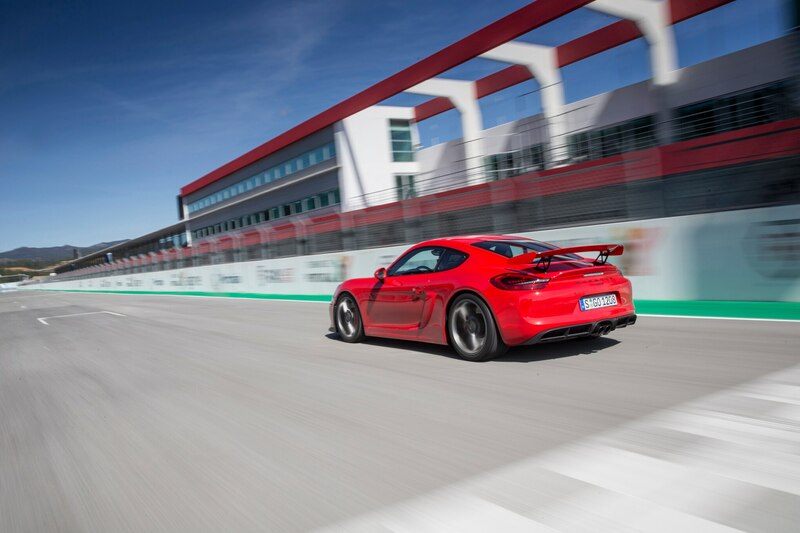 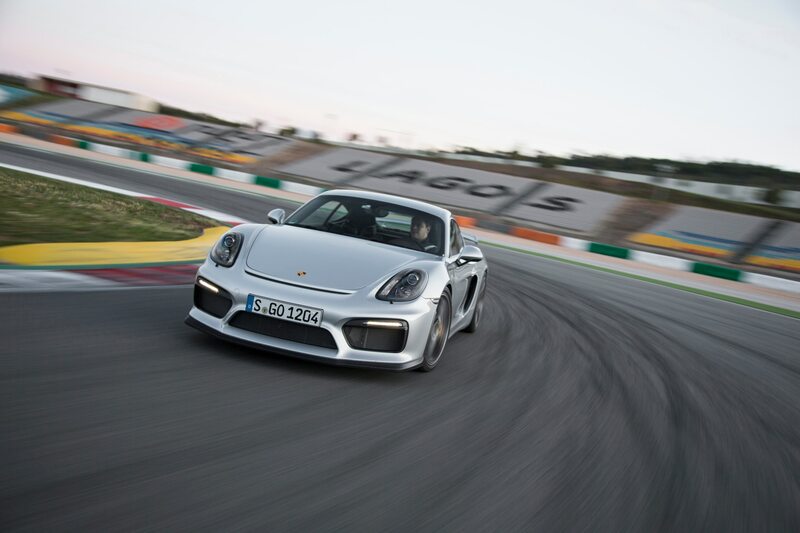 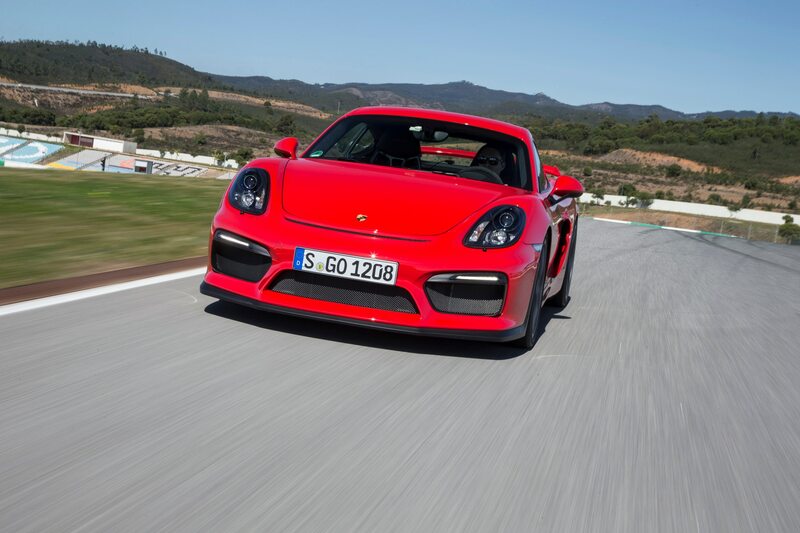 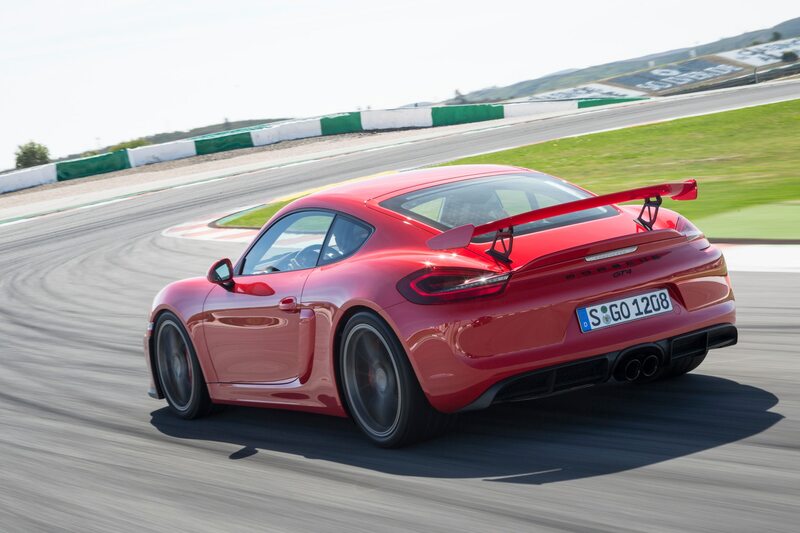 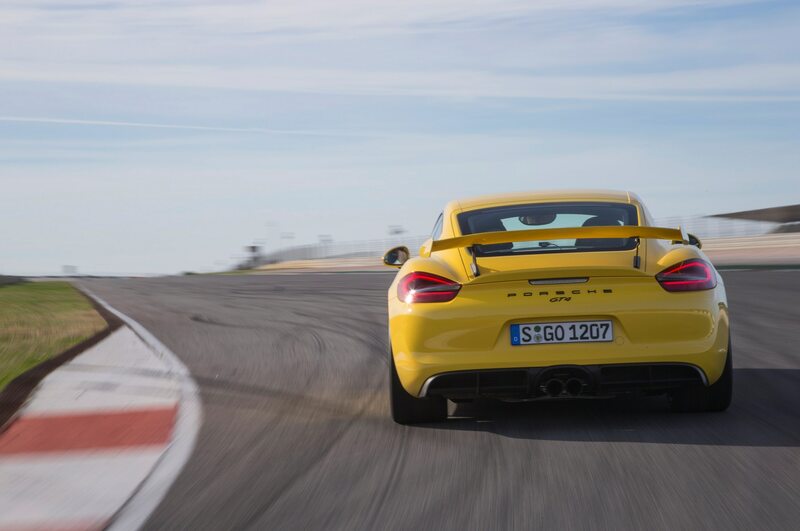 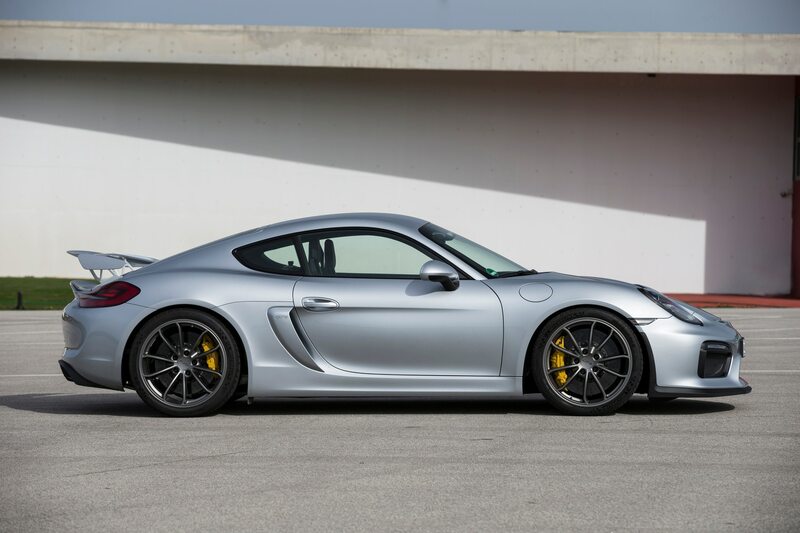 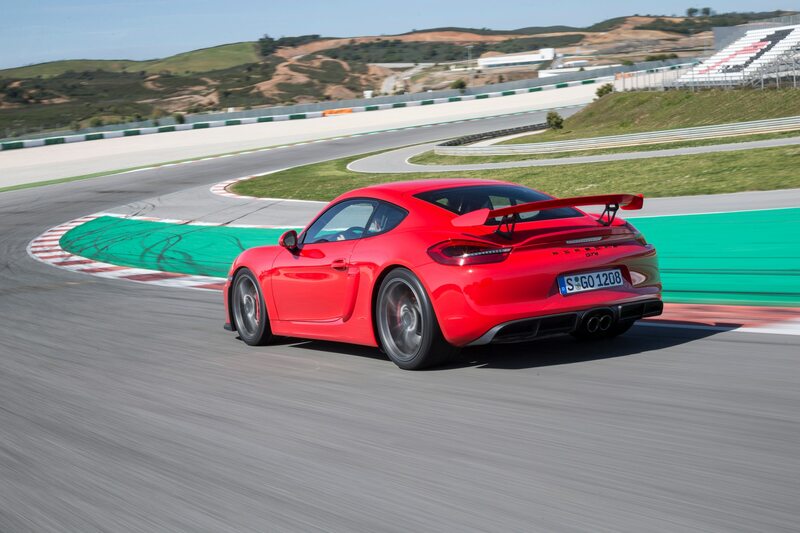 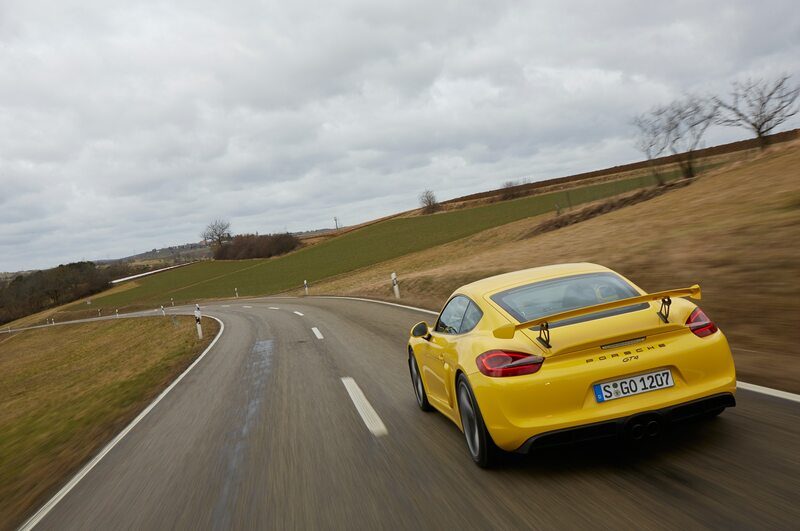 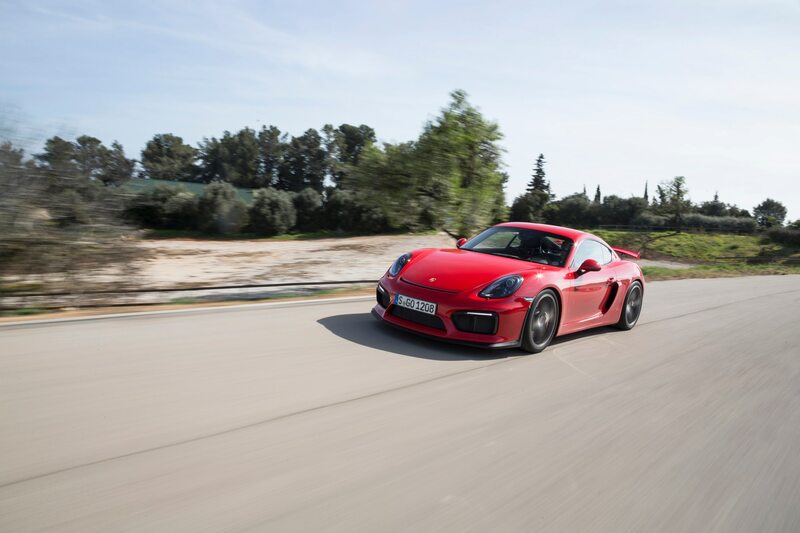 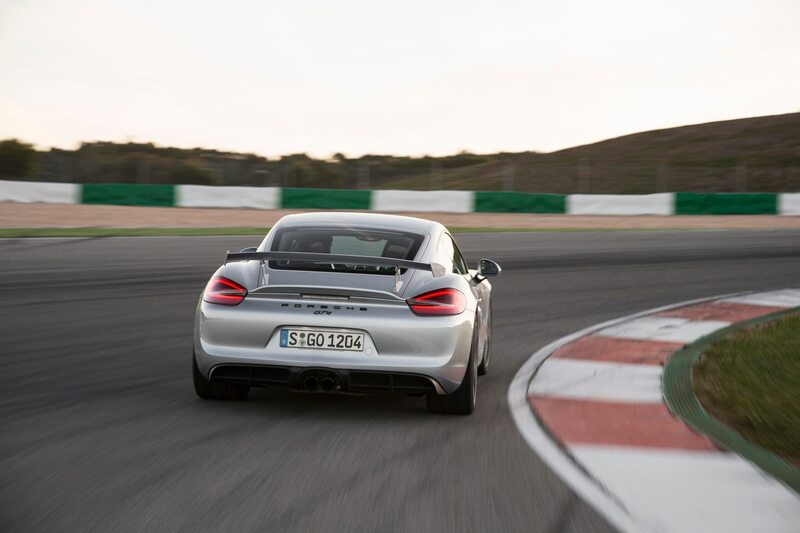 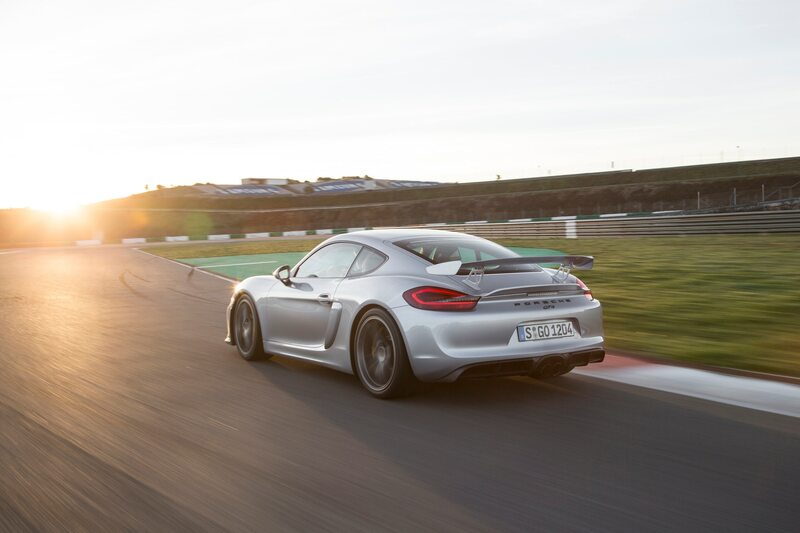 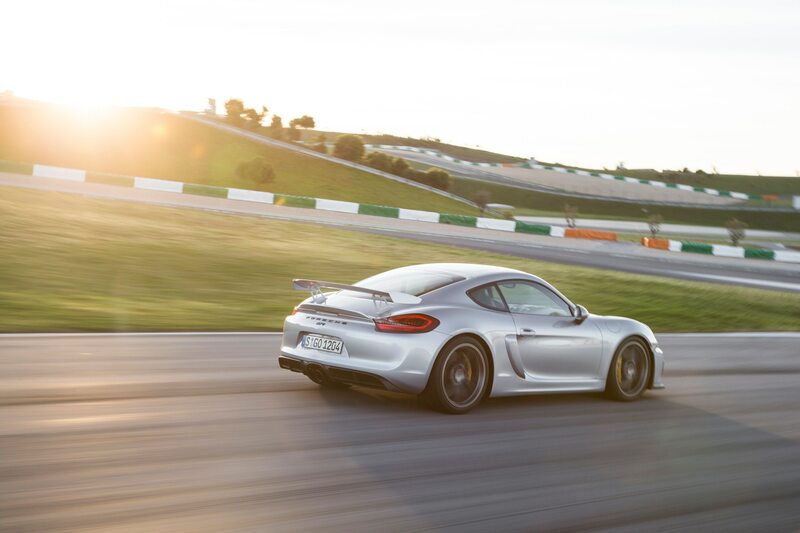 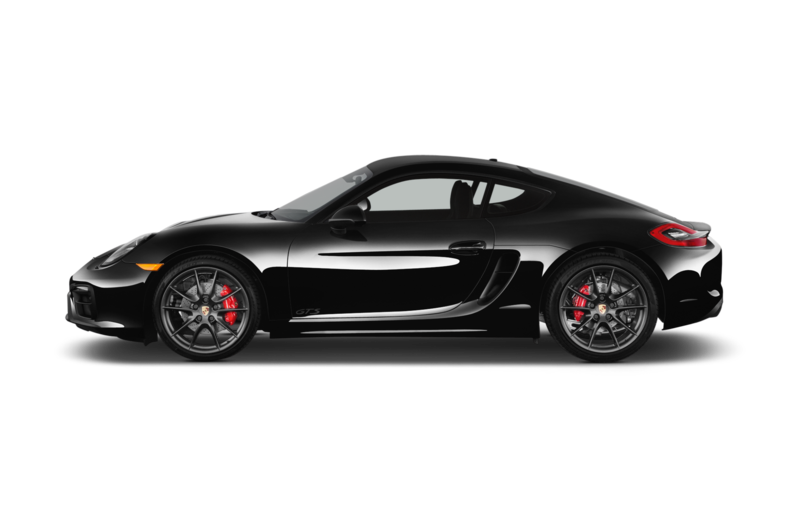 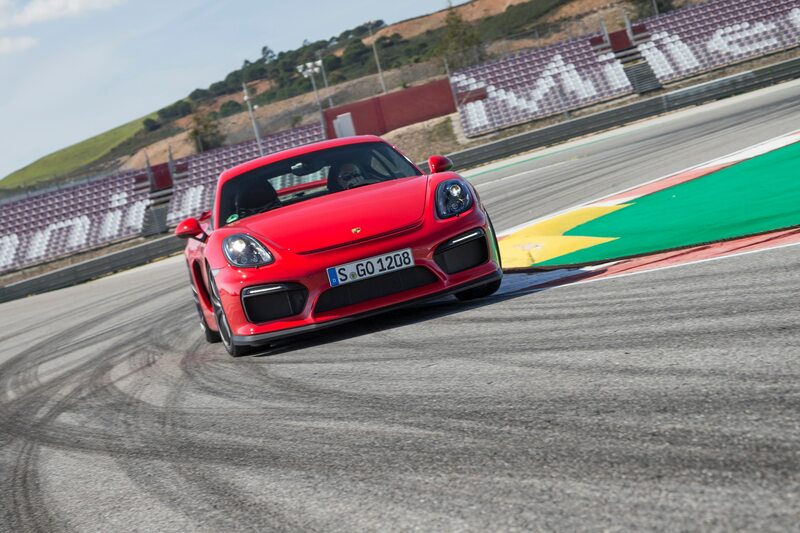 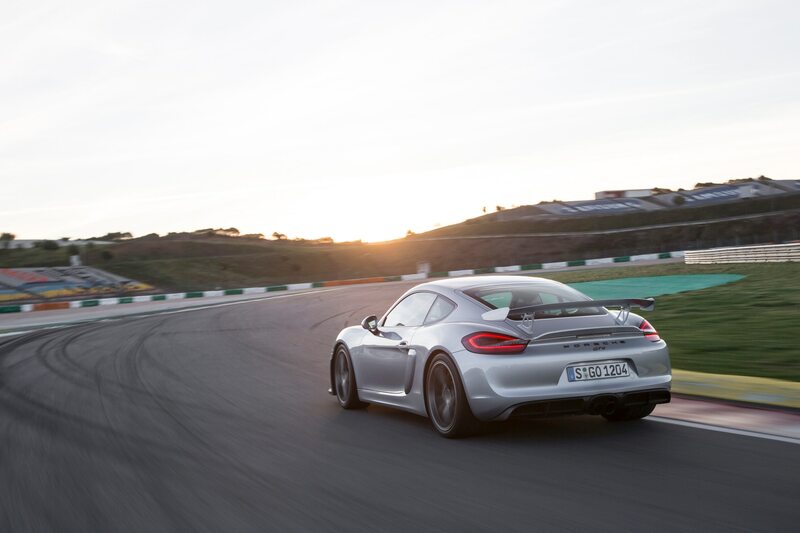 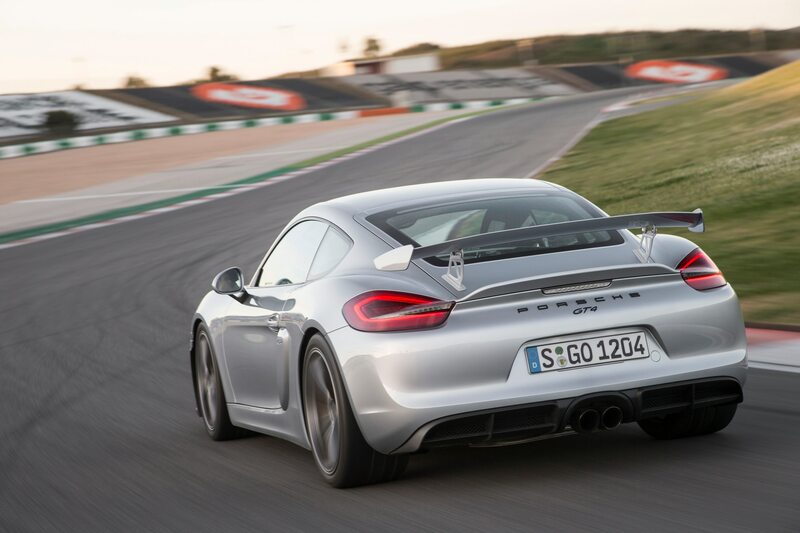 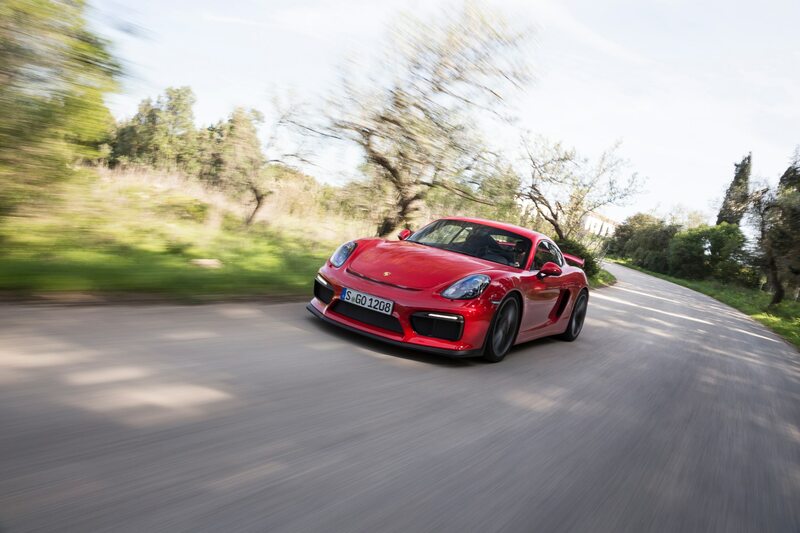 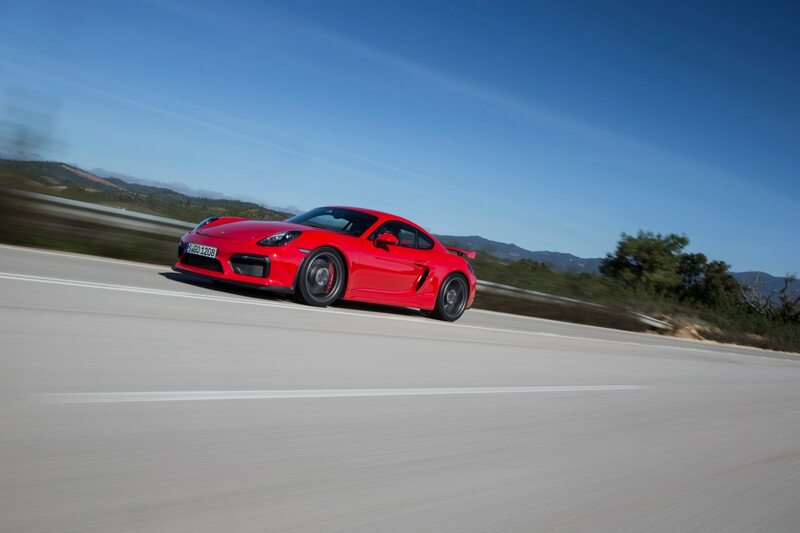 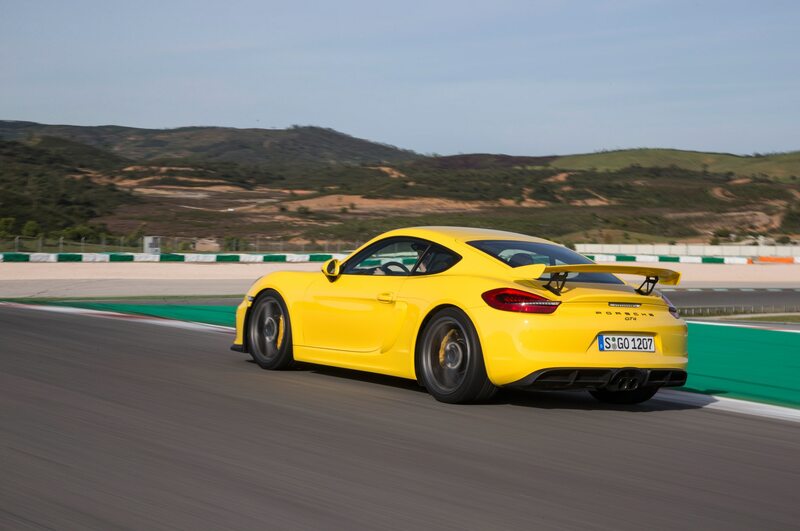 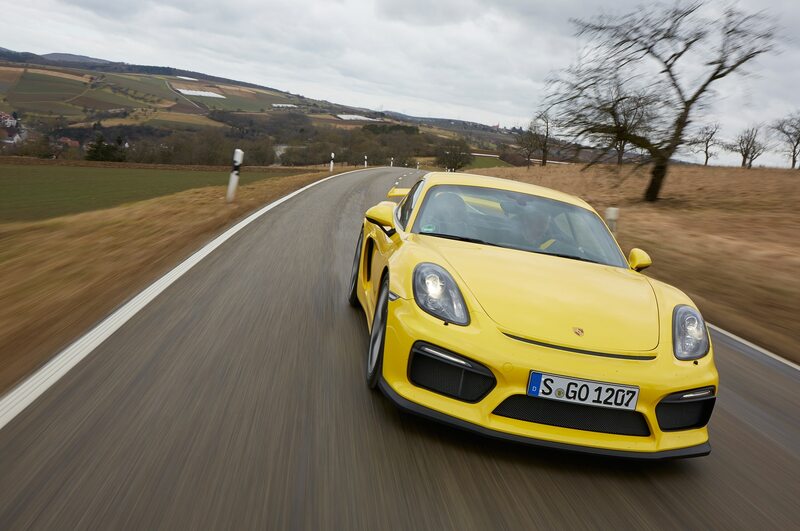 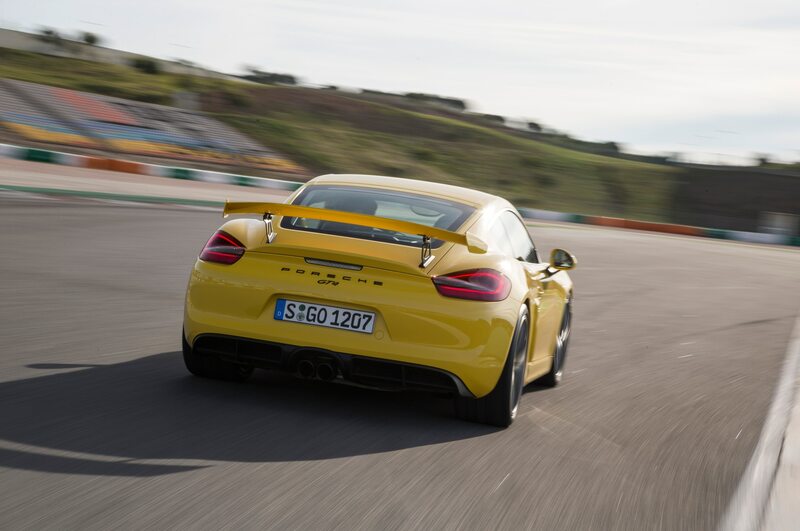 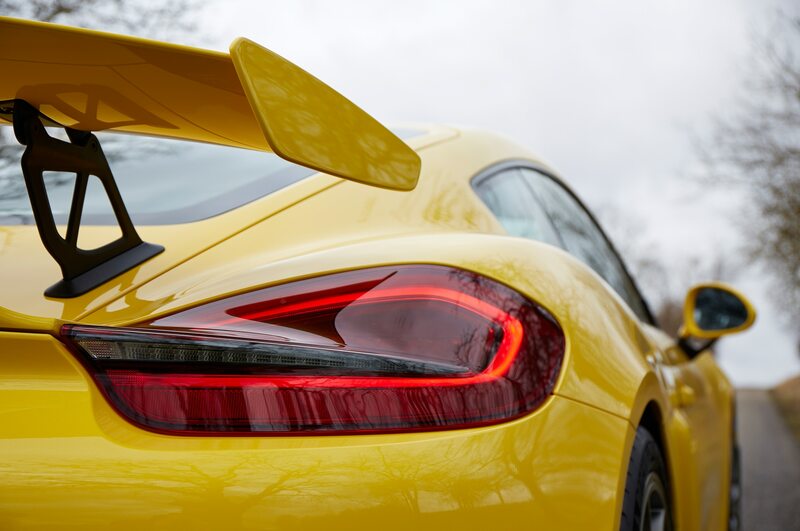 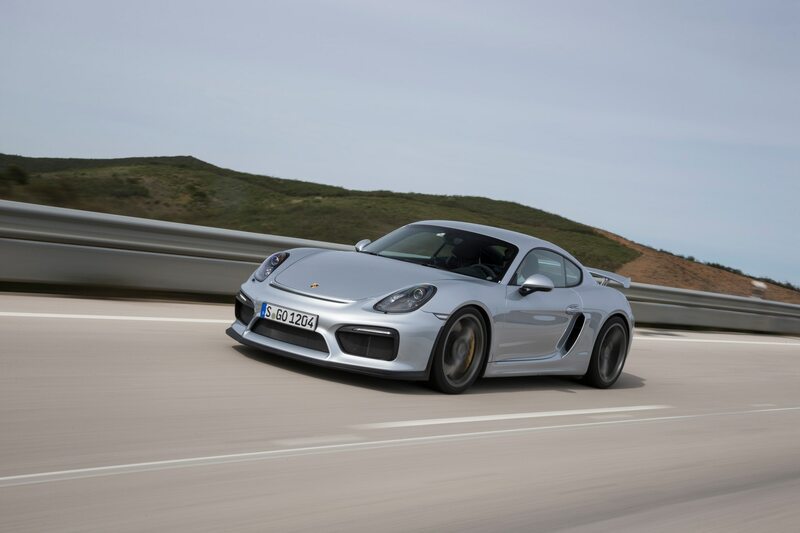 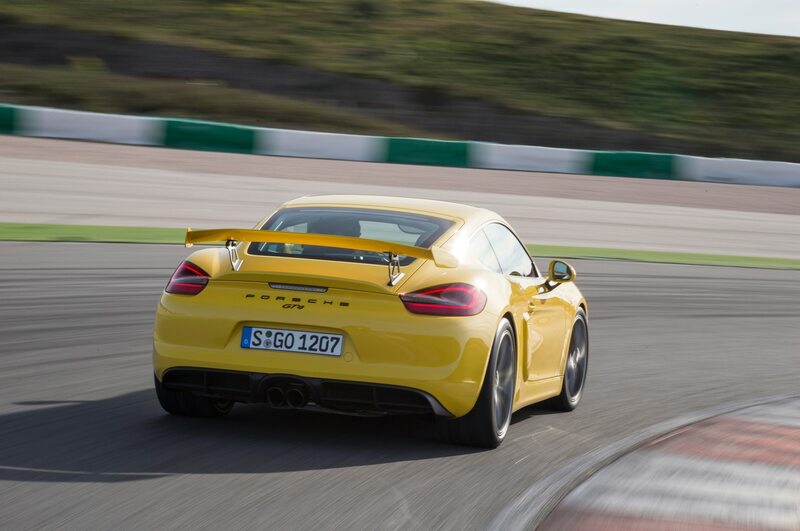 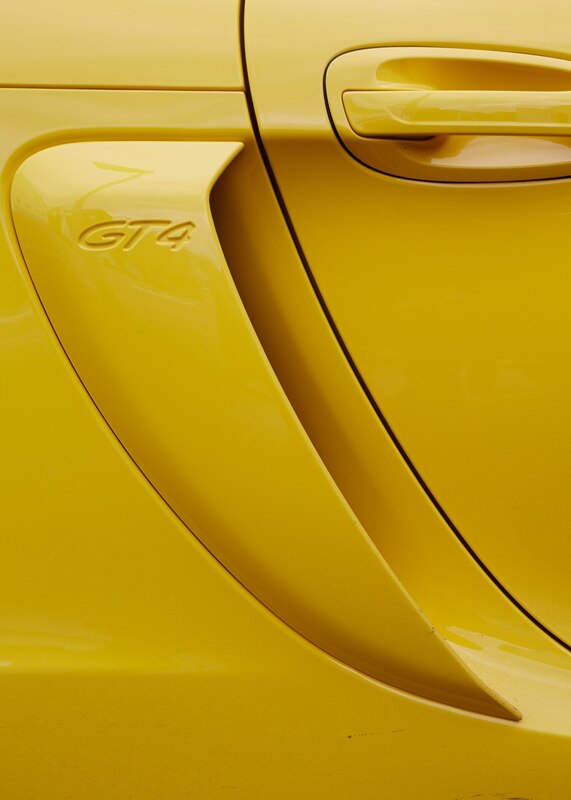 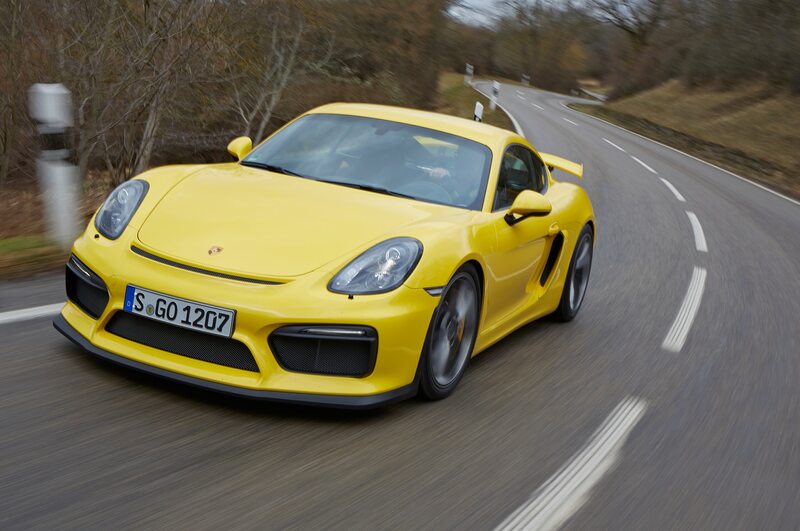 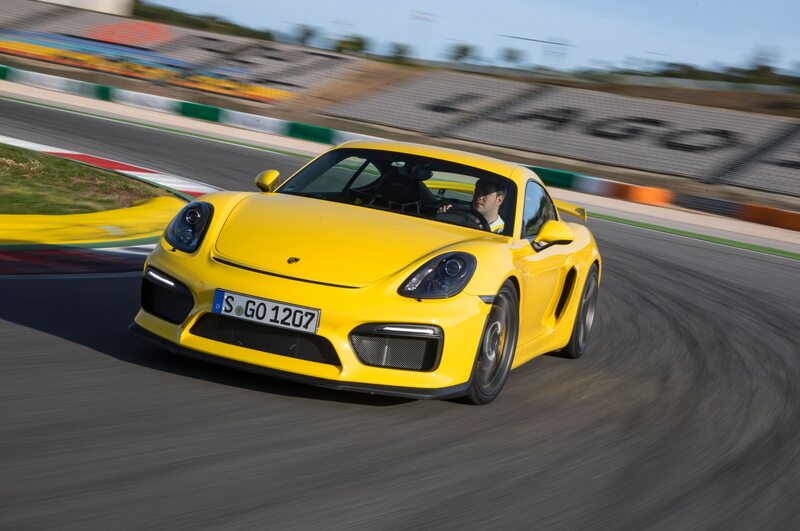 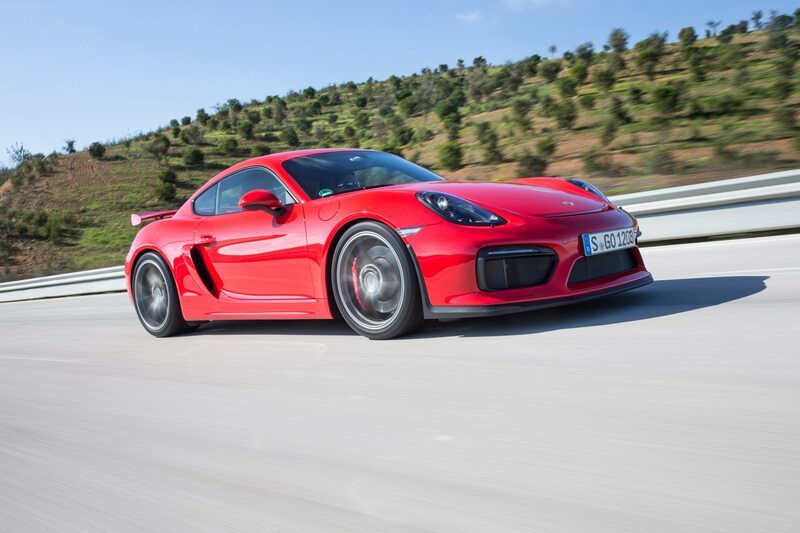 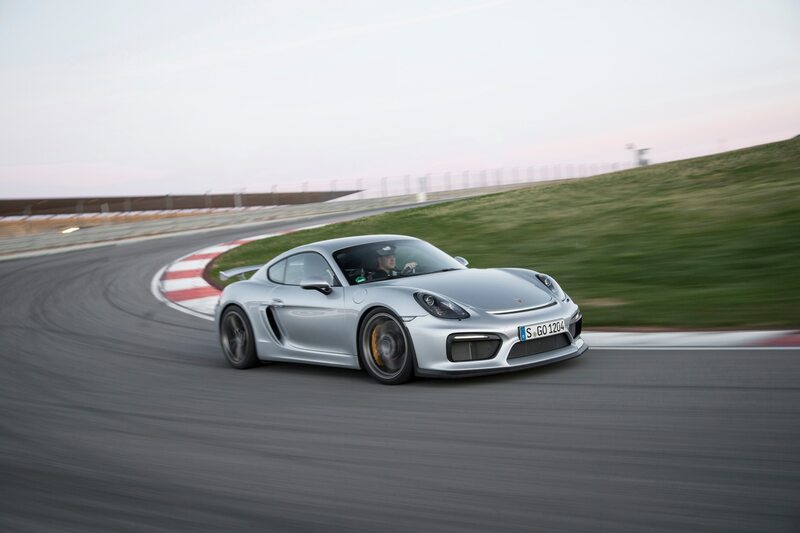 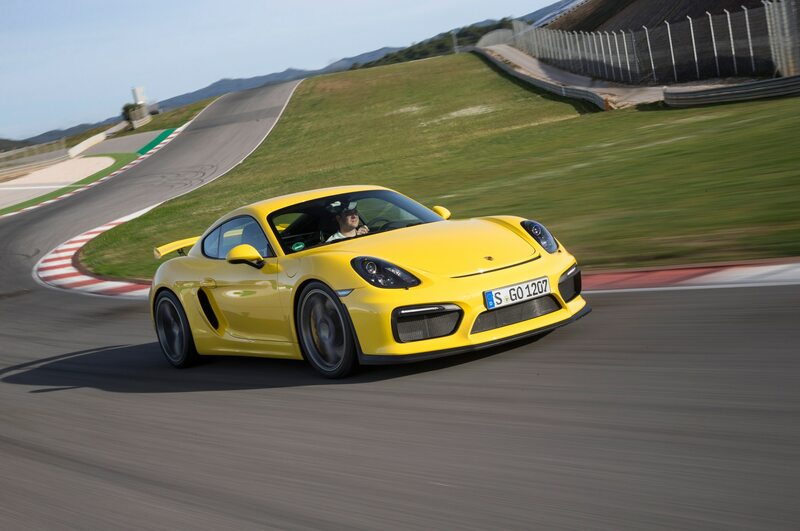 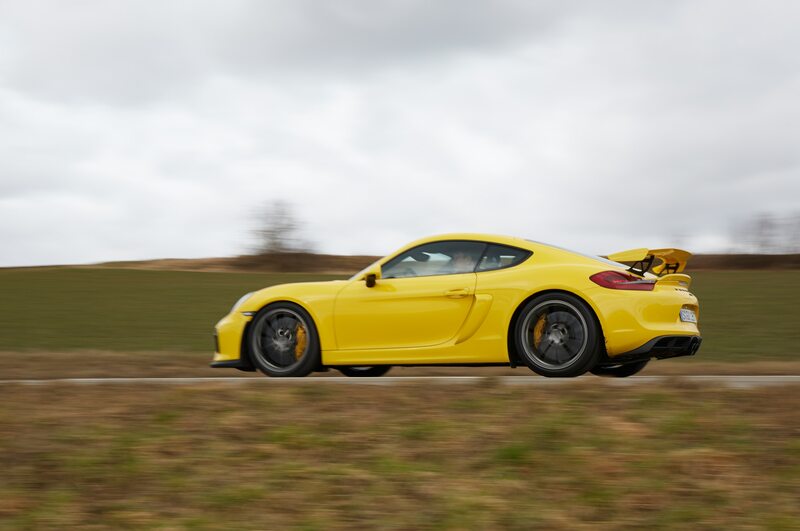 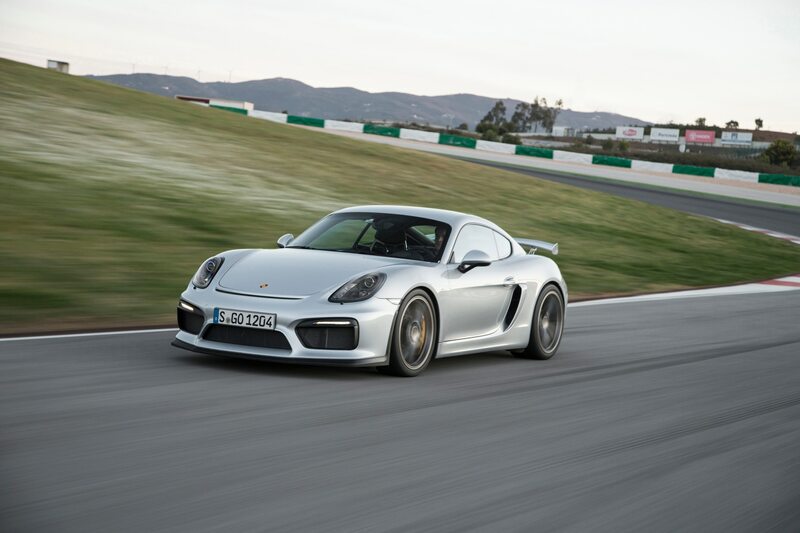 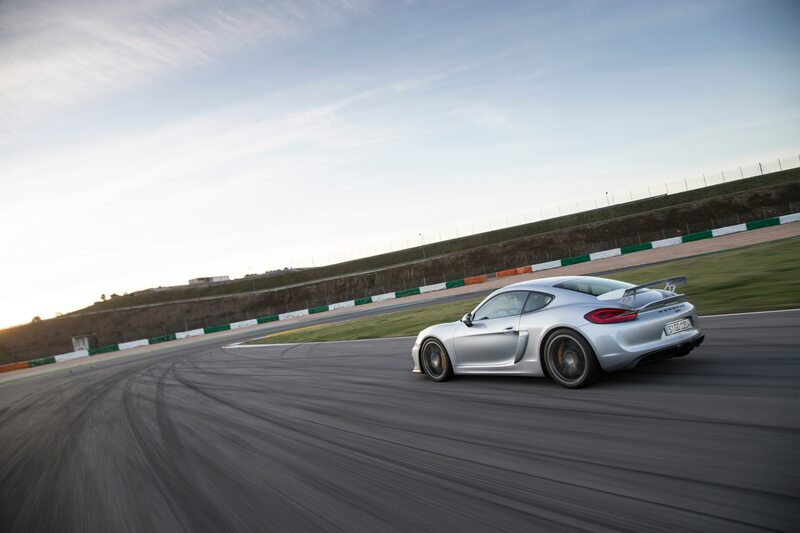 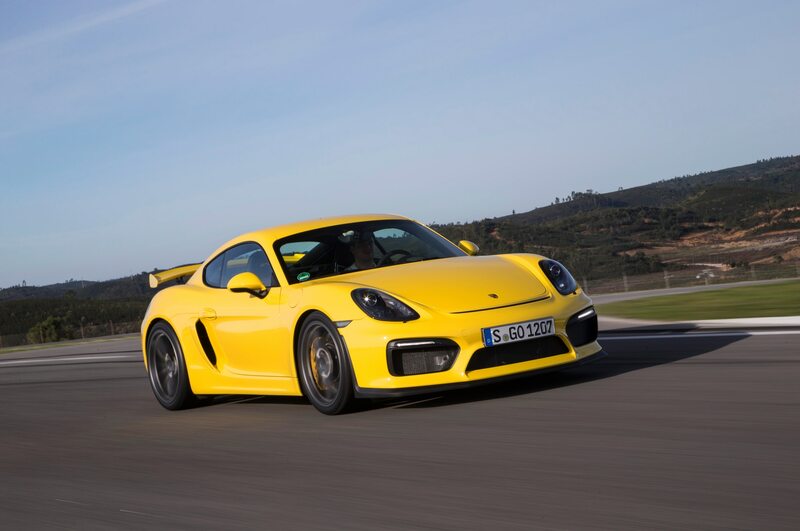 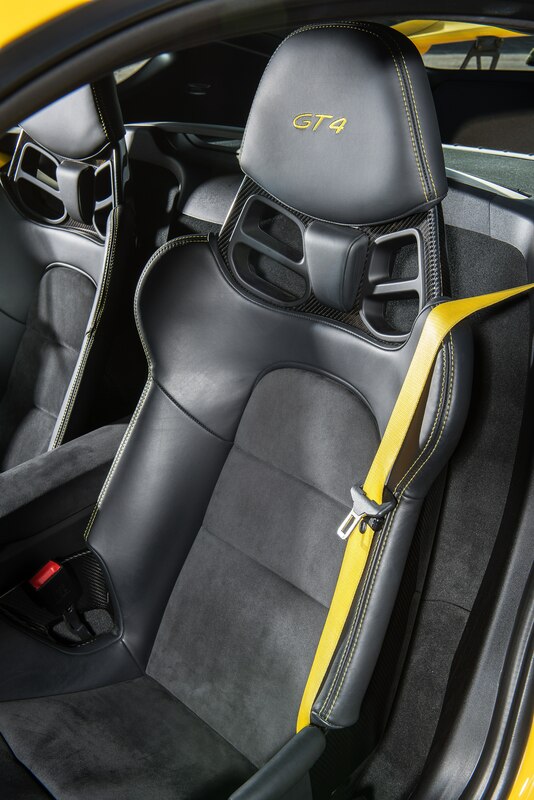 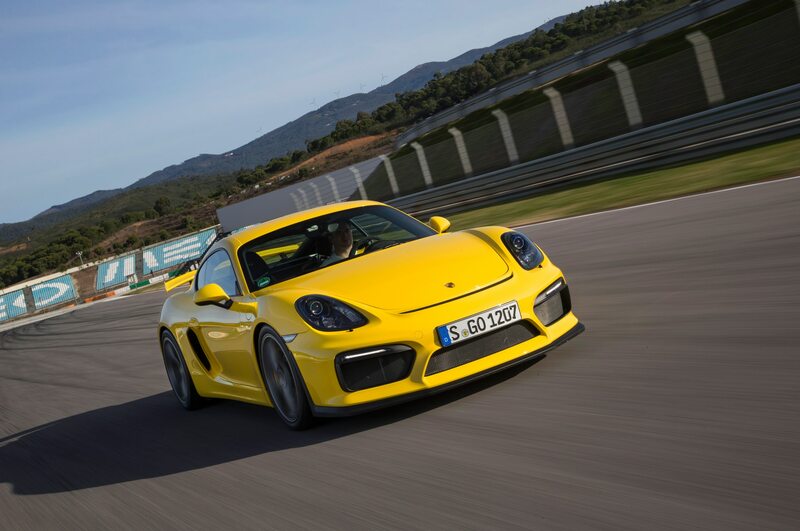 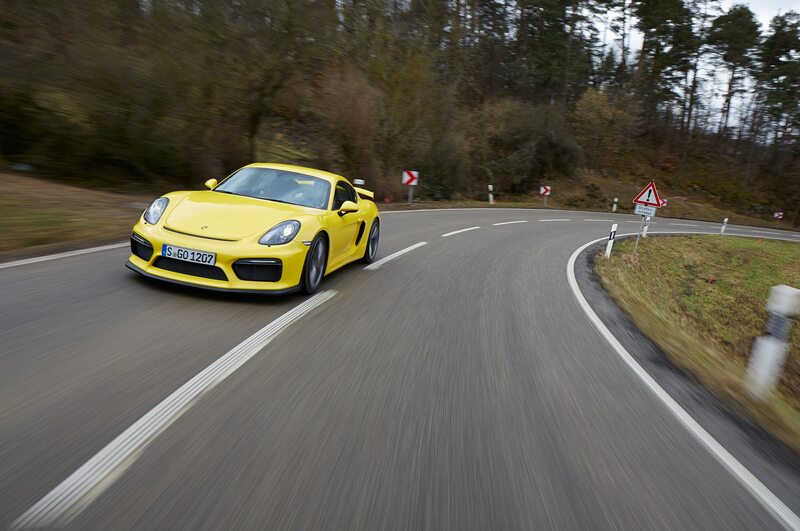 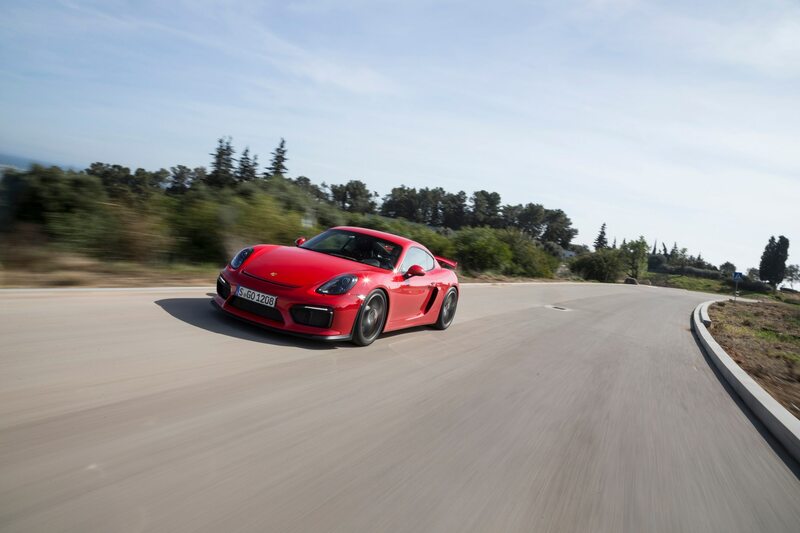 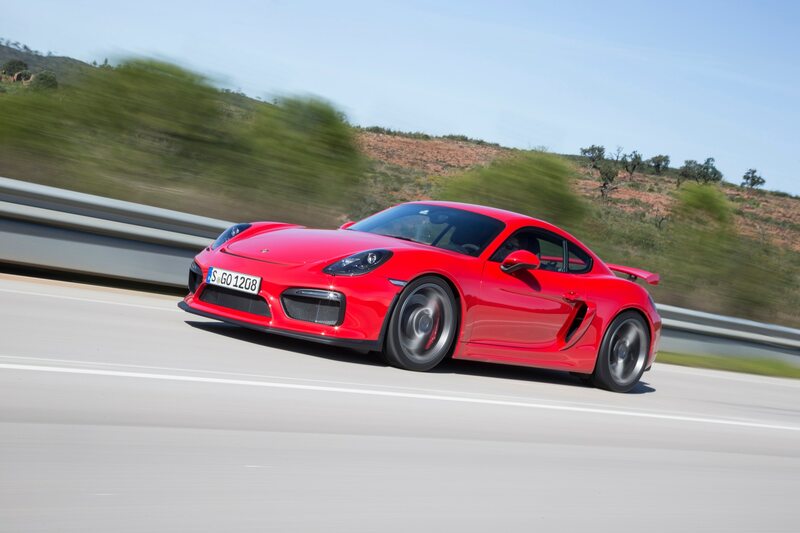 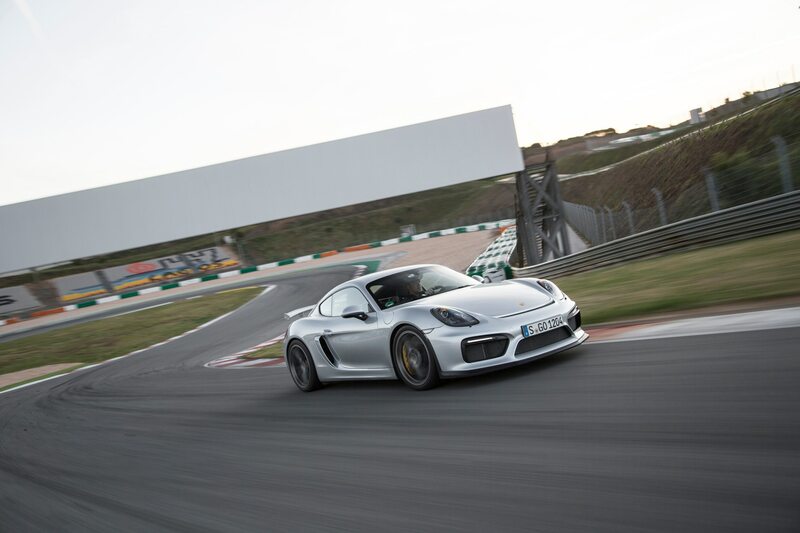 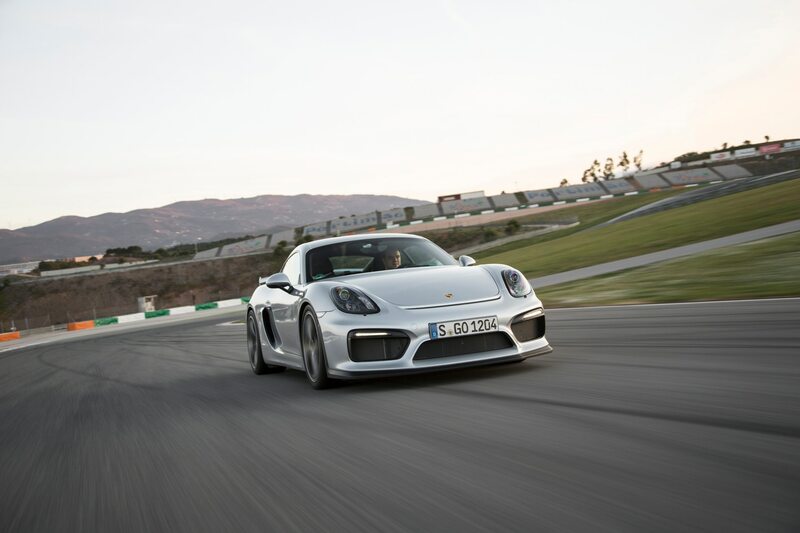 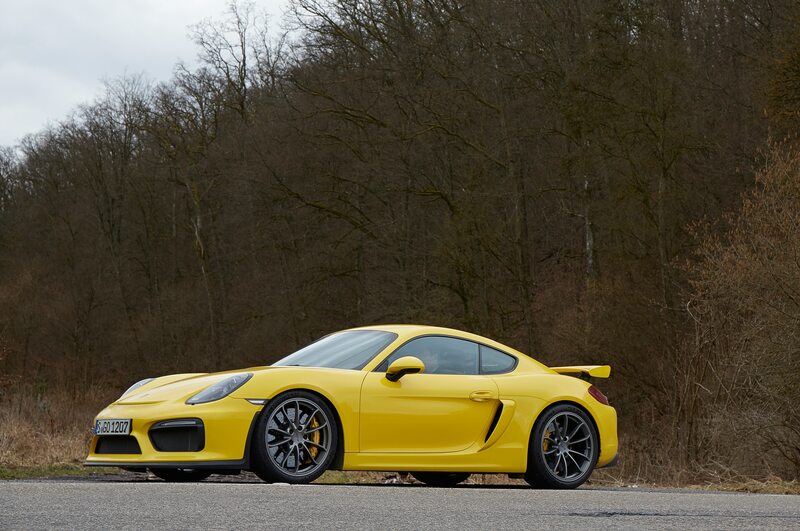 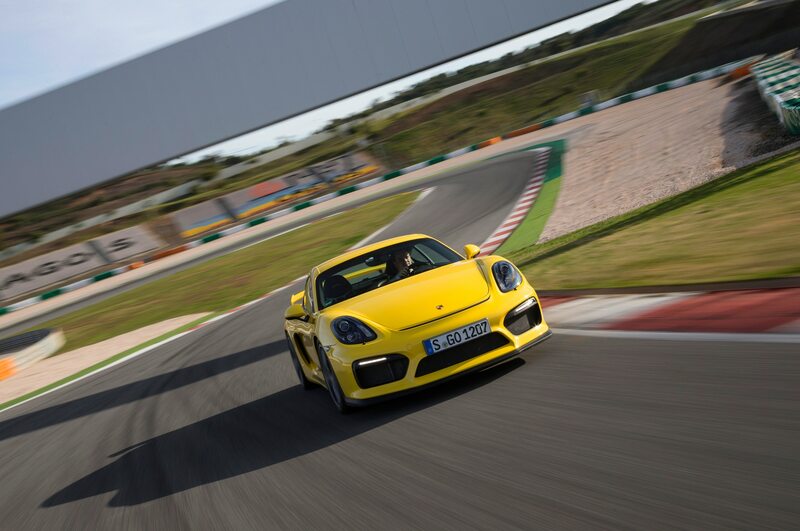 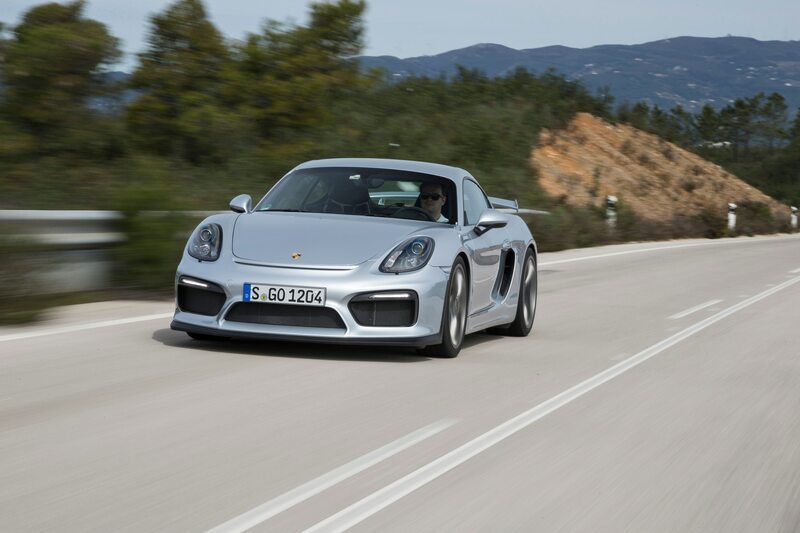 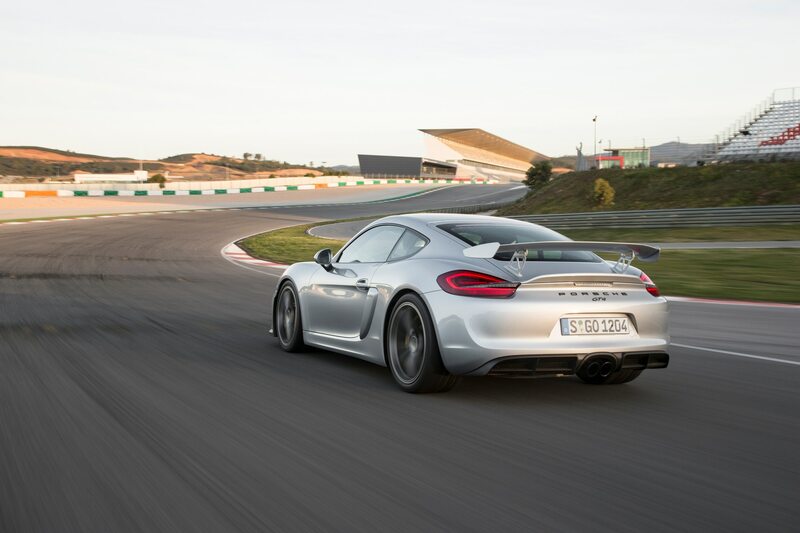 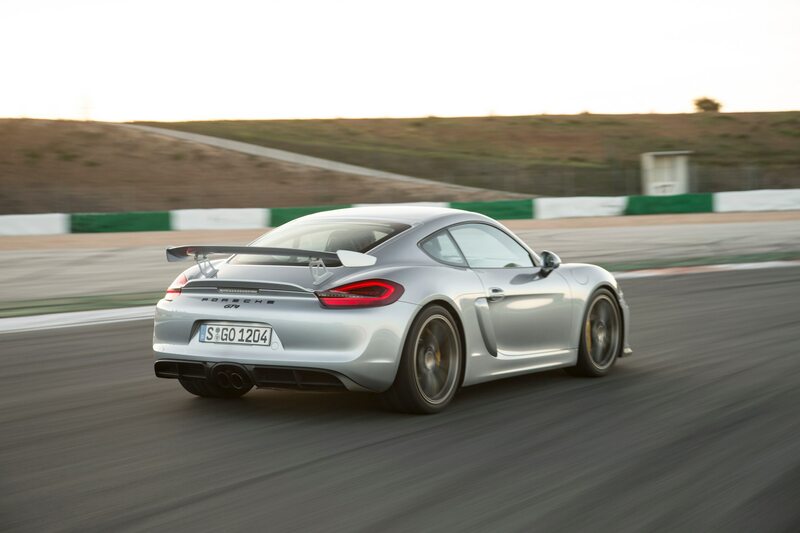 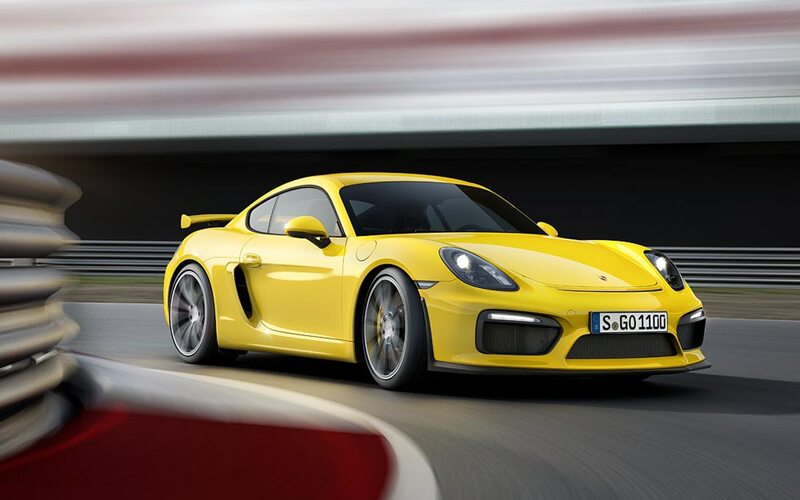 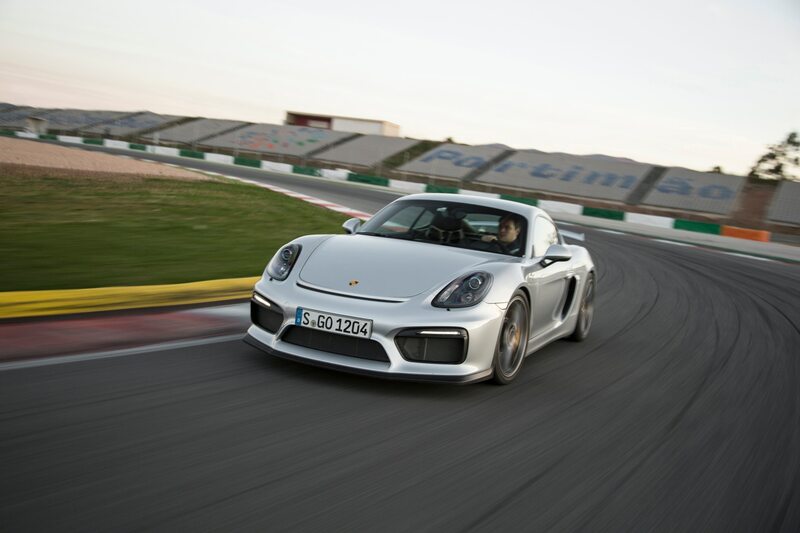 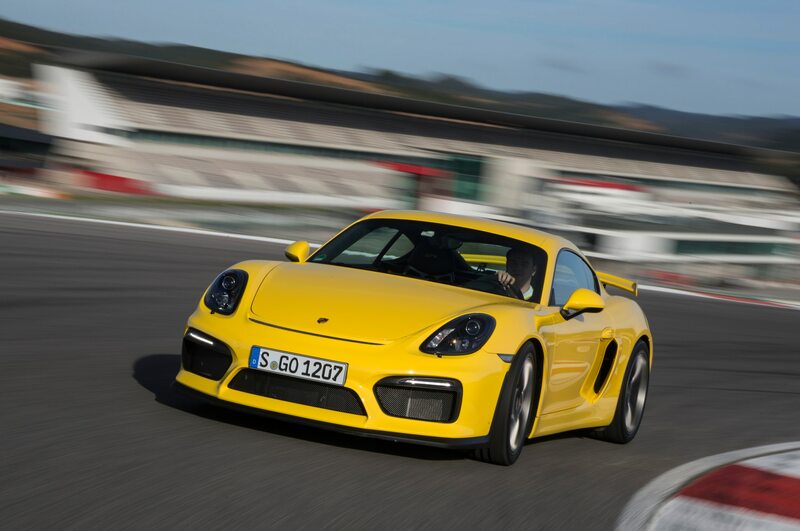 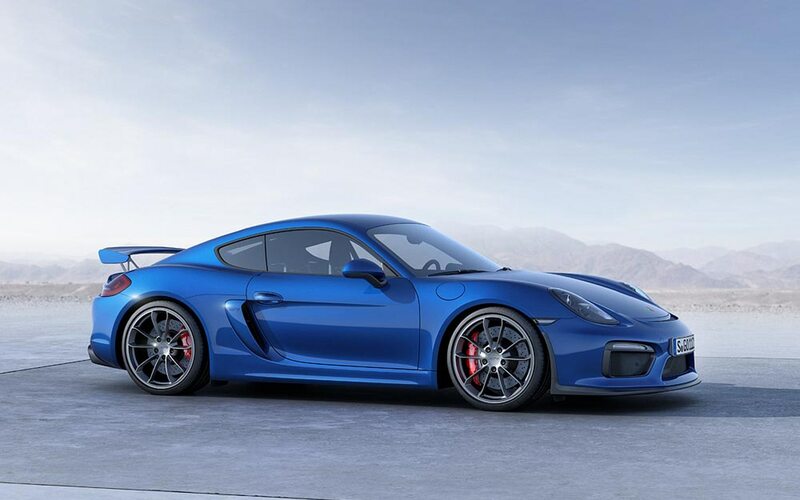 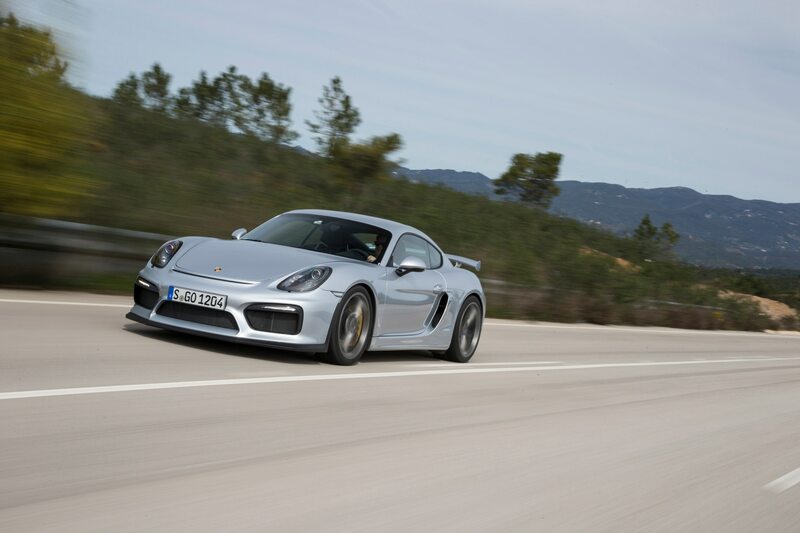 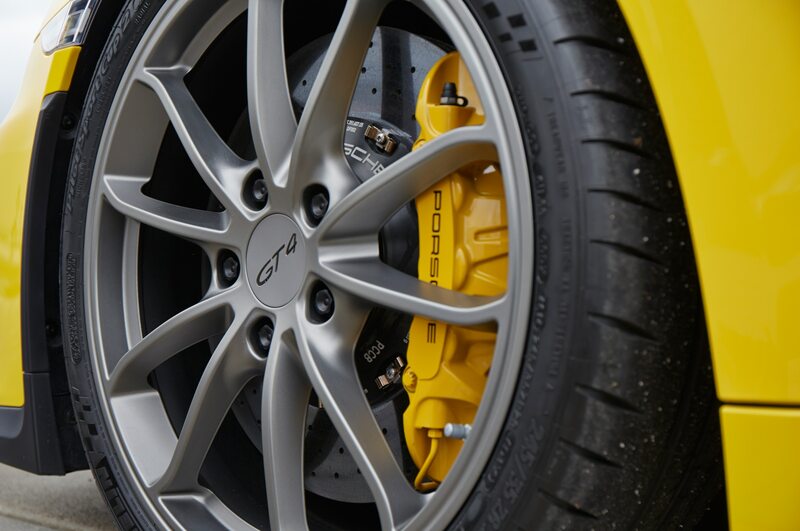 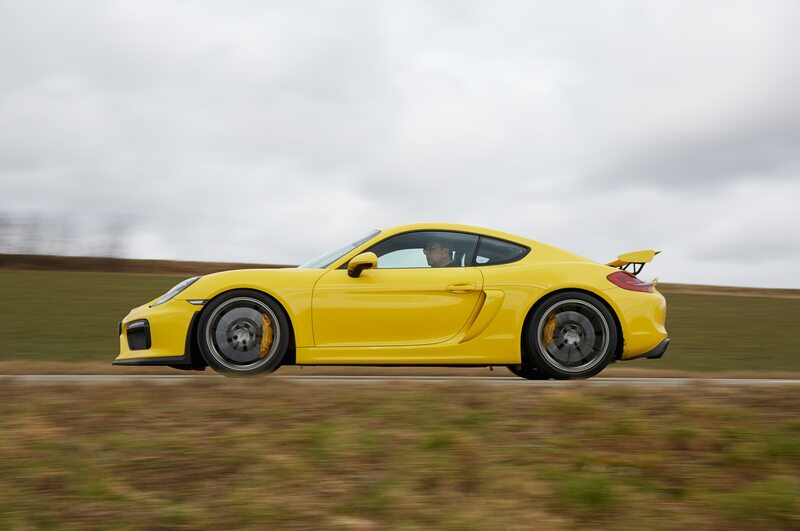 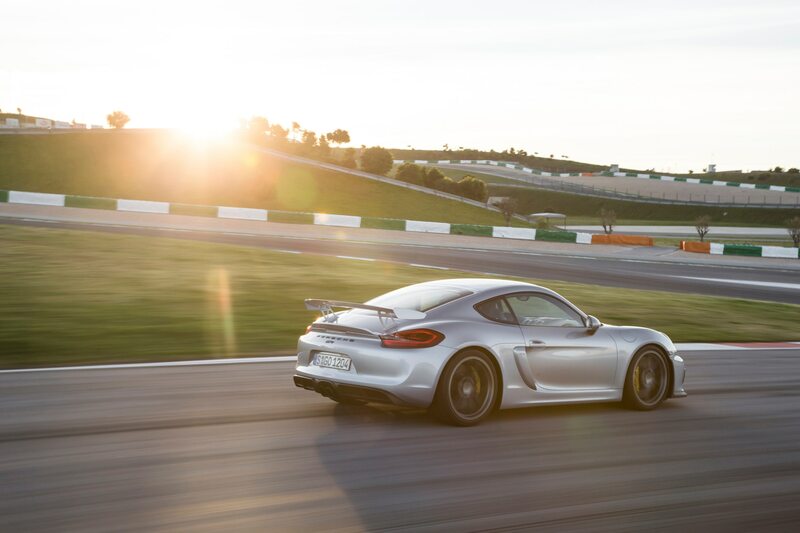 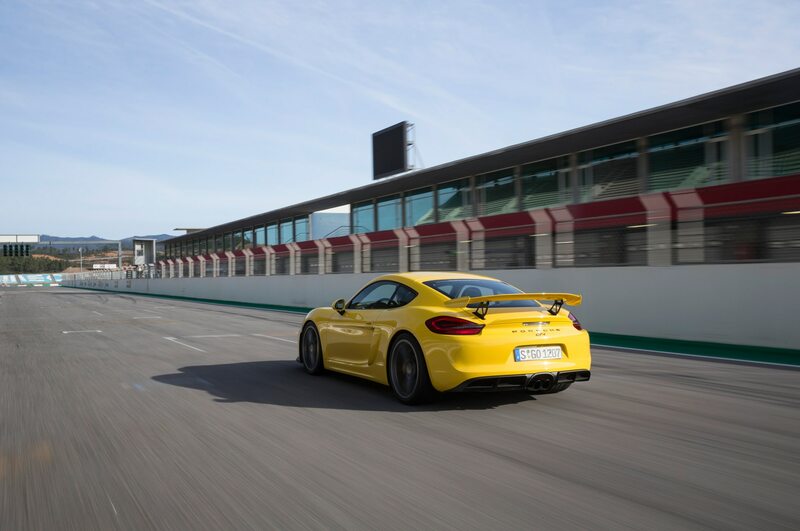 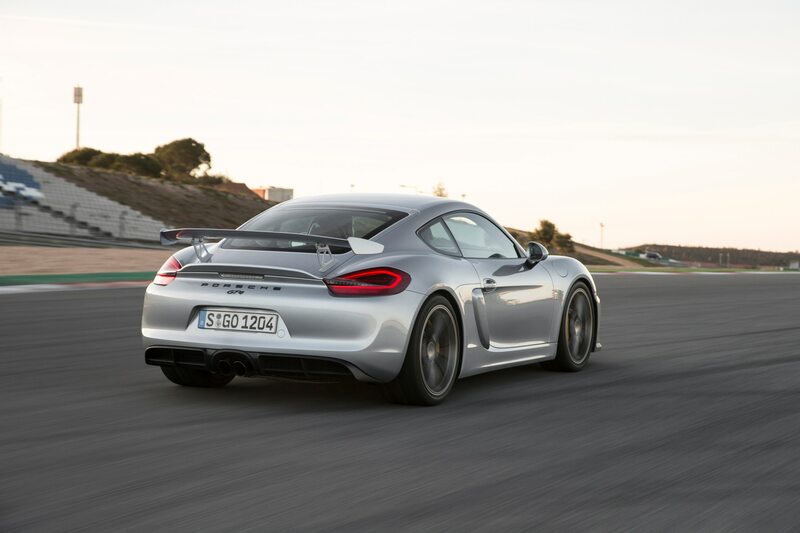 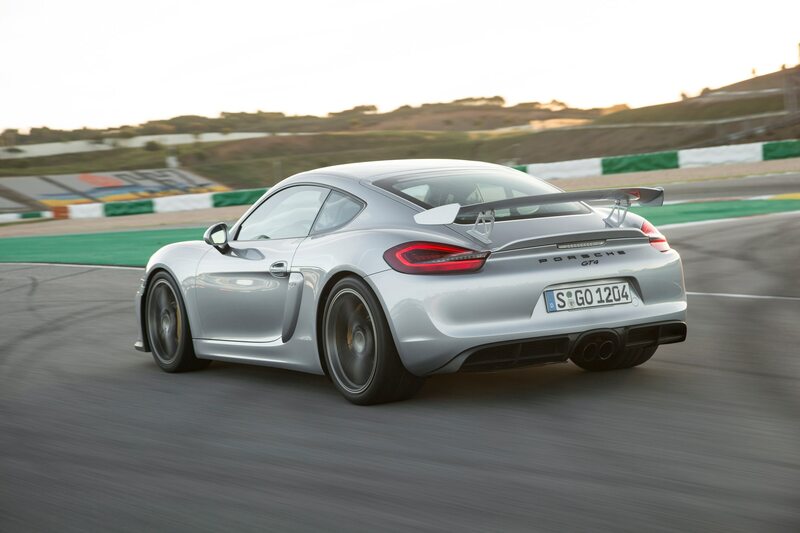 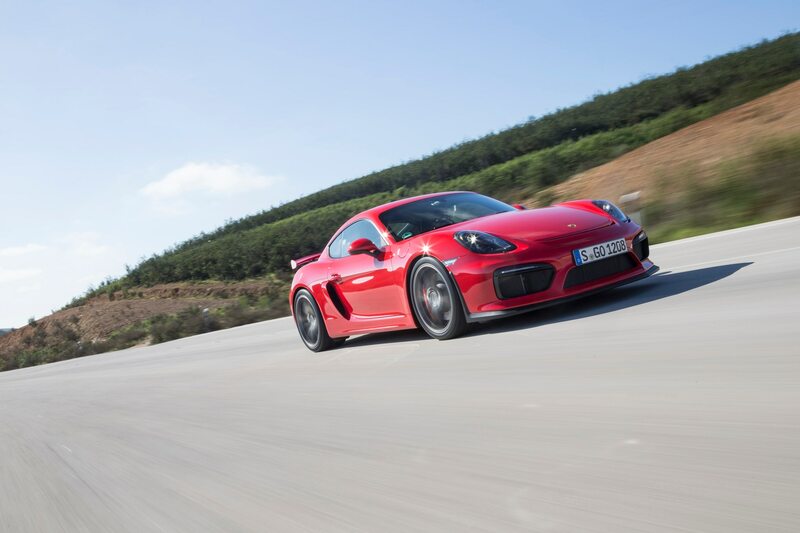 The Cayman GT4, for example, is designed for canyon carving and occasional track-day use rather than ultimate lap times. 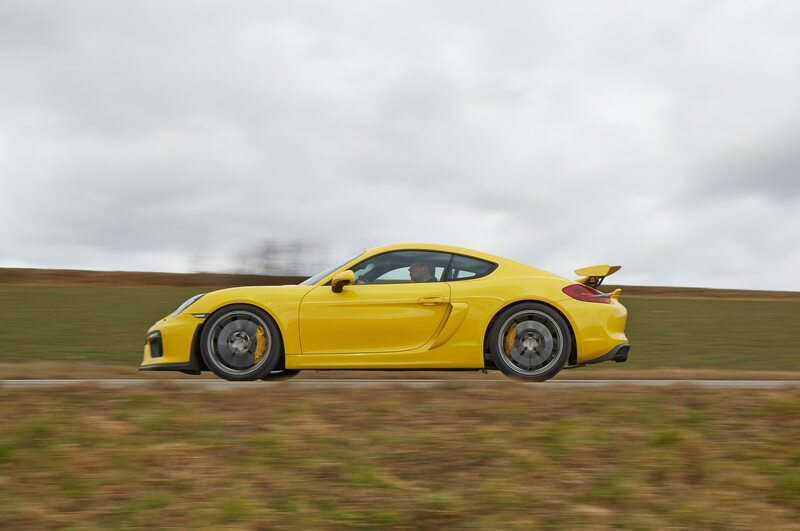 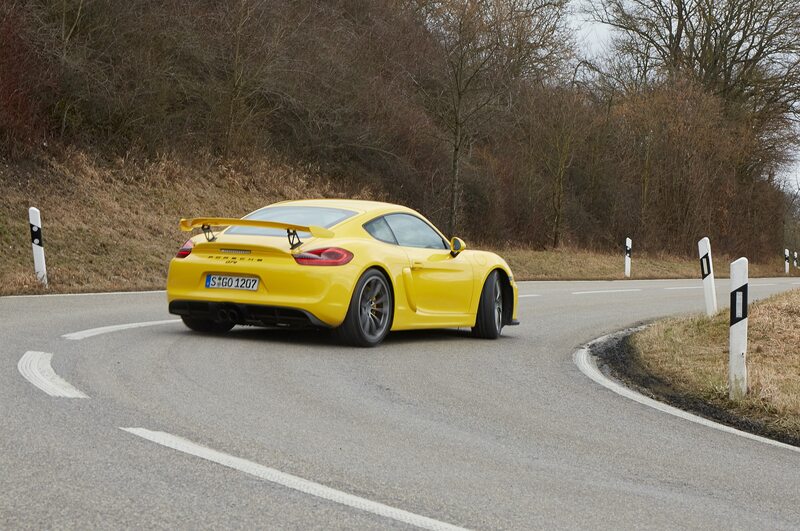 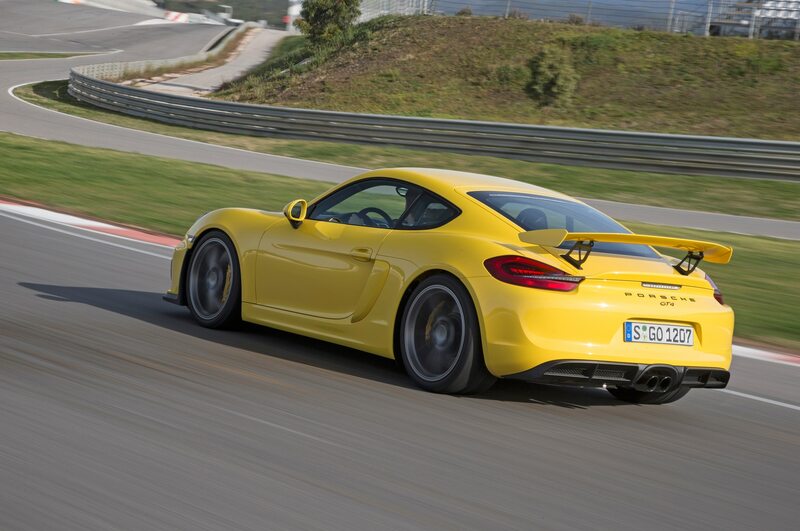 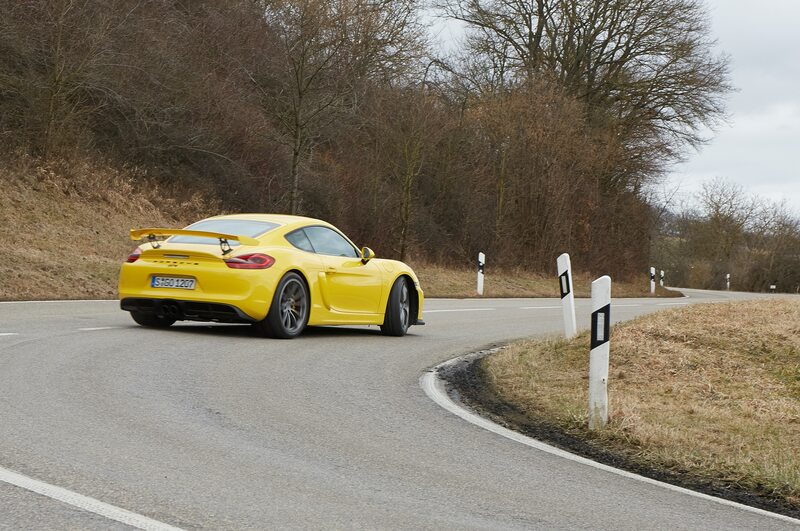 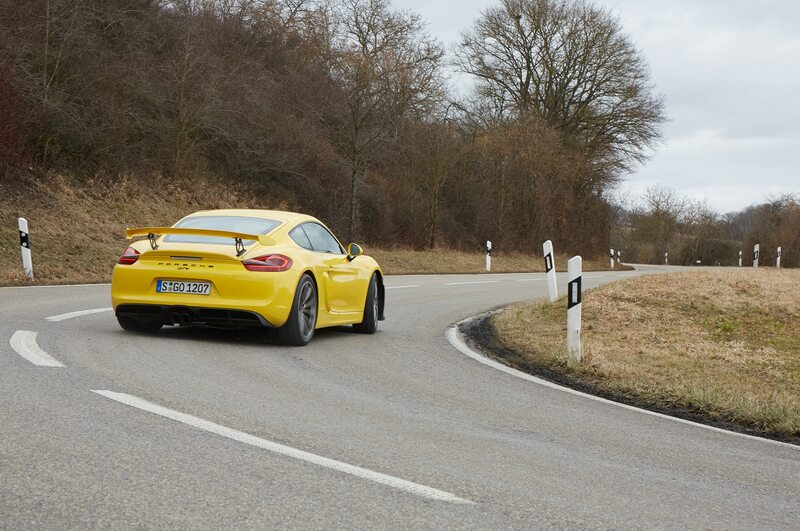 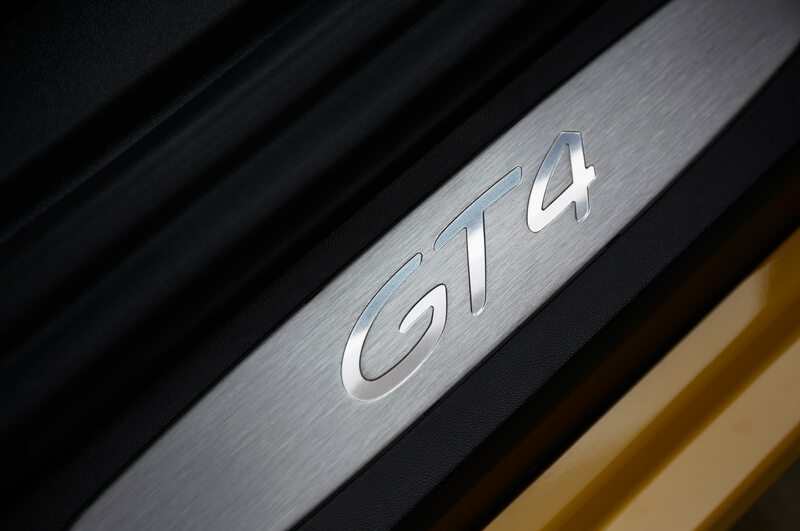 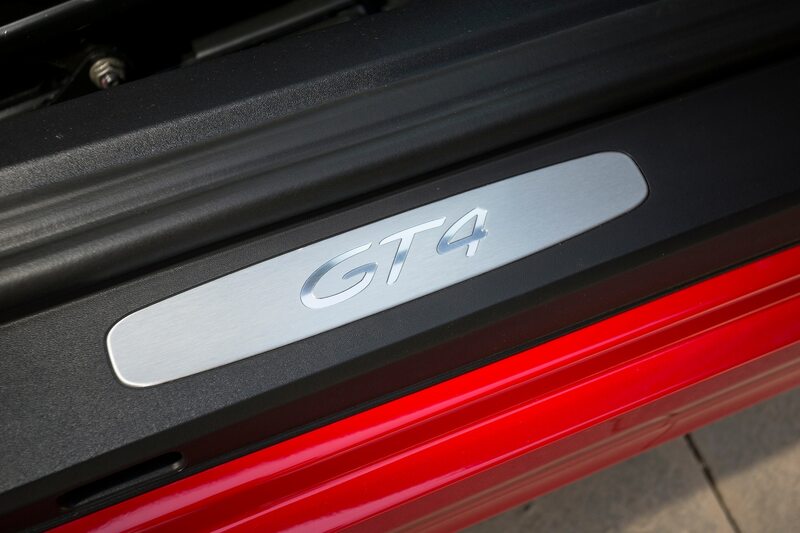 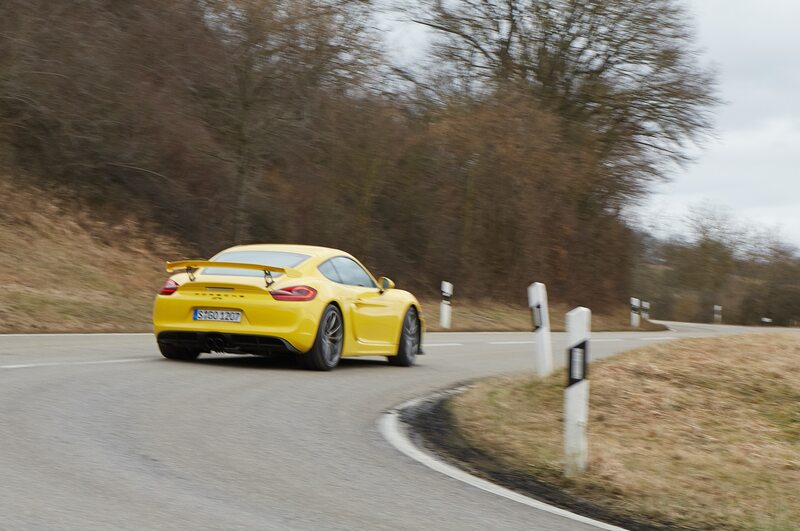 So while there’s less performance to be had from the GT4 than the GT3, it’s easier to extract. 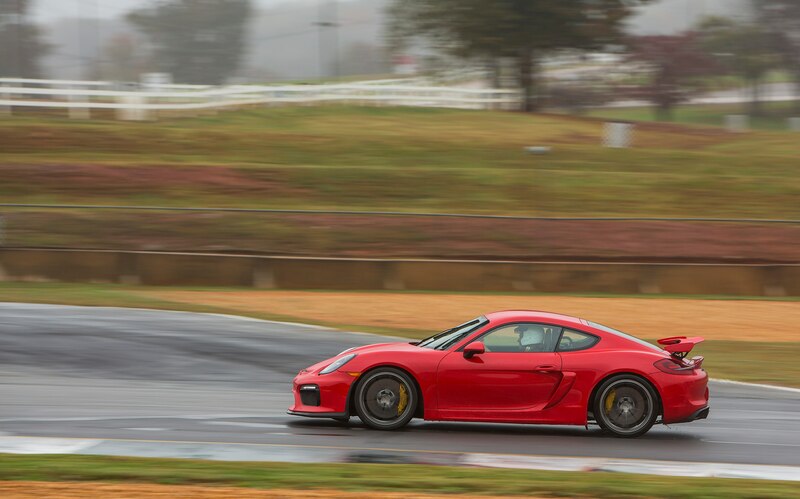 “You can drive at 100 percent and not feel overmatched by the car,” longtime Porsche racer Hurley Haywood says. 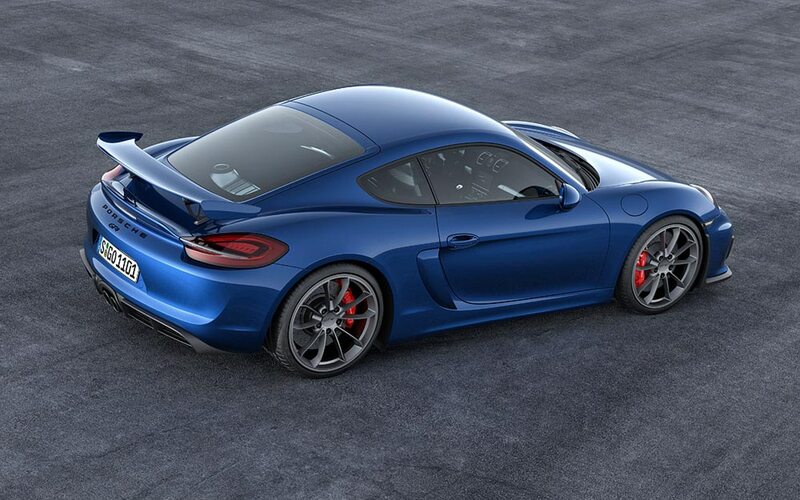 Not that the Cayman is a poseur. 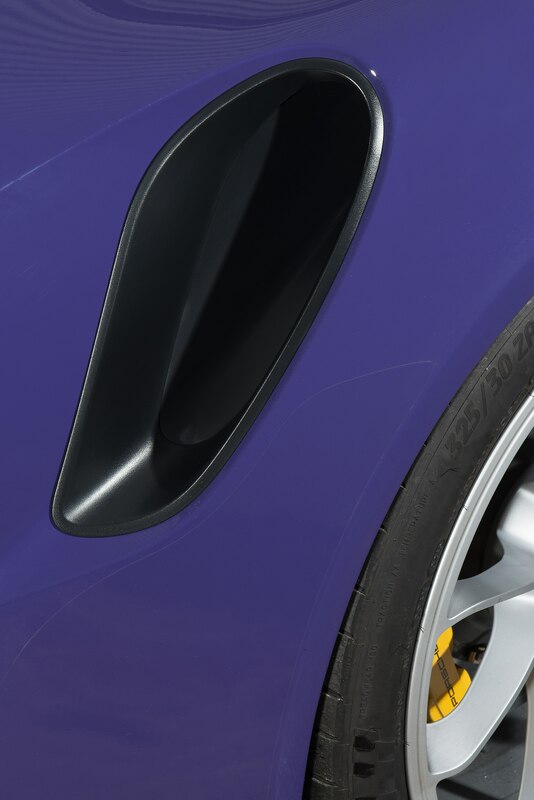 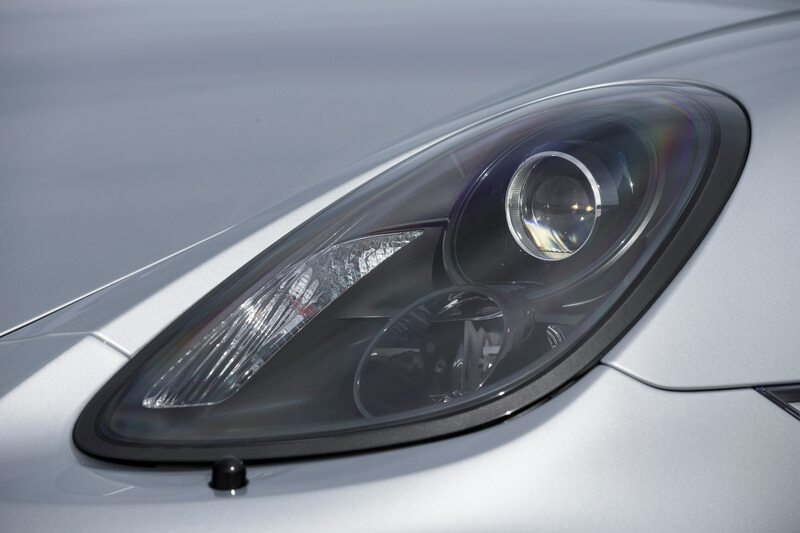 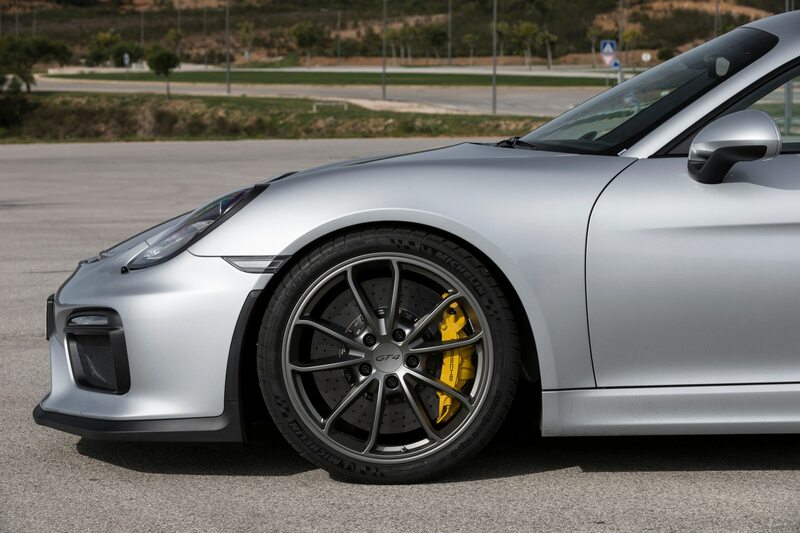 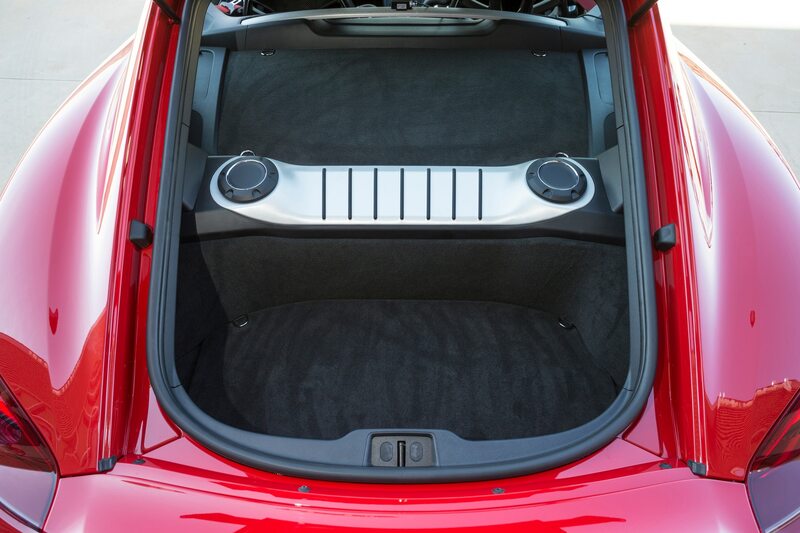 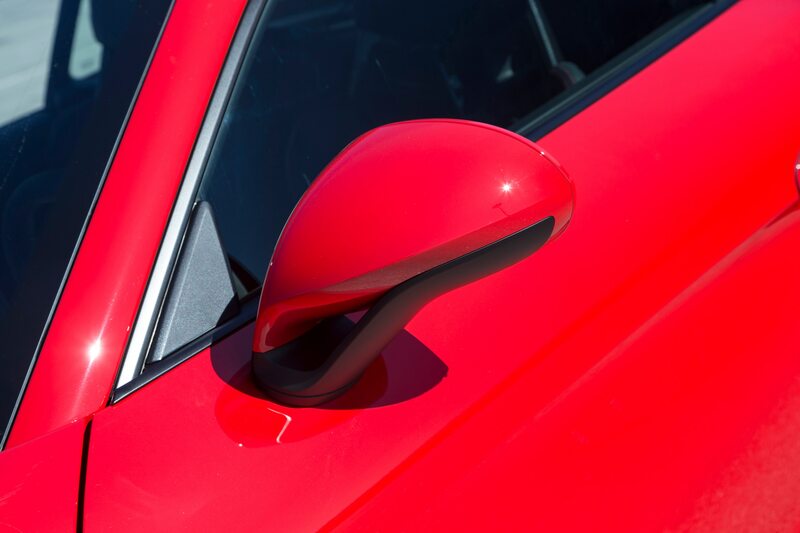 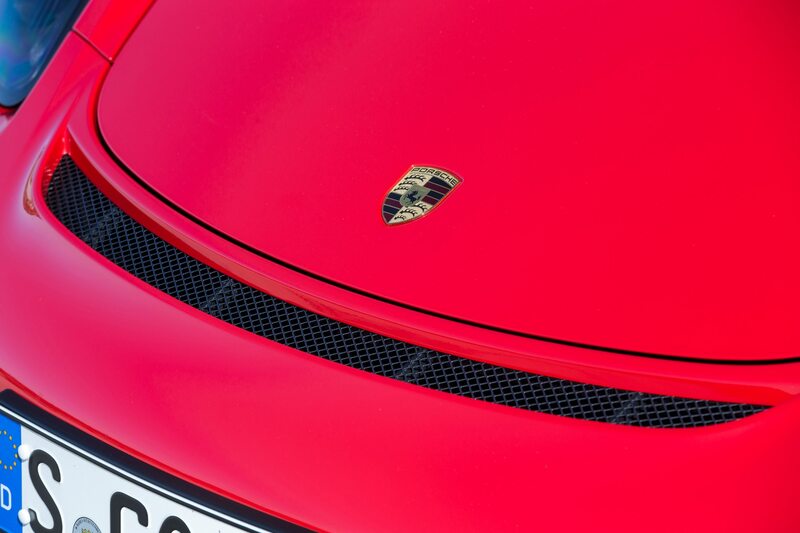 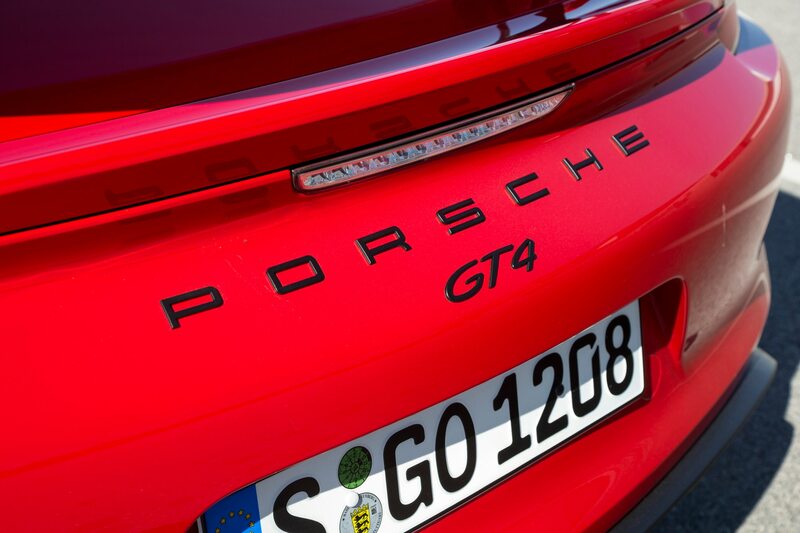 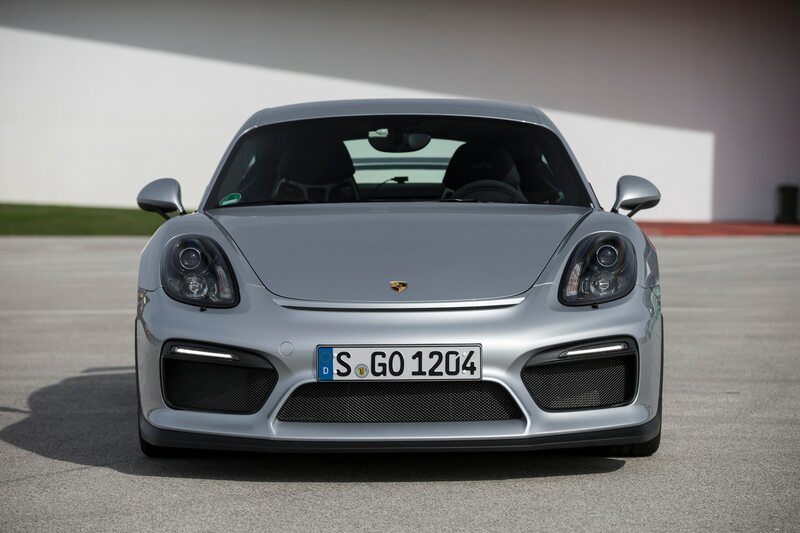 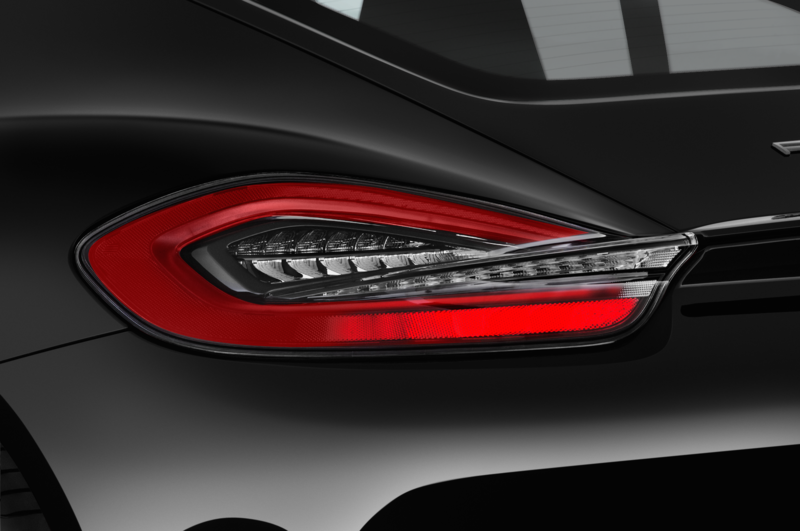 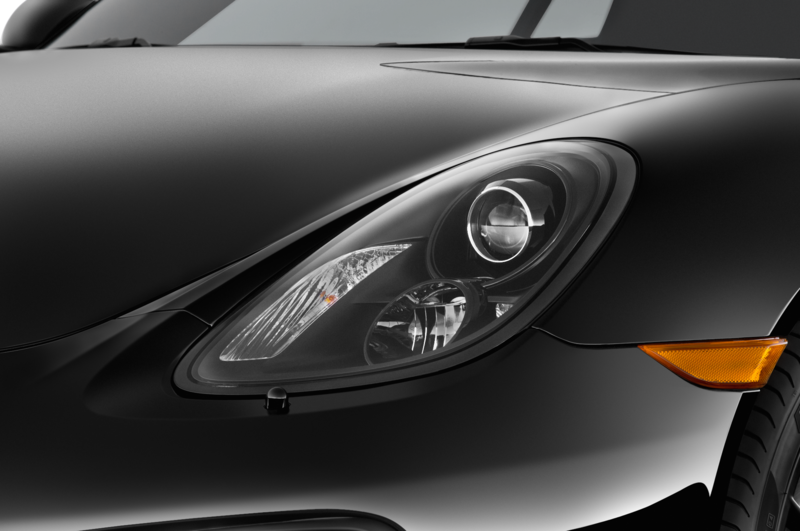 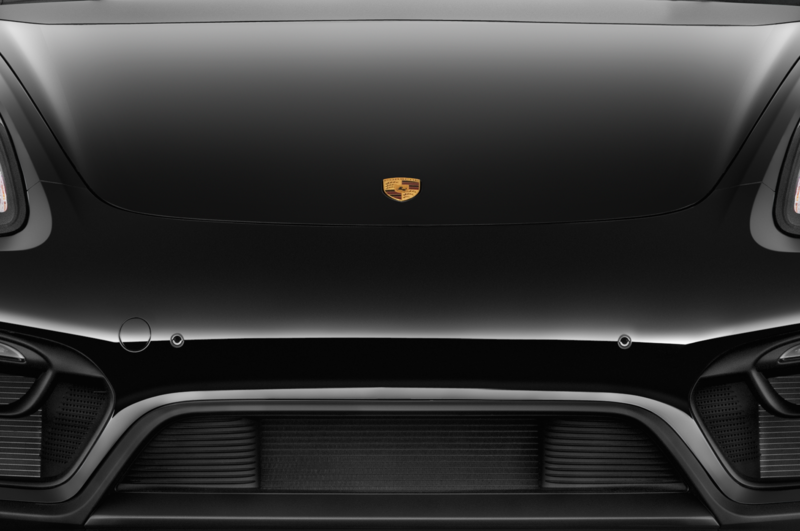 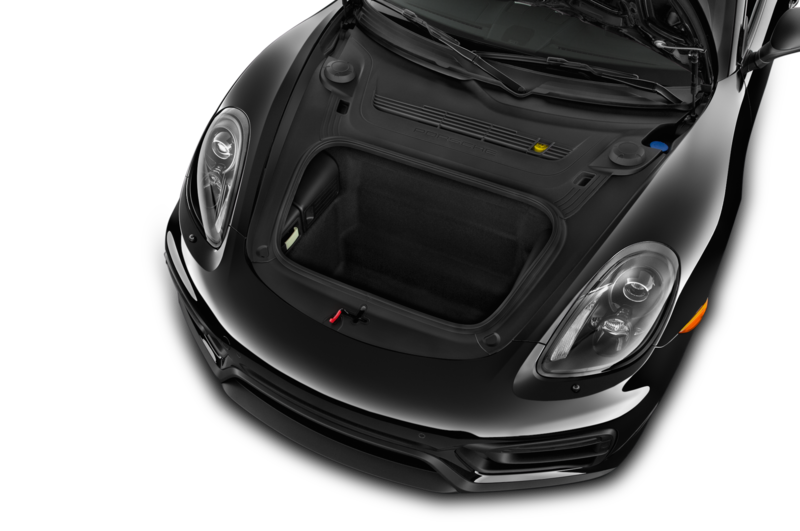 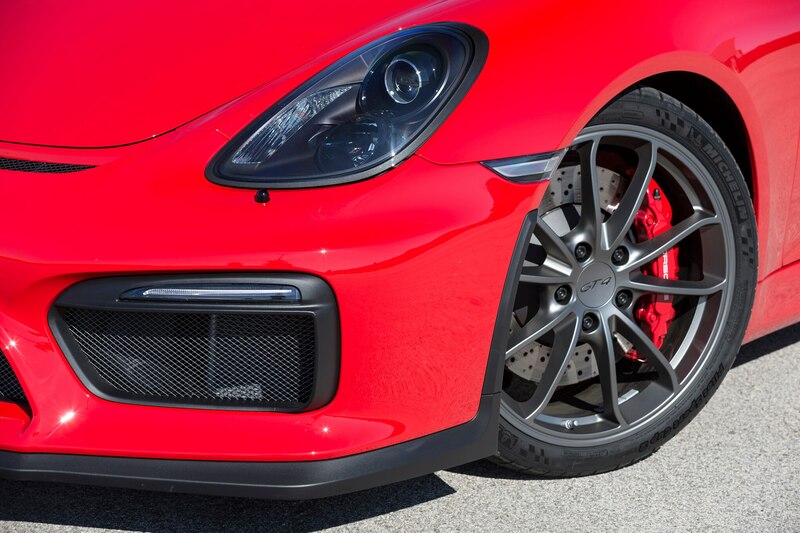 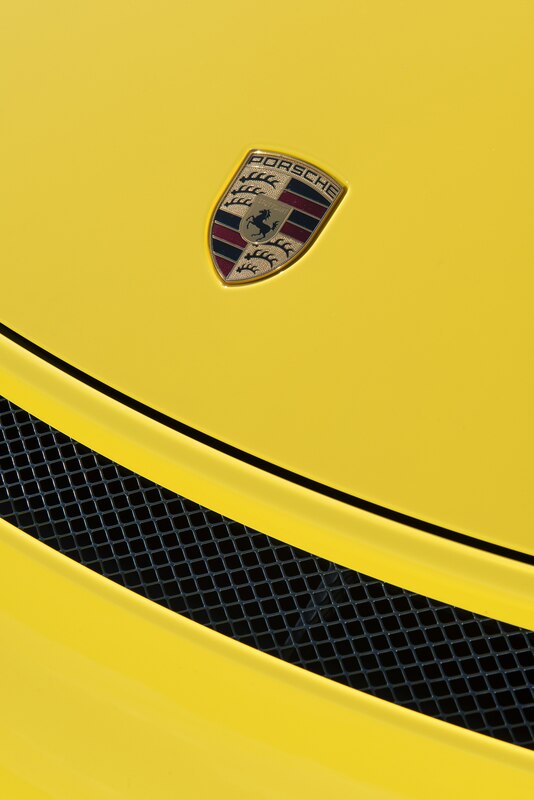 It gets the 385-horsepower naturally aspirated engine of the outgoing 911 S and the front end (badass splitter, etc.) 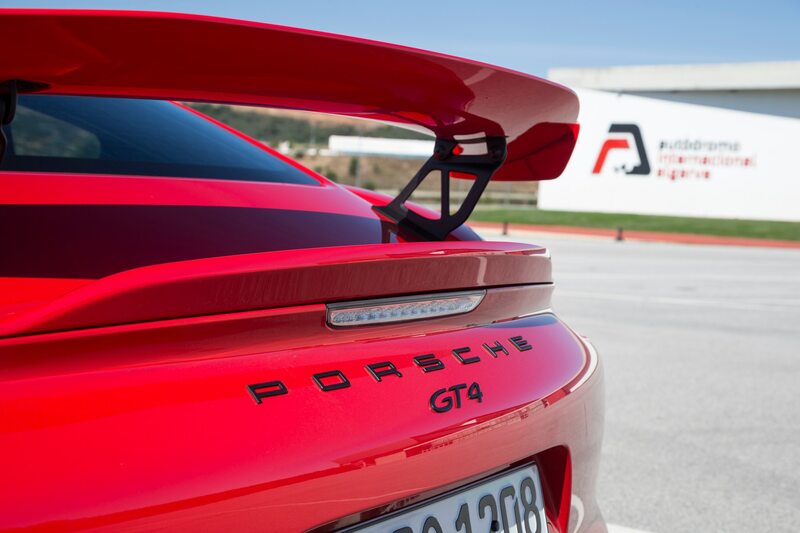 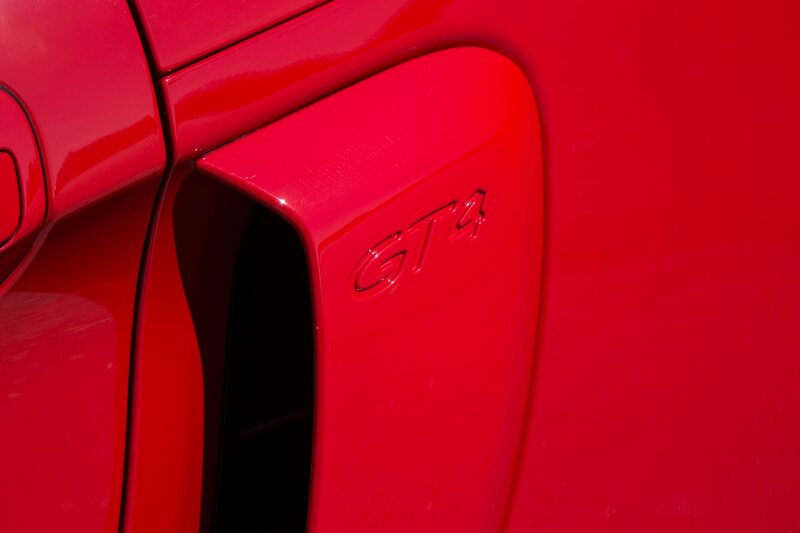 of the GT3. 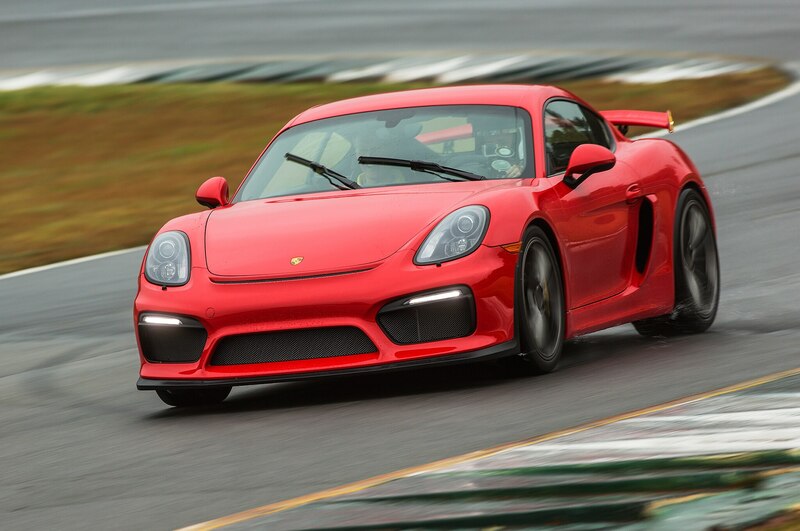 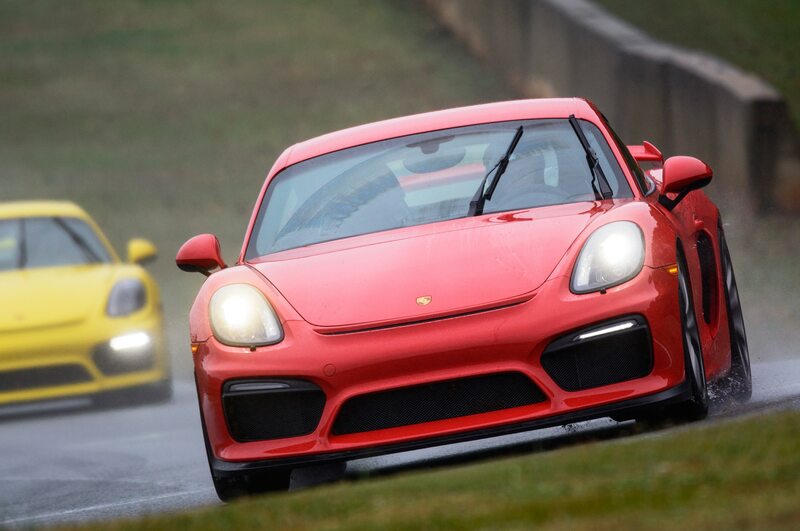 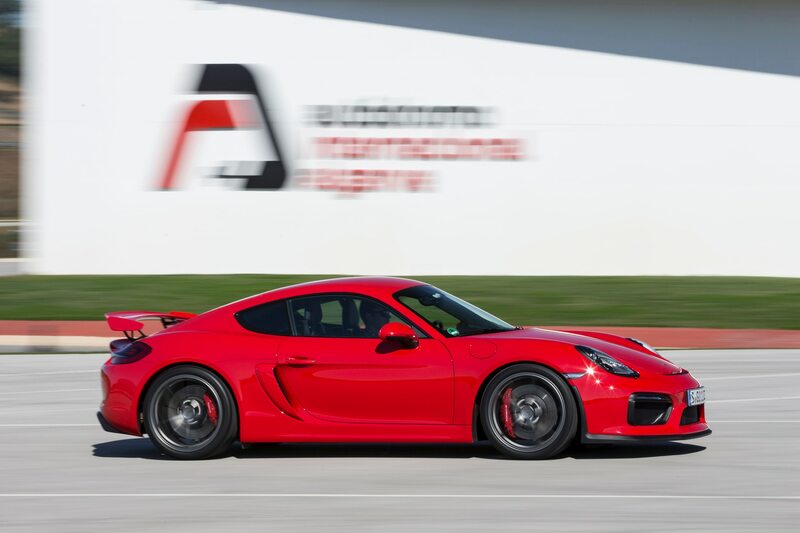 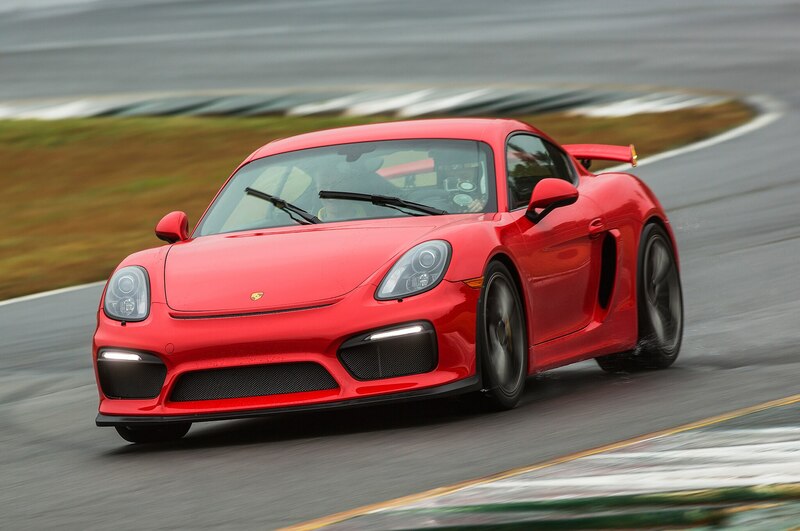 The GT4 will be the basis of a single-make Porsche Club of America racing series. 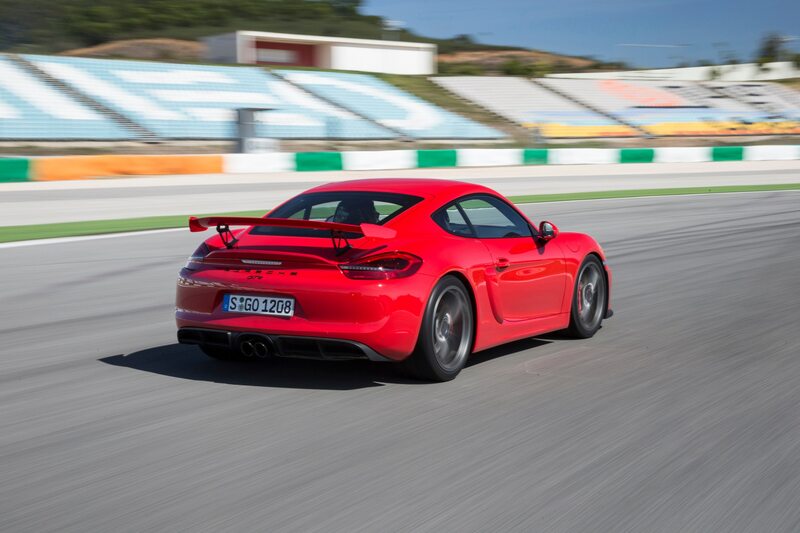 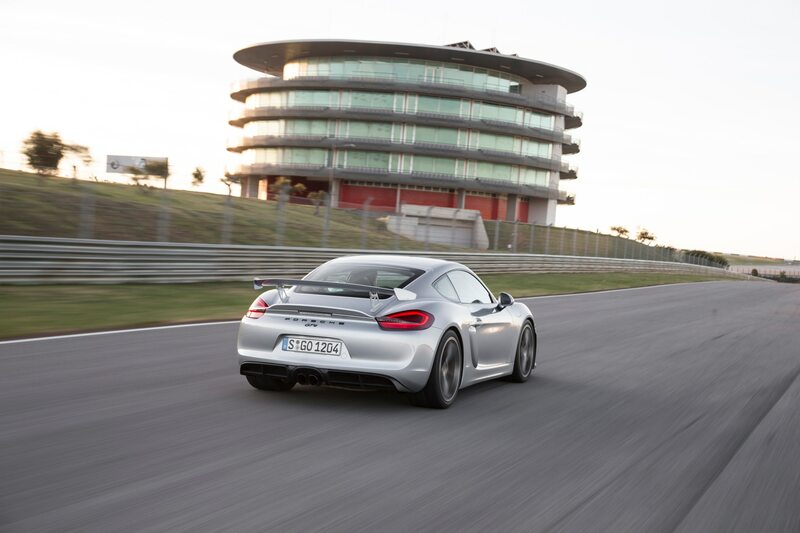 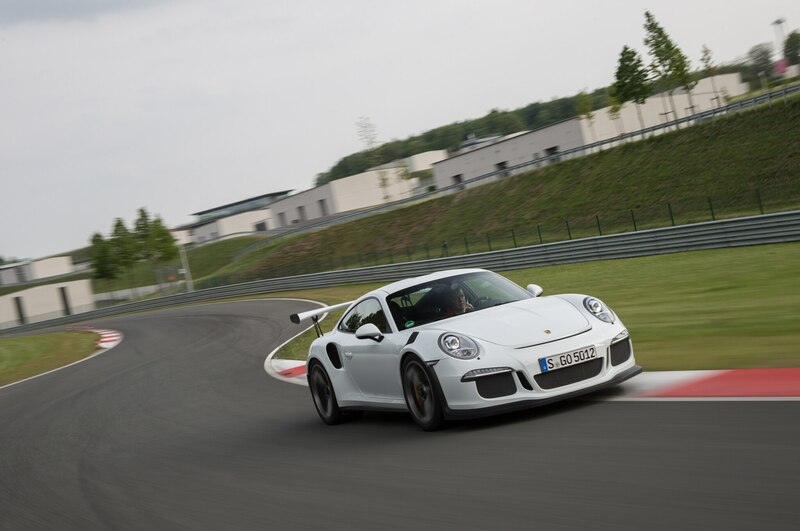 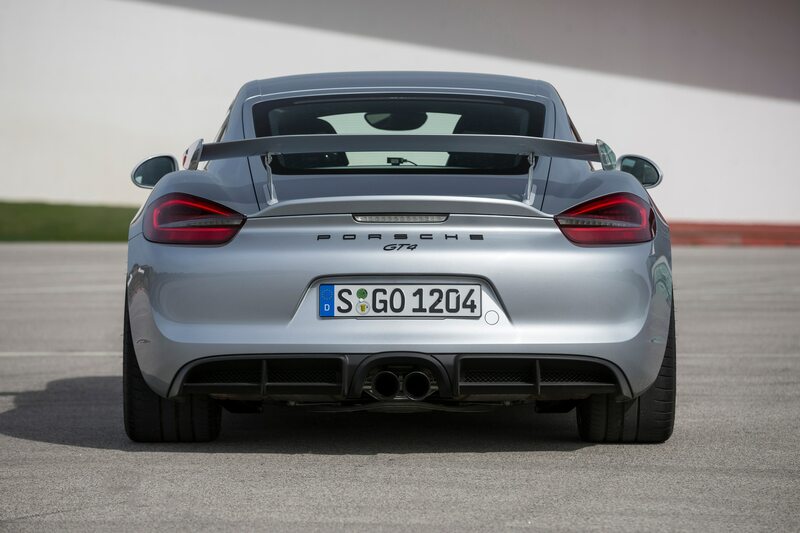 But even in stock form, it’s already as quick on most tracks as a 911 GTS. 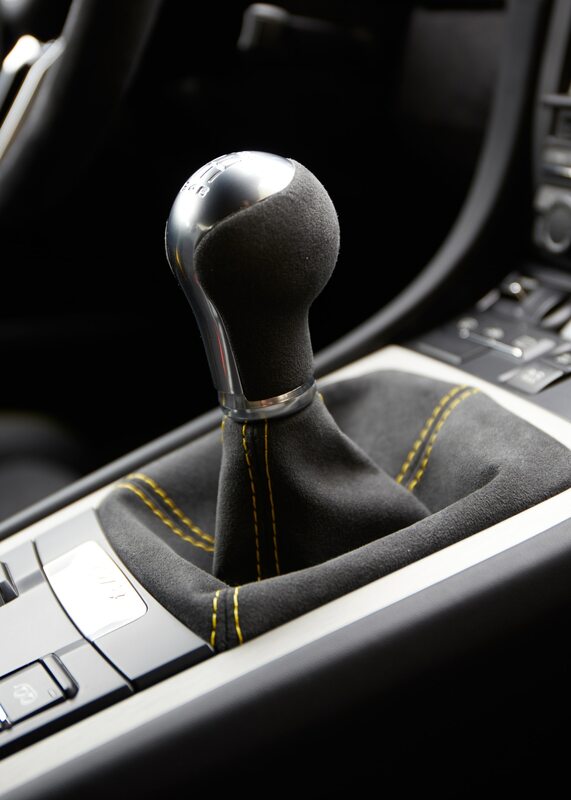 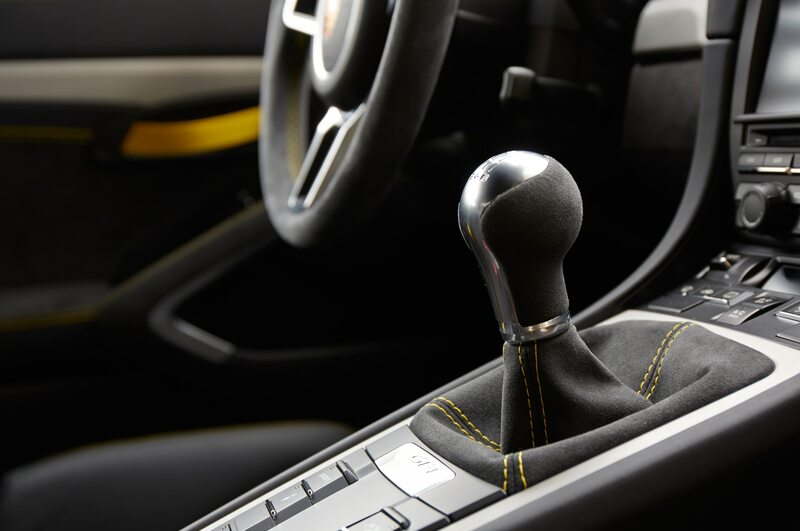 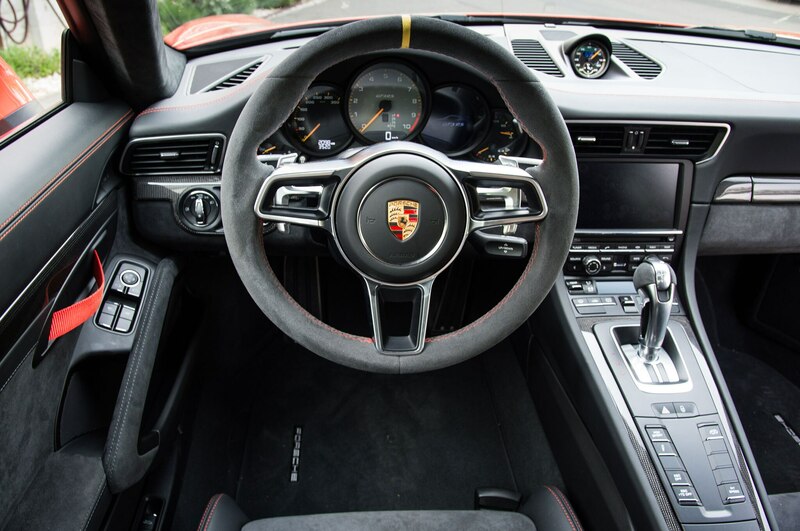 Still, what makes the car such a pleasure to drive are touches such as a manual gearbox that automatically blips the throttle for downshifts and handling that professional racer David Donohue likens to early 911s, when Porsche was renowned for purity and lightness rather than power and technology. 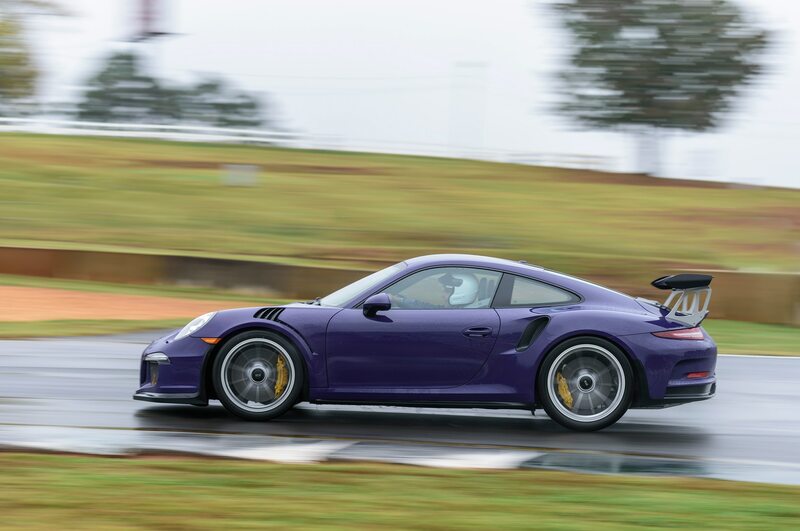 “The car makes you look like a hero,” he says. 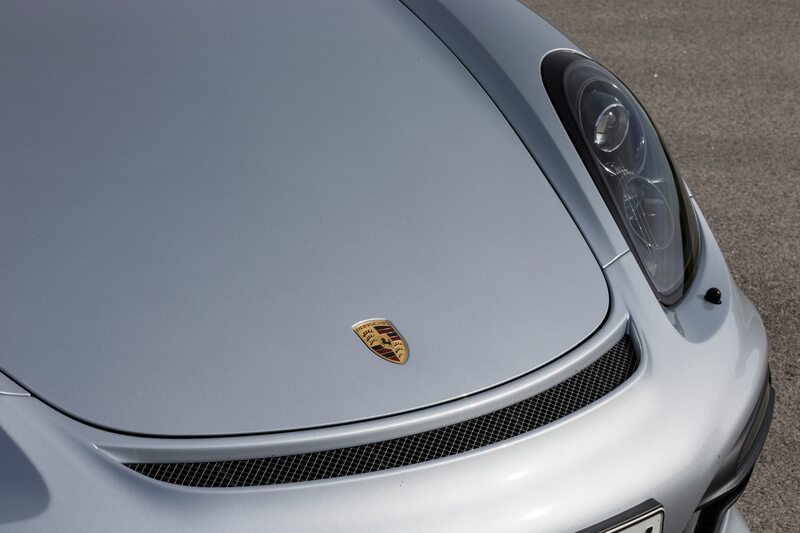 It will also help you stand out from the crowd. 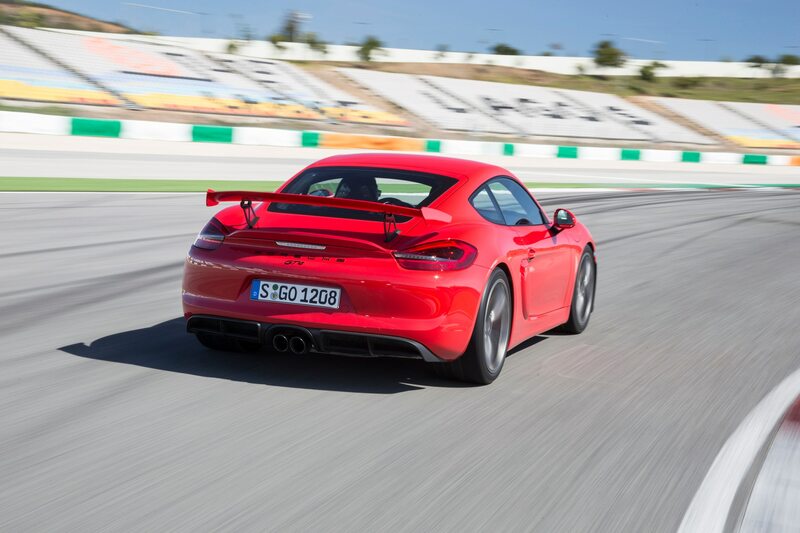 Which is just the way Porsche likes it.